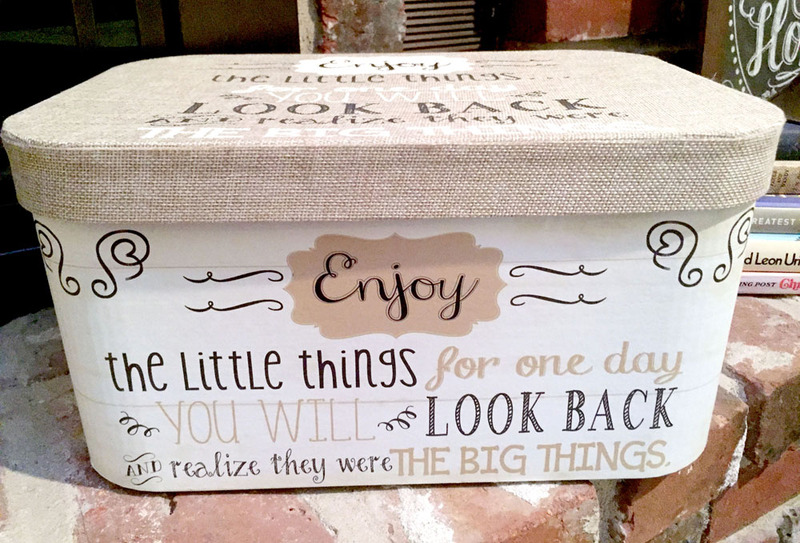 I love a good excuse for crafting. With my busy schedule, I feel like I never have a reason to make fun things. So when an opportunity arises, I jump on it. I recently got engaged to be married, and I could not pass up the opportunity to make some sentimental gifts for my immediate family members, who have always known they’d be included in our wedding. 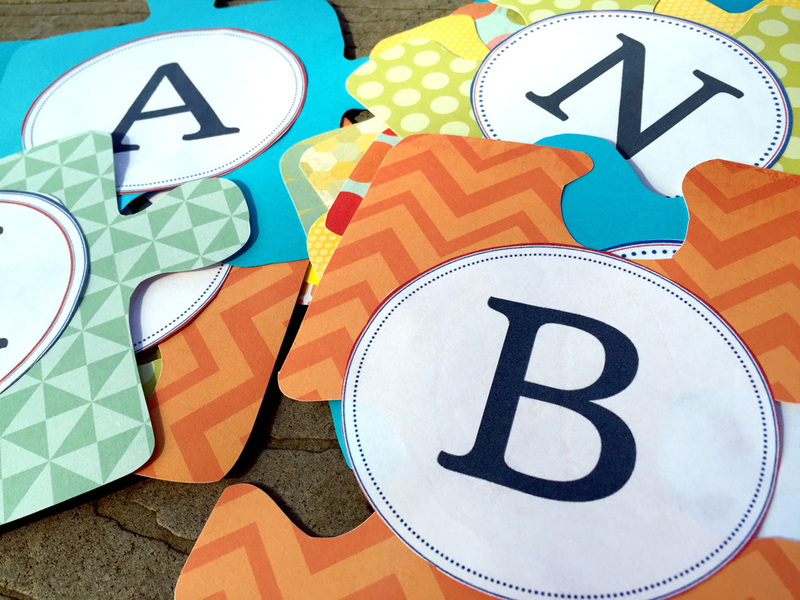 Backtracking a few years, Eileen and Ash decided to announce their first pregnancy with a surprise photo puzzle. We all love puzzles and thought nothing of being given a puzzle to complete. Totally clueless, we worked on the puzzle and were completely surprised and excited when we figured out it was a pregnancy announcement for our sweet little nephew. Fast forward to present day, our nephew just loves completing jigsaw puzzles. He assembles 100-piece puzzles with ease and a lot of excitement, shocking the adults around him. If the puzzle has numbers or letters, he recites each, one-by-one. 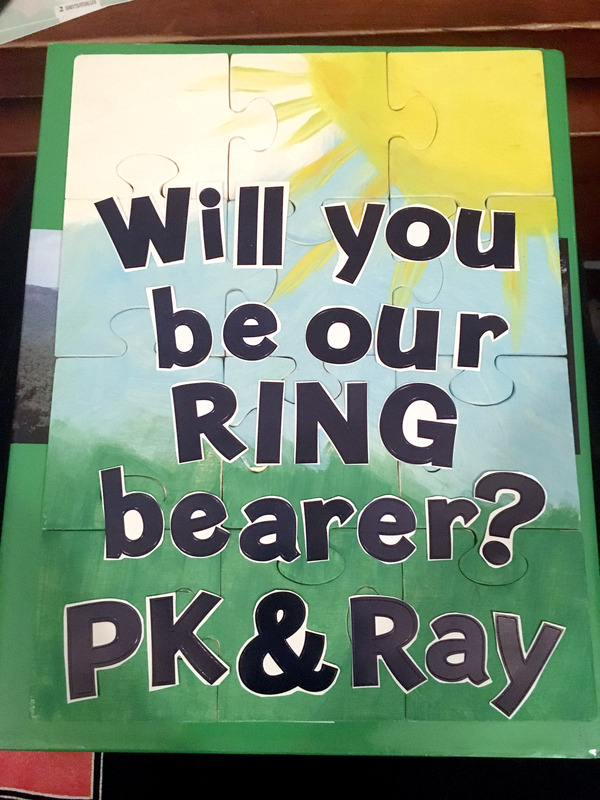 It’s endearing and sweet and helped us decide exactly what we wanted to do to ask him to be our ring bearer – with a custom jigsaw puzzle! 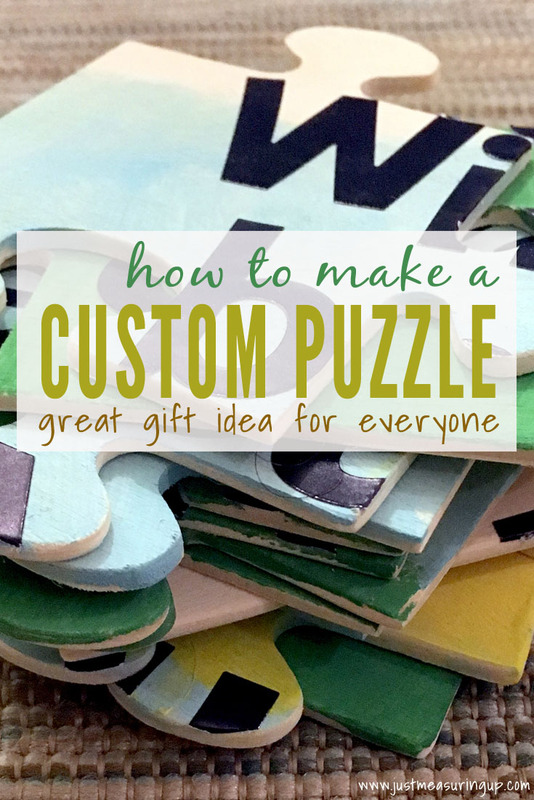 I looked at various DIY puzzle products and wandered around the craft store for quite some time to decide on the best materials. 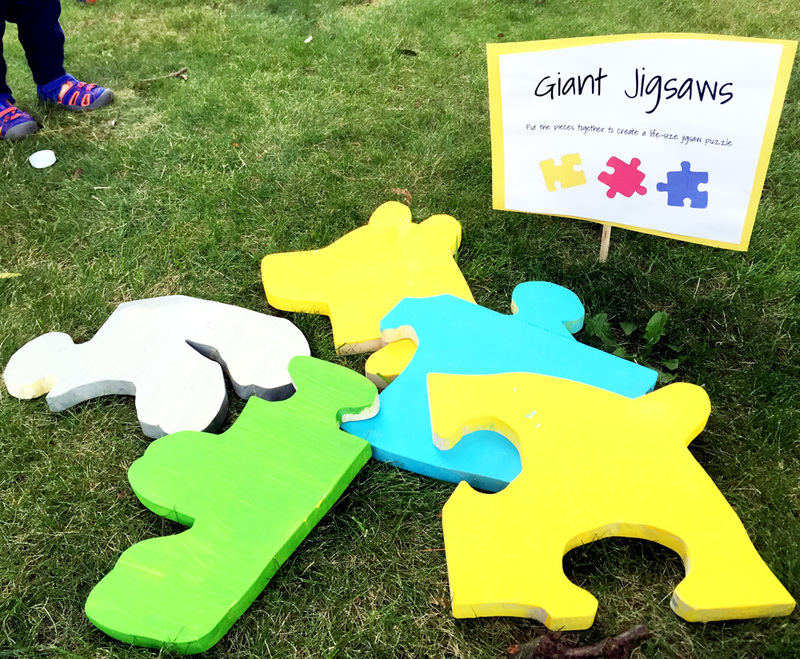 Then I found a pack of 9 plain, wooden puzzle pieces that were 2.5 inches – ready to decorate! I grabbed two just in case and went looking for some letter stickers. I decided on stickers from the scrapbooking section, about 1.25″ in height, in a very dark navy blue so they would be in a good contrast with whatever I decided to paint behind the letters. 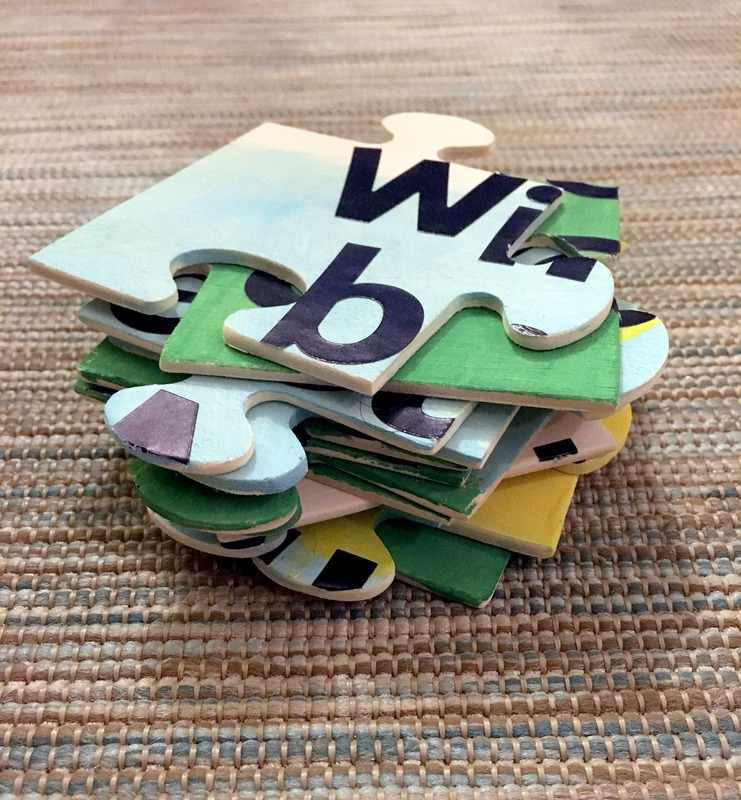 I anxiously assembled the puzzle pieces and was pleasantly surprised at how well they fit together out of the package. 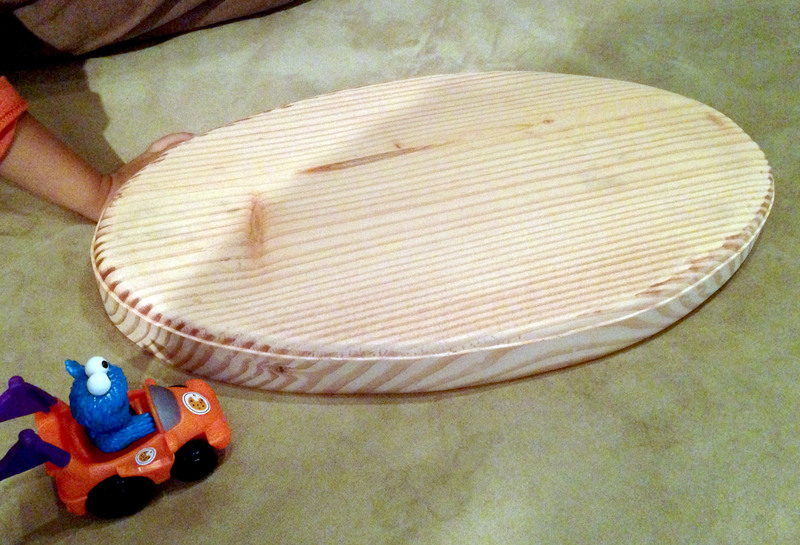 A few were snug but I knew I wanted to sand them down to be safer for my nephew’s hands. 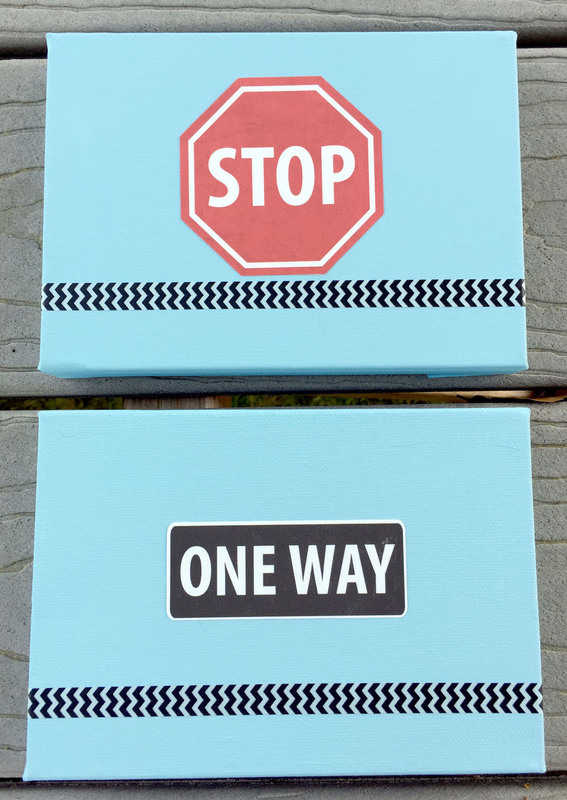 I also couldn’t wait to test out the letters, so I cut out each letter of our intended message to place over the square puzzle before getting the sandpaper. I ran out of lowercase Rs, but I improvised. As awesome as I thought it looked, it was really missing the personalization of all of our names! Then I remembered I got a second set and I could easily add one more row of pieces. So, I combined the two sets to make a larger puzzle. 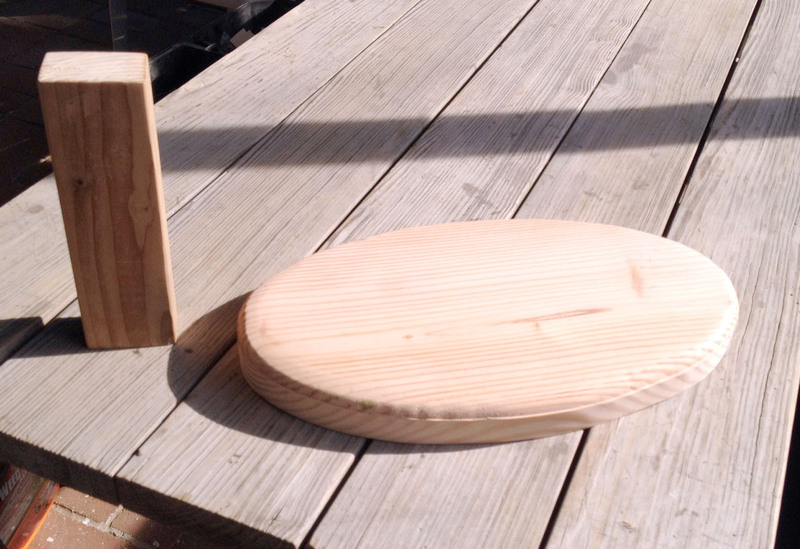 These new pieces were not as easy to fit with the rest, but I was ready to get sanding! I grabbed a sheet of sandpaper and smoothed each side and divet until each piece fit well with its adjacent piece and made sure each pair worked well whichever one was placed in on top. While working on the letters, I decided to paint a landscape of a grassy hill on the pieces, just like our ceremony venue! I gathered my painting supplies and assembled the now 12-piece puzzle on a few layers of newspaper. Then, I painted a cartoonish outdoor scene with colors overlapping the puzzle pieces so each looked unique. I made sure to paint lightly to avoid getting excess paint in between the pieces. It was quick-drying acrylic paint, but I let it dry overnight before placing the stickers. Next, I took the pieces apart and sanded some of the pieces again as needed for one final run before placing the stickers. I cut more of the excess white off the back of each sticker for a better idea of the background before calling it a finished picture. Ready to go, I grabbed a book slightly larger than the puzzle for easy transport later. Then I pulled off the backing of the first letter and not entirely to my surprise, the outline was much thicker than I thought. I immediately pushed all of the letters closer to the center of their row then placed the first letter more to the right than planned. After adding the letters, I placed another hardcover book on top and put the two books on a table puzzle-side down. For good measure, I added another stack of books on top and let it sit overnight. 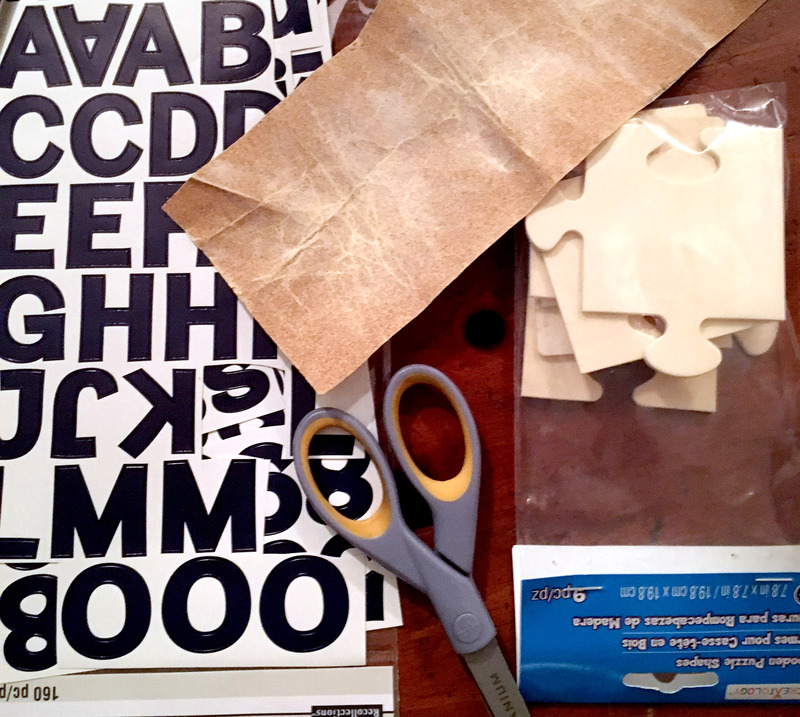 Next, I grabbed an x-acto knife to carefully slice the stickers between puzzle pieces. 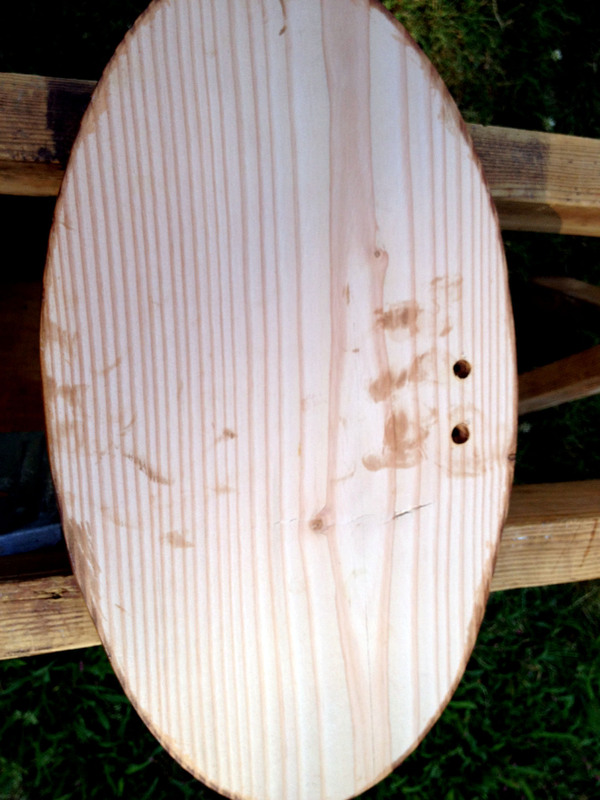 This was a daunting task, but I was very happy at the level of sanding I had done. I originally thought I would have to turn the puzzle over and run through each, but it was not necessary! To secure it once more, I put the pieces unassembled under a stack of books again. I left it for a day while I decided how to box up these pieces! 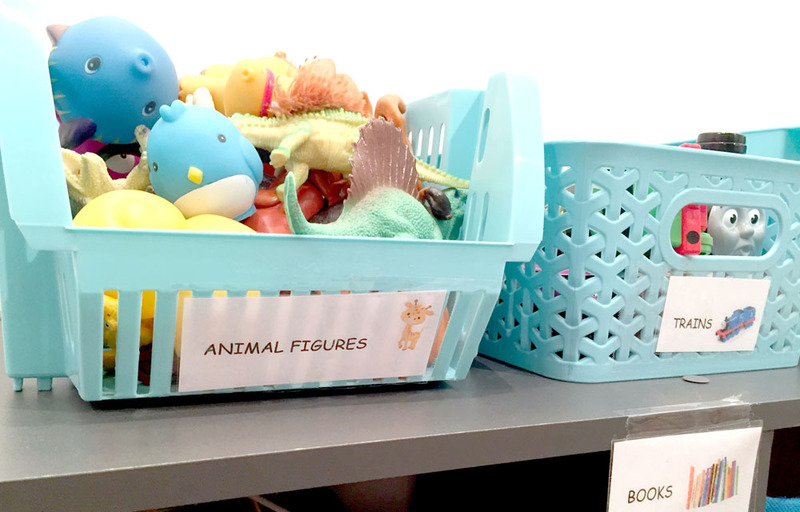 When deciding what kind of birthday party to have for our toddler, I was stumped. He wasn’t really into too many cartoon characters. 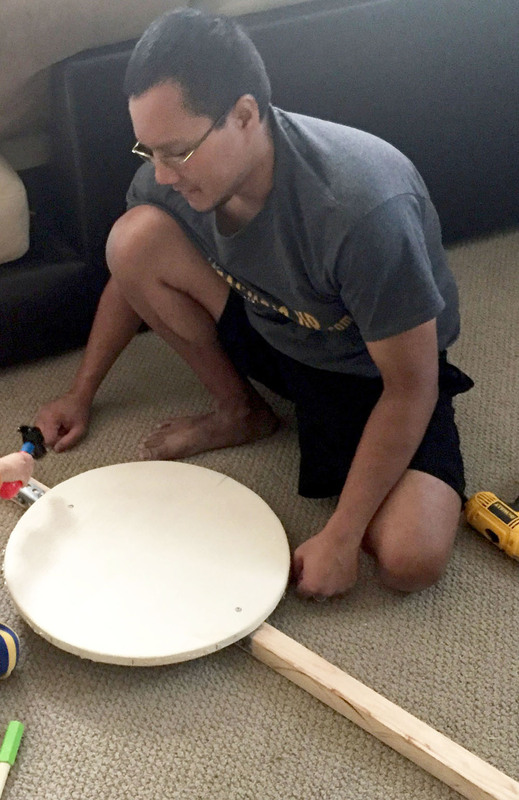 He did enjoy tools, dinosaurs, and building – but none were a huge interest right now. I started to think about how he spent most of his playtime and realized how often he gravitated toward puzzles. 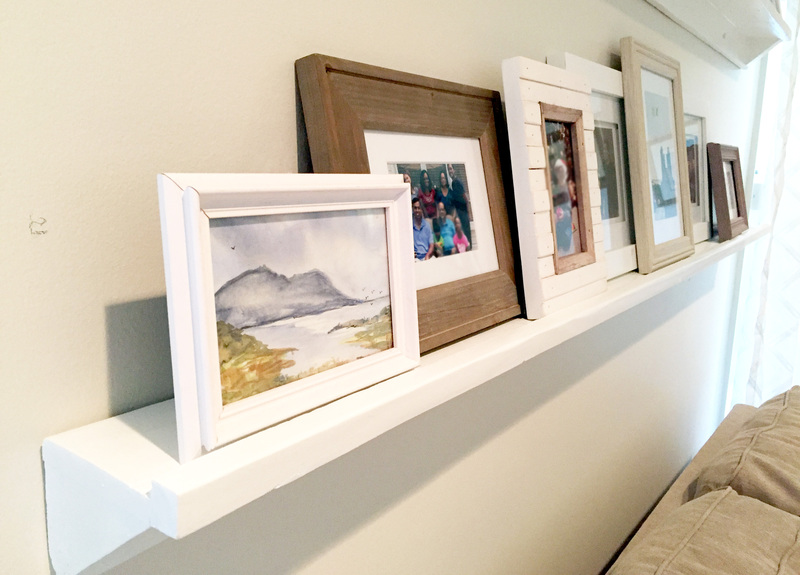 He enjoyed putting things together, he relished in accomplishment when completing a puzzle, and he loved staring at the pictures he put together. There weren’t too many ideas on Pinterest or google for puzzle parties, which was great because I got to start with a blank canvas. Sometimes there are too many ideas out there, and it gets so overwhelming. 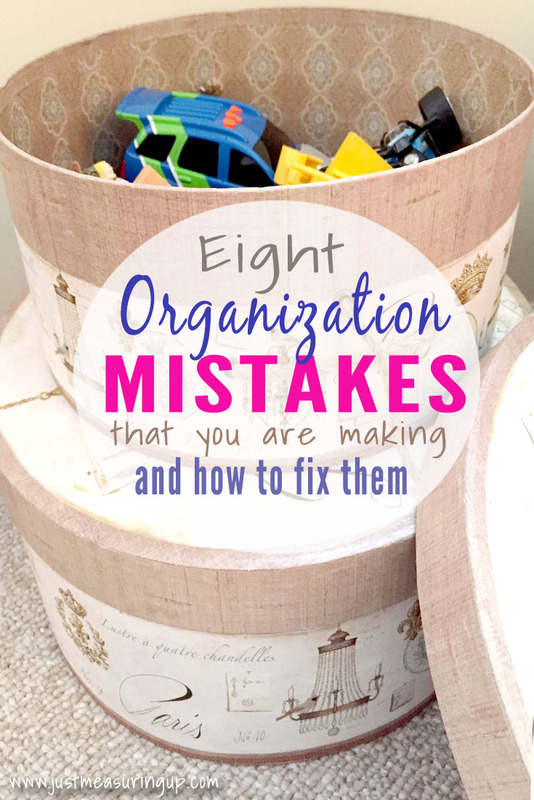 Now usually I’m a super crazy organizer and planner, but I have to be completely honest and say that I didn’t start planning this party months or even weeks ahead of time. I was super behind and quite a bit pregnant, so the entire party came together in just a week and a half. However, I took my own party planning advice and kept everything extremely simple. 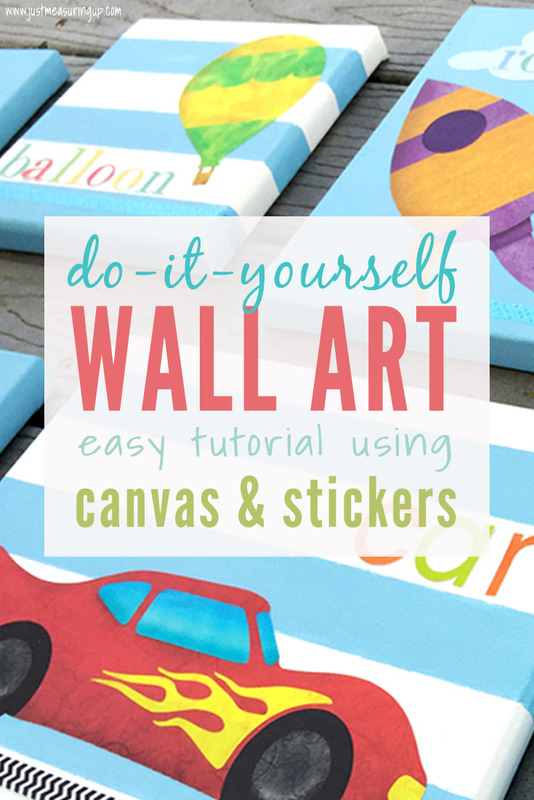 I also created printables each step of the way, so I can easily share them with you! My favorite part of every party is working on the decorations because you can take one little idea and run with it. 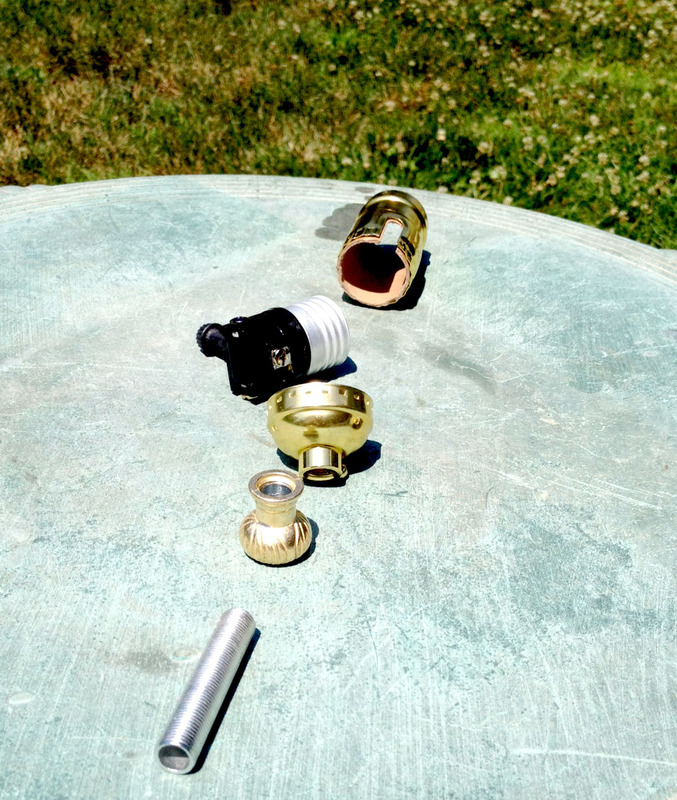 To your guests, it will look like you went overboard, when really you are using the same item over and over. 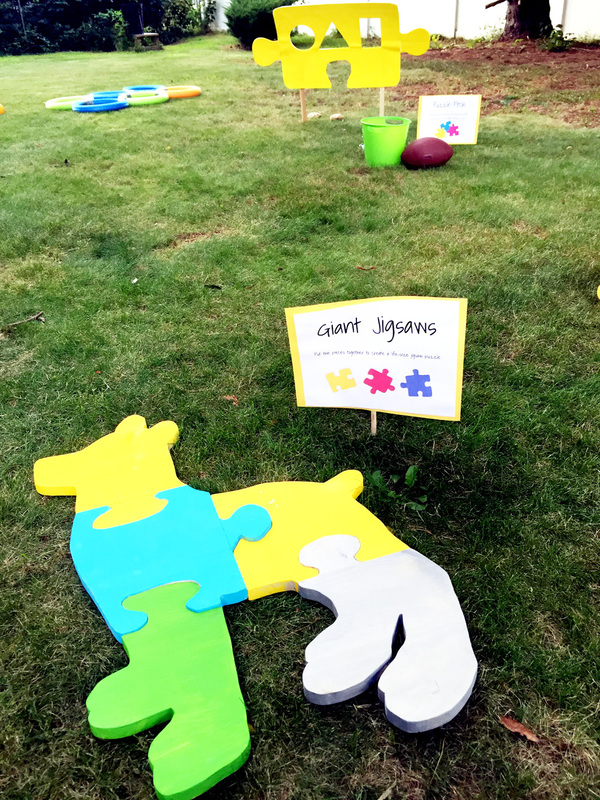 Since the theme of the party was puzzles, I just cut a bazillion puzzle pieces out – and used them everywhere. (I have puzzle piece cut-outs in our free resource library in two different sizes, so you can efficiently use your paper). I used large puzzle pieces for the birthday banners. Then, I cut medium-sized ones out of card stock (I love using bright color colored card stock.) With the medium sized pieces, I decorated the goody bags, labeled the food, made puzzle banners, and decorated the balloons. 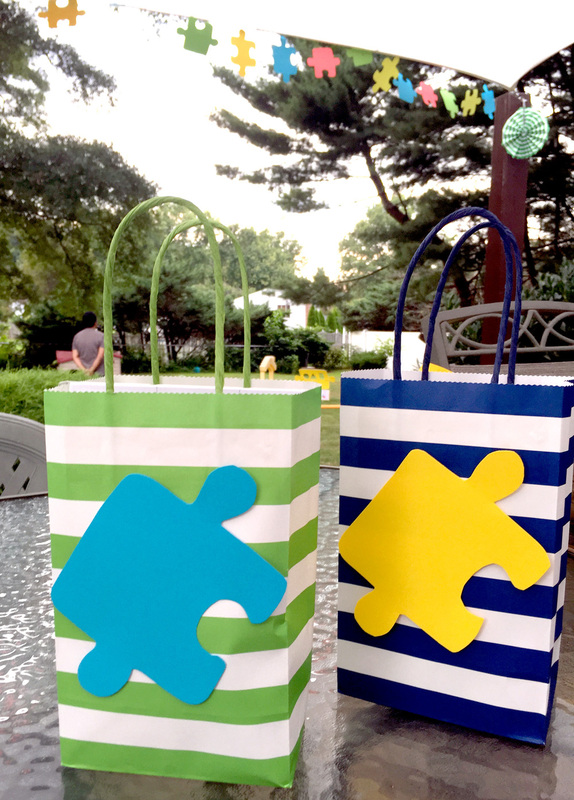 I found the cute striped paper bags at Michaels and used my 40% coupon – then I simple taped a puzzle piece on. Simple and pretty, right!? What’s inside the goody bags? Inside the goody bags, I included blank puzzles (gotta love Amazon!) 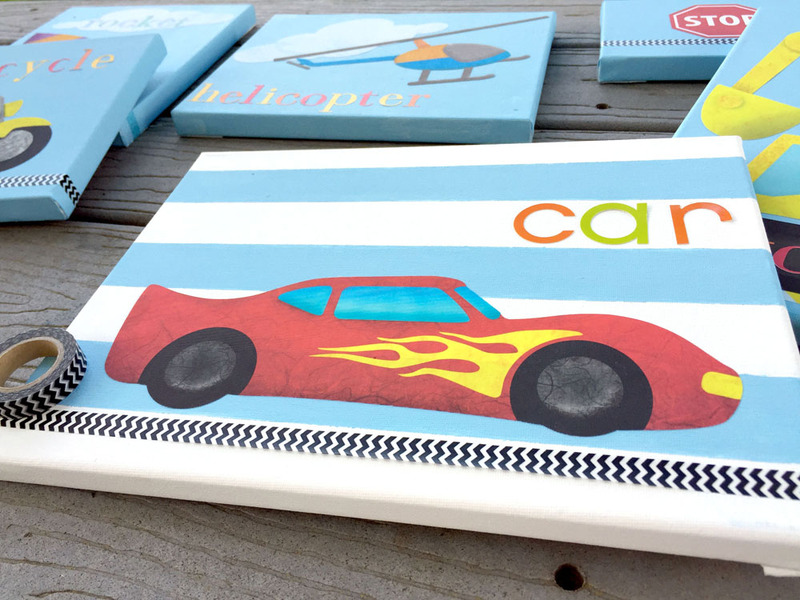 with crayons or markers, depending upon the age of the party guest. I also put in small wooden puzzles that I found at the dollar store for the younger kids. For the older kids, I included puzzle pair puzzles that I found at the dollar section of Target. 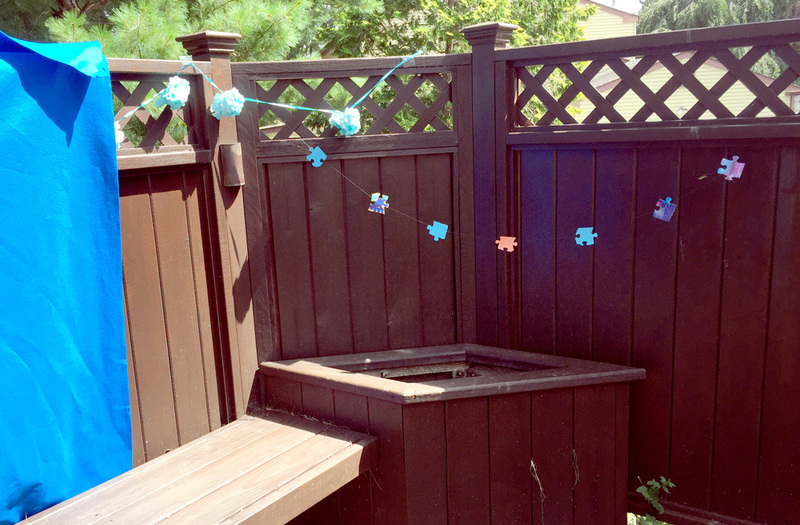 I also threw in some other things – bubbles are always a thrifty yet fun summer choice, and I found a few puzzles-in-a-bag at the craft store too. For the puzzle banners, I simply glued a bunch of puzzle pieces to fishing line and then strung them on our shade sail outside. 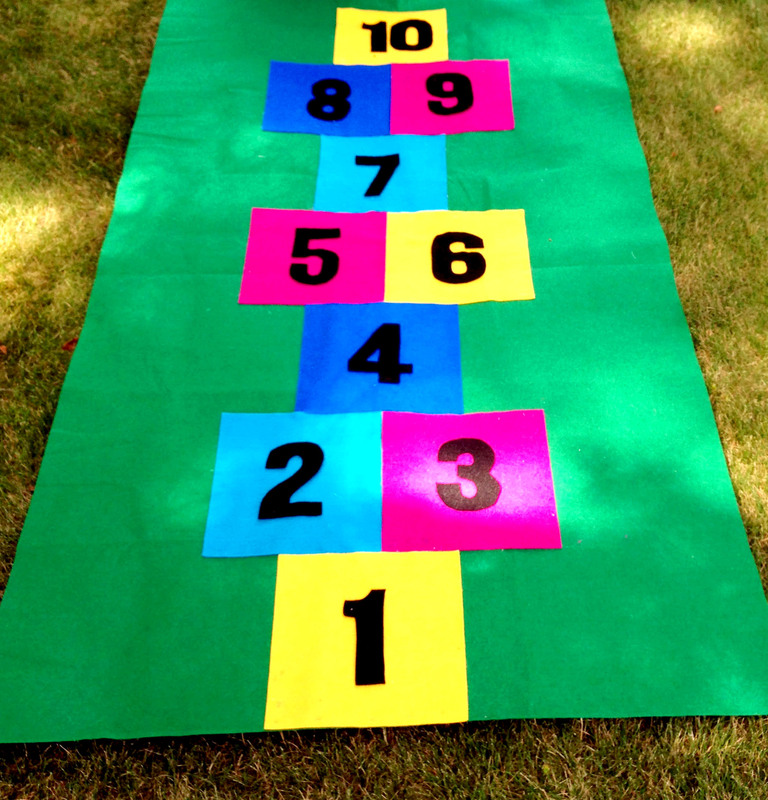 I had my son work with me on counting and patterns as I put the banners together. 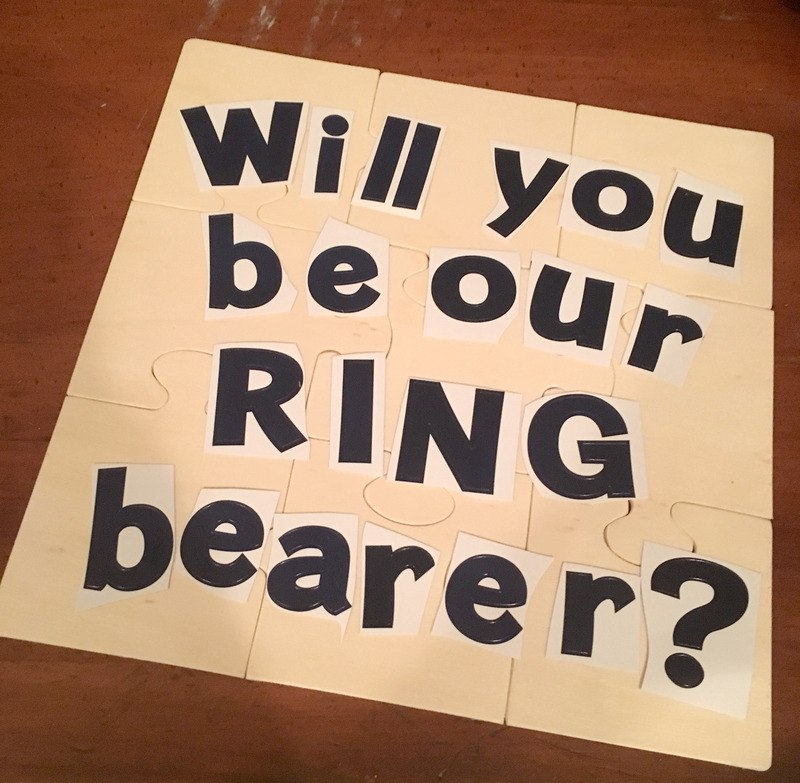 For other decorations, I wanted to use smaller puzzle pieces, but didn’t want to spend the time cutting out such tiny pieces. So, I bought a bunch of dollar store puzzles (24 or 30 pieces seem to provide the best size pieces). I flipped them over and painted the back of the pieces. It helps if the back of the puzzle piece is white and not brown cardboard. 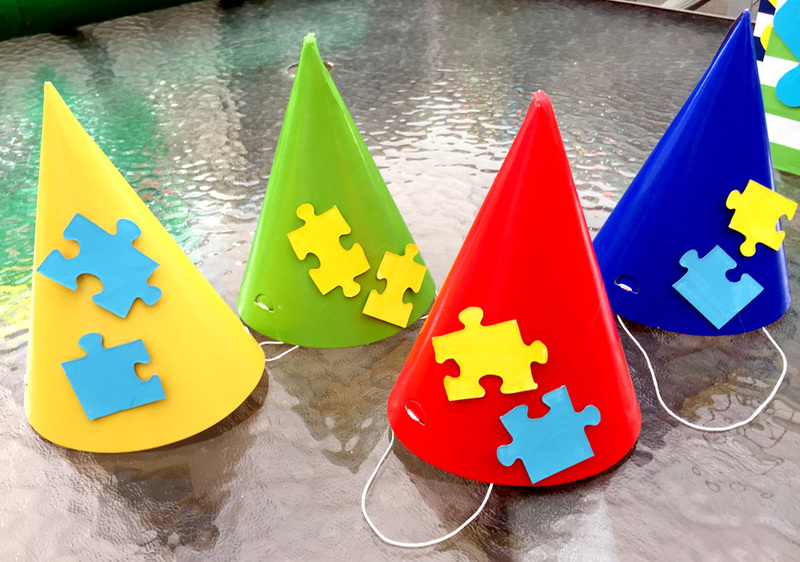 I then used these puzzle pieces to glue to party hats and to our little guy’s “Puzzle Prince” crown, and I even made a few fishing line strings of puzzle pieces to decorate the DIY photo booth. 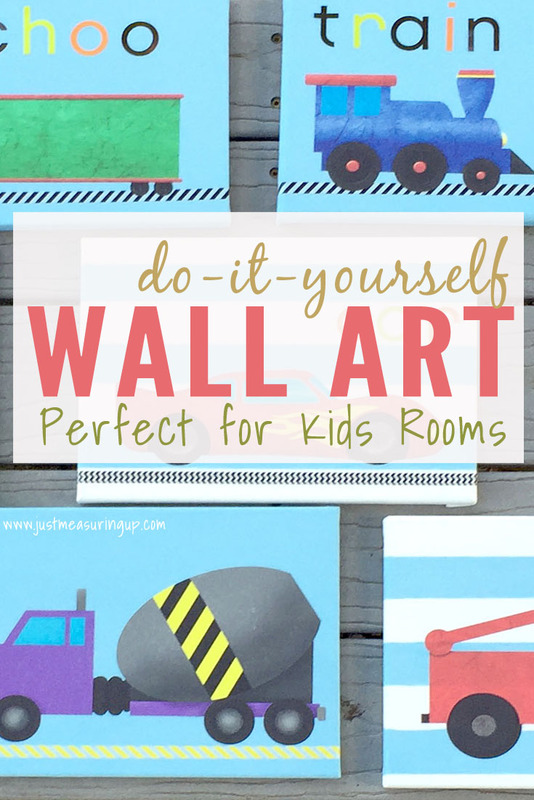 This is a great pre-party activity that kids can help with too! 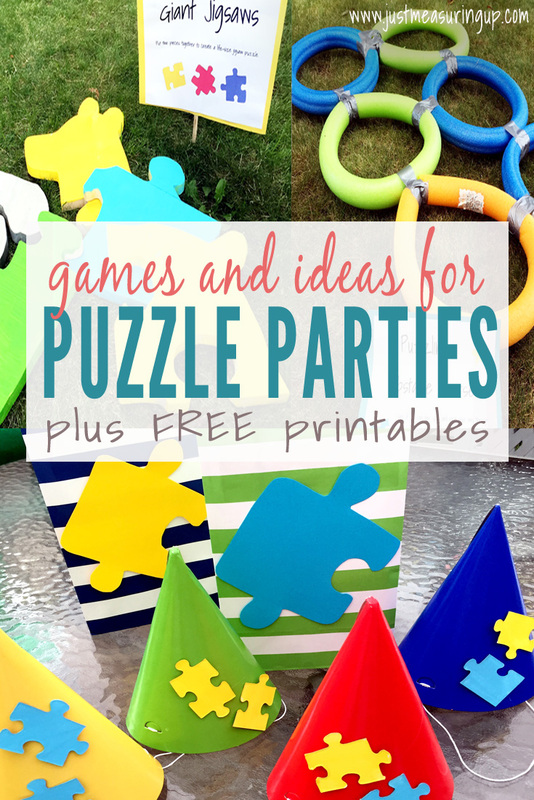 For the little ones, I love having party games that are more like activities or centers. 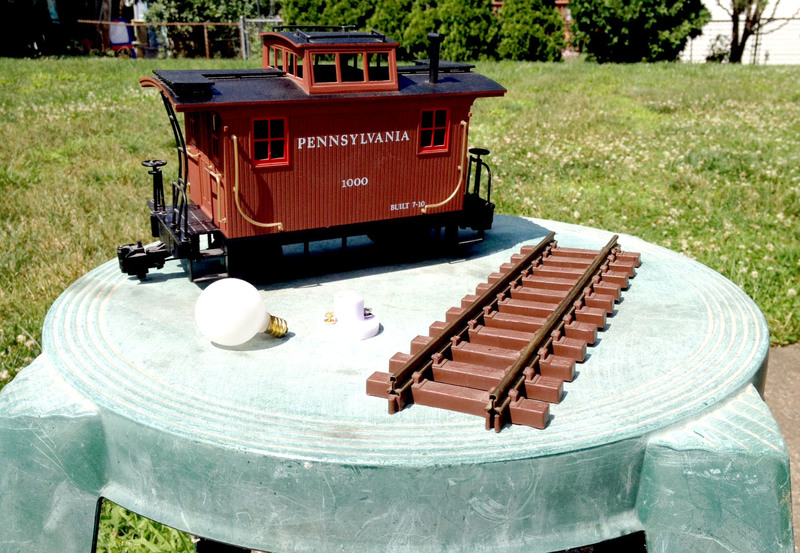 Kids can freely move around and play at the stations – it’s perfect for toddlers and little kids. 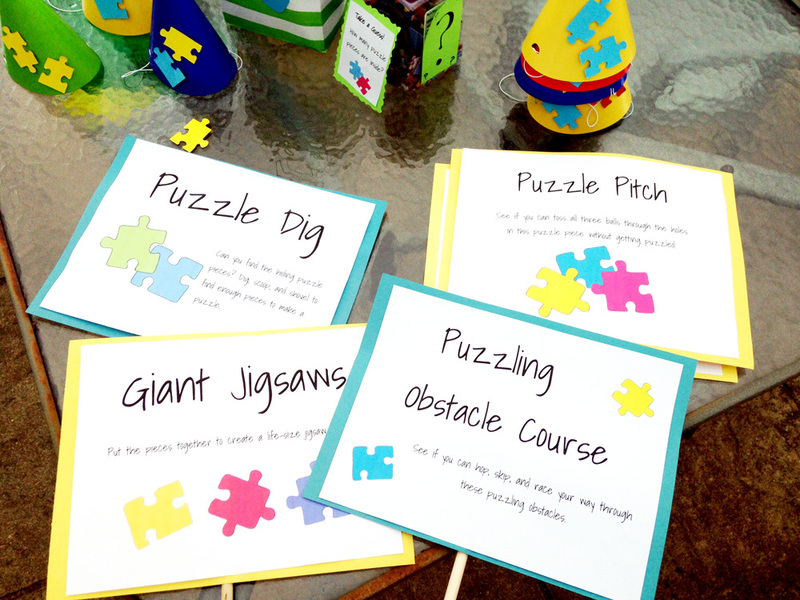 Here’s a list of puzzle party games that I put together, and I have the signs and descriptions available to you in our free resource library. Almost every game was super, super simple, but all together the array of activities was perfect. 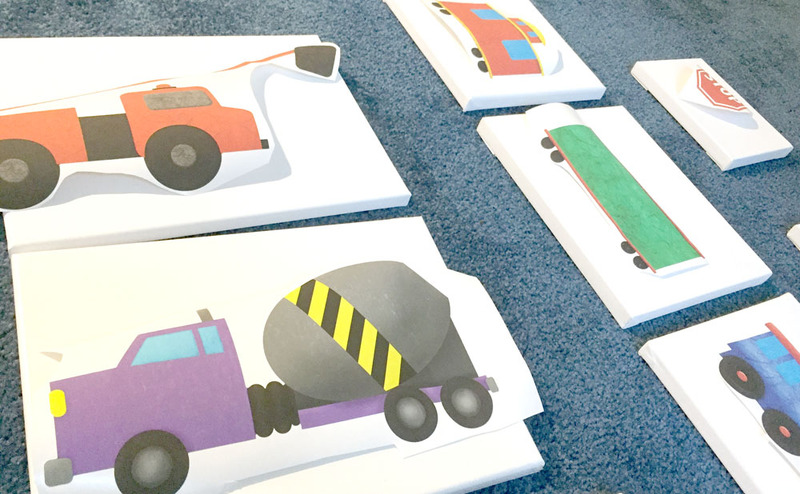 This puzzle party game was simply a “sandbox” with puzzle pieces. I just took an under-bed storage container (with a lid) and filled it up with rice. 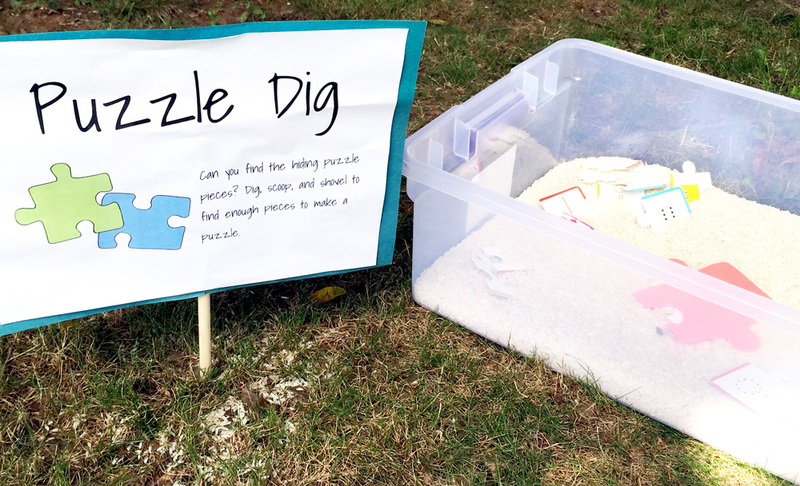 Then, I hid puzzle pieces from the dollar section at Target in the rice and tossed in some scoopers and sand toys from the Dollar Store. This entertained my son for DAYS before the party, and the kids loved it! 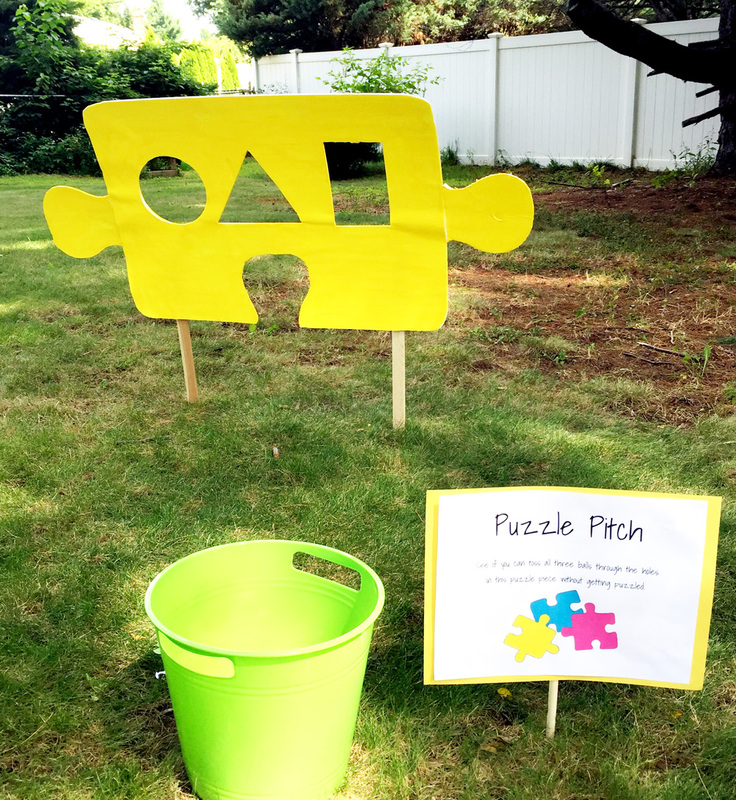 This party activity was simply a ball toss with a puzzle spin on it. I bought two foam boards from the dollar store and drew a huge puzzle piece on them. 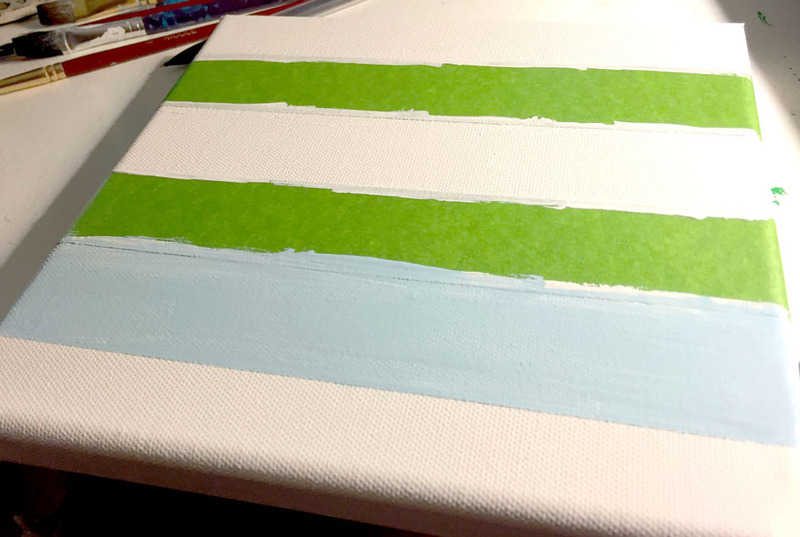 Then, I did a little taping and then painted it with acrylic paints that I had laying around the house. After that, I cut a few holes for the bean bags or balls to go through. 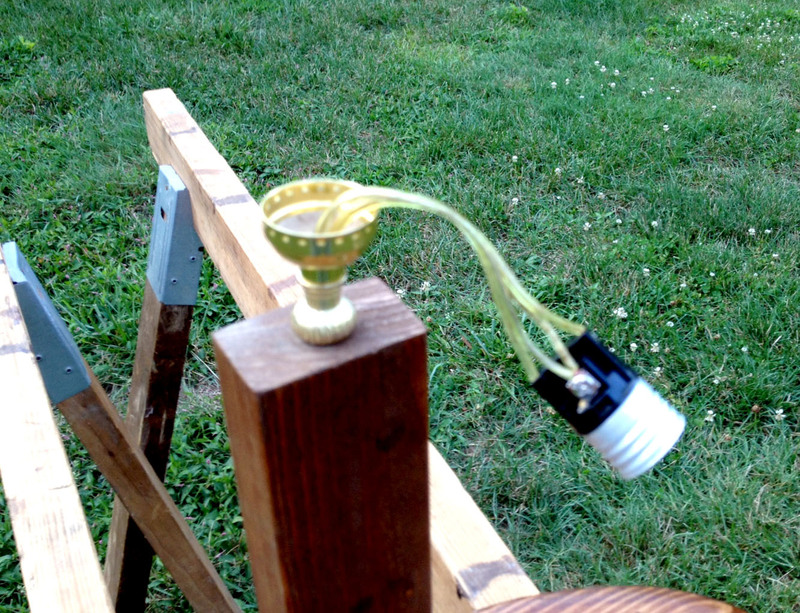 Last, I taped it to wooden dowels, so it would stand firm in the ground. This was another super simple party activity. 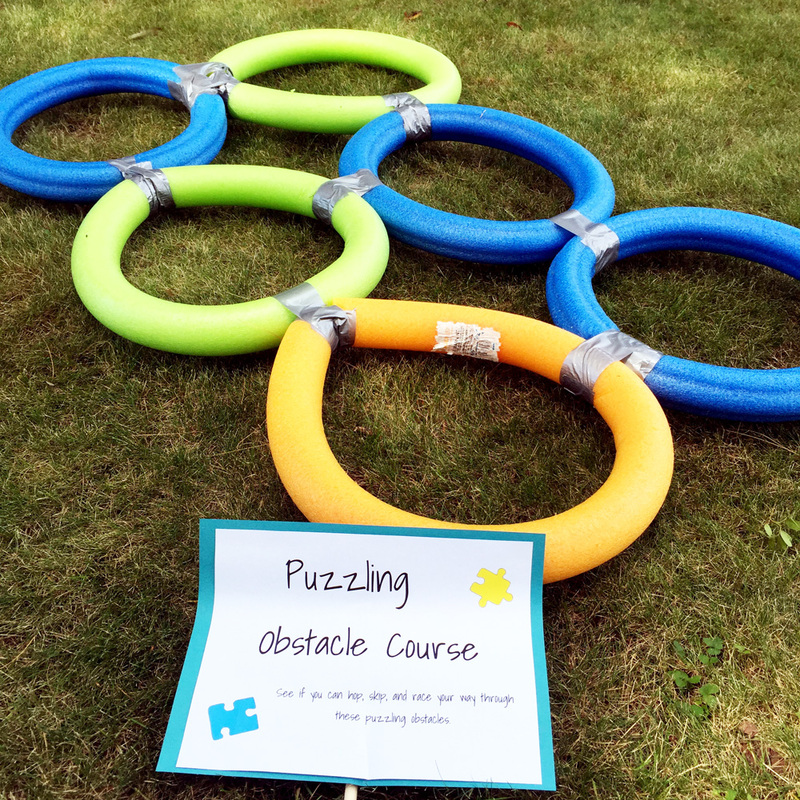 I grabbed six pool noodles (another Dollar store find you can reuse) along with a few cones and threw together an obstacle course suited for little ones. Then, I used duct tape to shape each pool noodle into a circle and then taped the circles together. I spread the cones out to elongate the obstacle course. Also, I put out a few soccer balls, so kids could kick around the cones. This was by far the easiest of the puzzle party games. 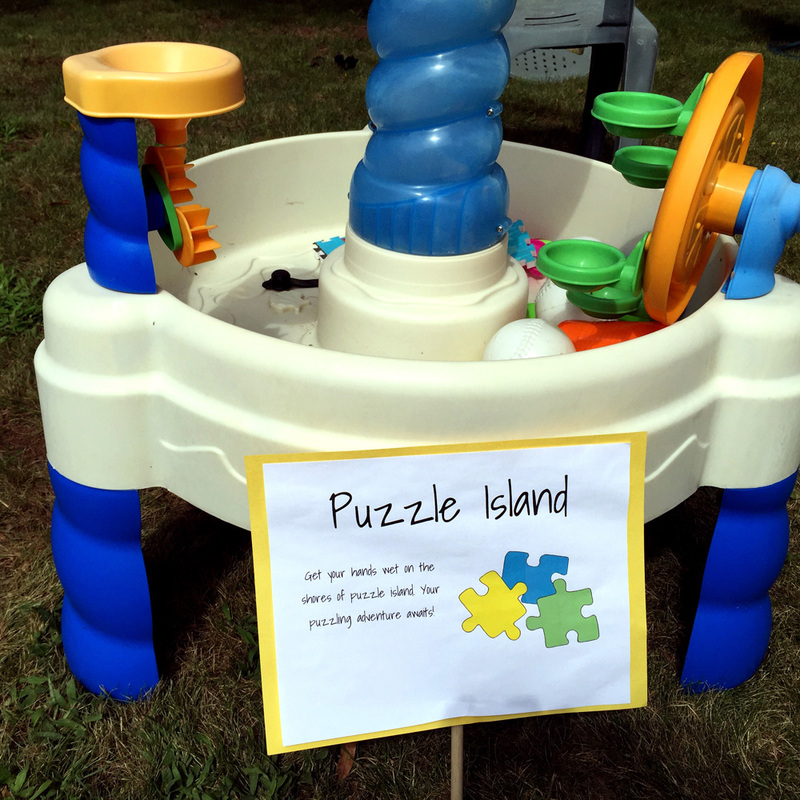 I just filled the water table up and threw in some foam puzzle pieces (yet another dollar store find!). If you are having a backyard toddler or kid party in the warm weather, a water table is the perfect thing to keep kids occupied and entertained. Every year, I’m impressed at how much time the kids spend playing in the water table at our summer parties. 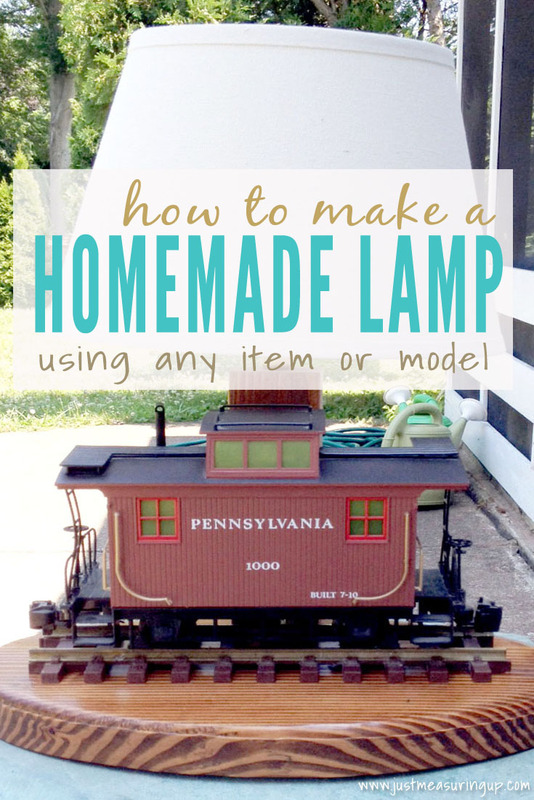 It’s definitely a must-have for easiness and entertainment! This was by far my favorite of the games, and it made our little guy the happiest! 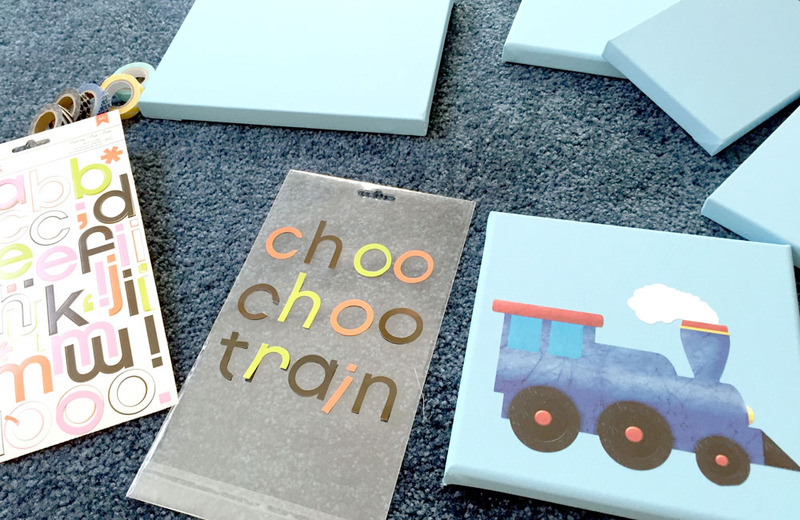 With his love for puzzles, he couldn’t have been more excited that instead of building shelves and painting walls that Mommy and Daddy were building and painting a puzzle for him! 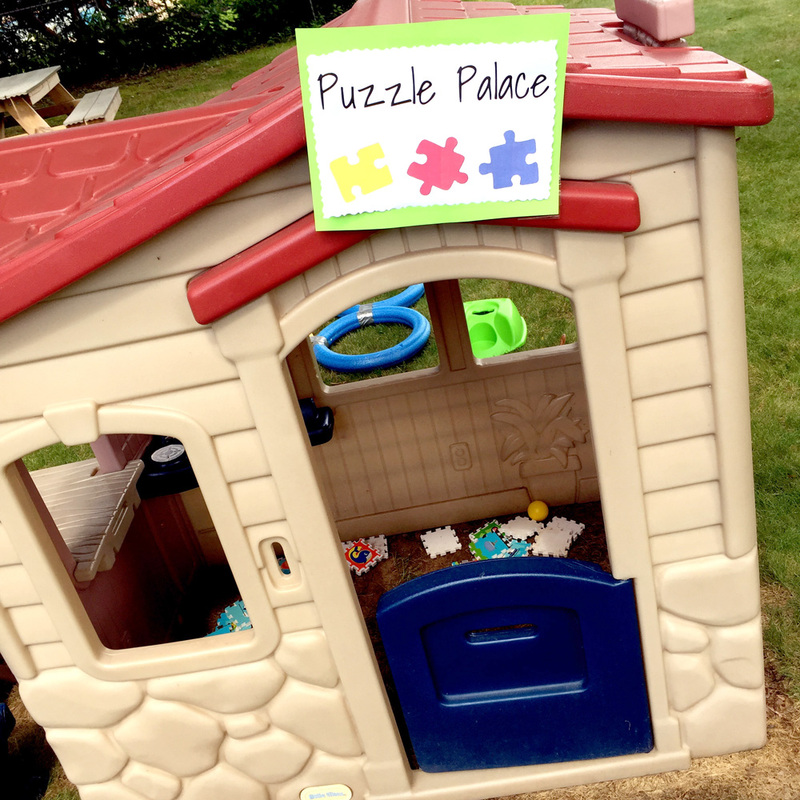 I also placed a Puzzle Palace sign on the little playhouse we have in the yard and tossed some more foam puzzles in the little kitchen area. I was going to add a craft station, where kids could decorate their own puzzle crown, but I figured this age group was a little young for that. 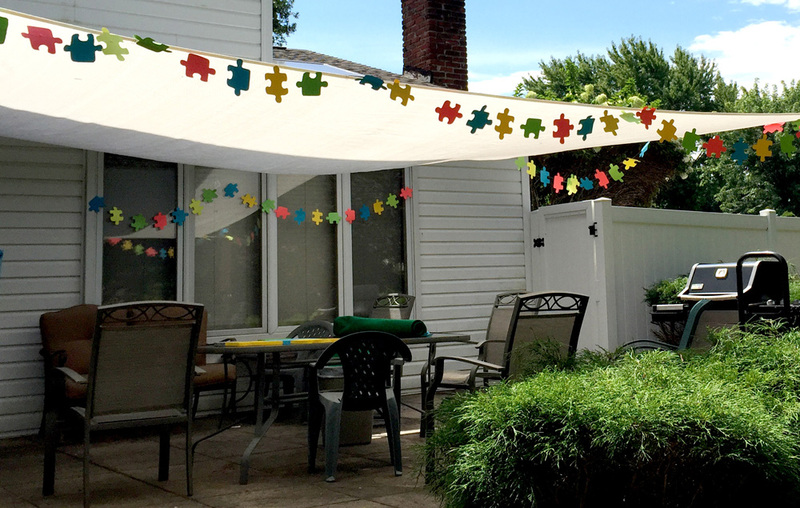 This was the perfect example of how something so simple (hanging a sign and tossing in some puzzle pieces) makes for another cute touch at a child’s birthday party. See, you don’t need to go crazy to throw a great party. 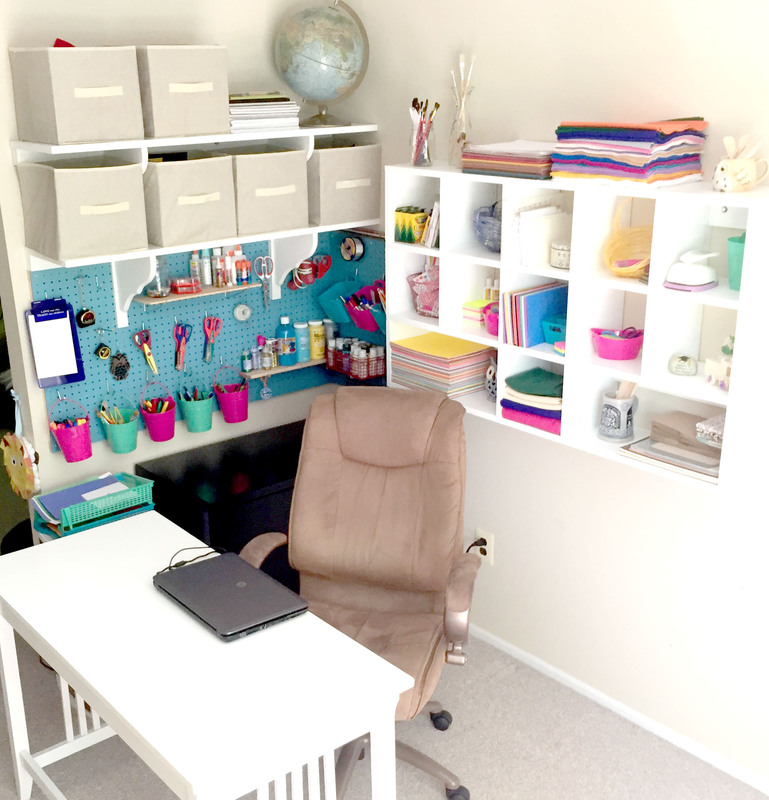 Simple ideas and activities can tie everything together nicely. With Ash and my large immediate families, we always have a decent amount of adults at our little kid parties. 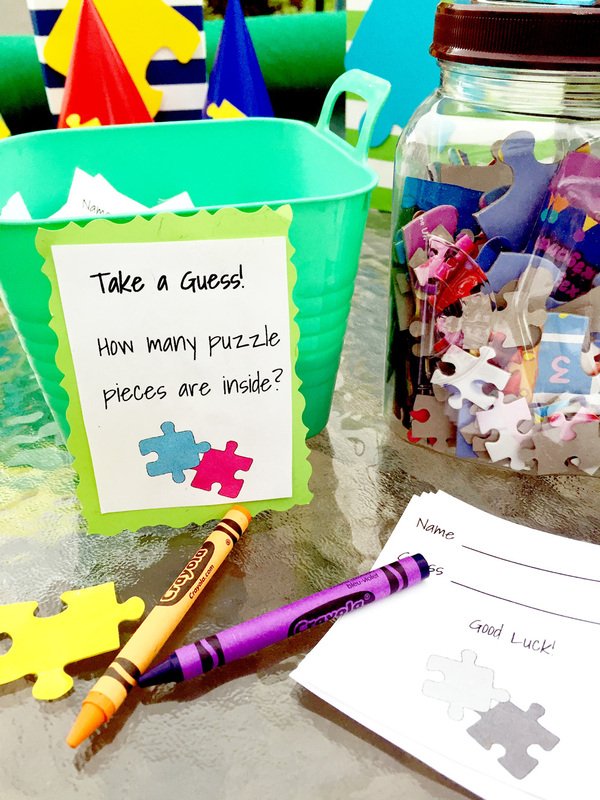 I thought it would be fun to throw a bunch of puzzle pieces in a container and have party attendees guess how many pieces were in the container. 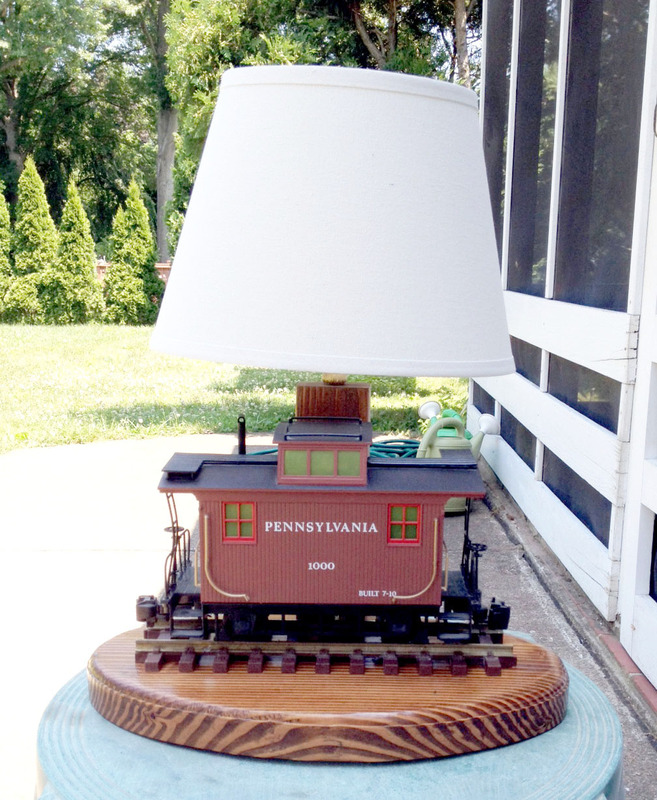 And, of course the prize was…. a puzzle! For every party or small celebration we have, my go-to banner is this simple one that I made – which is available in our free resource library. I love it because it’s easily customizable (no printing extra letters) and you can easily glue the letters to any kind of background. 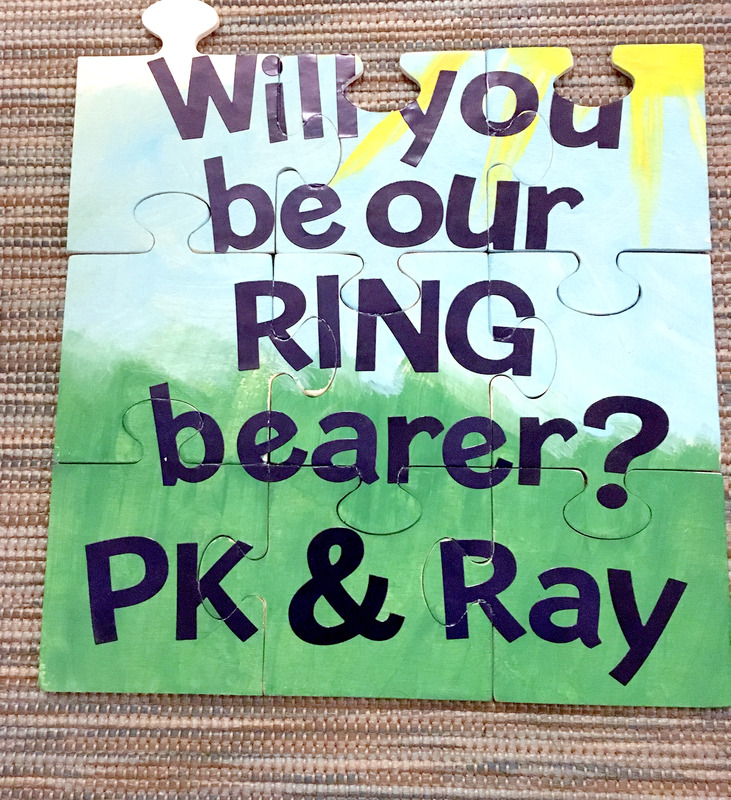 For this banner, I used card stock that I cut into puzzle pieces. I simply taped the Happy Birthday letters to the puzzle pieces. Then, I used fishing line and hot glue to attach the pieces. It was quick and worked like a charm! As far as food, I love a good theme party, so I can label all of the food after the theme of the party. (Check out the amazing menu from our Beatles party). However, not only did the puzzle party theme give me less to work with – but our eating has really changed the past year or so. Our family has moved into a gluten-free, high fruit and vegetable-based diet. We love eating this way, and we want our parents and sisters to be eating well too. So chips, sugary cakes, cheesy pastas, and hot dogs won’t be found on our table. Instead, we made a really healthy spread (that went over really well! 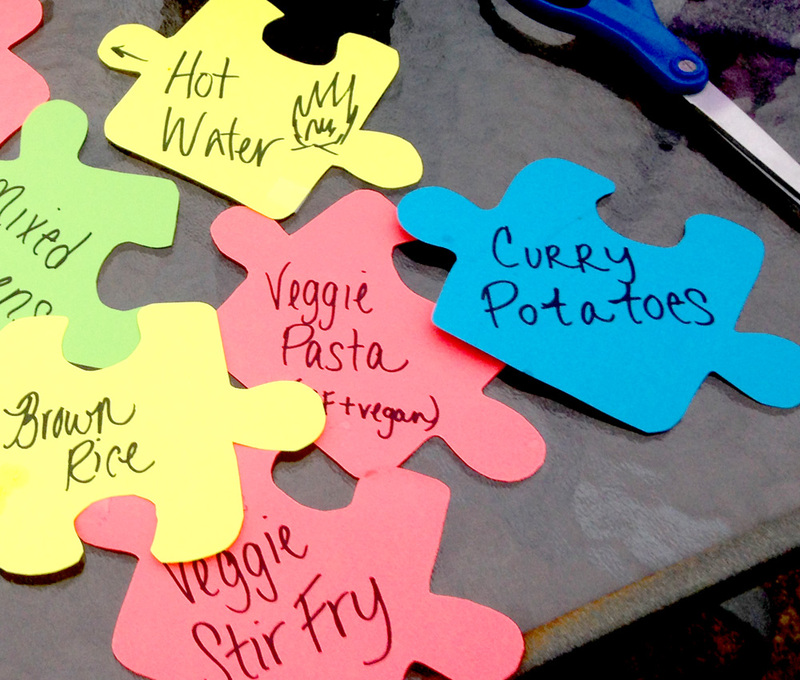 ), and as far as creative food labels, we just used the puzzle pieces to label what everything was. 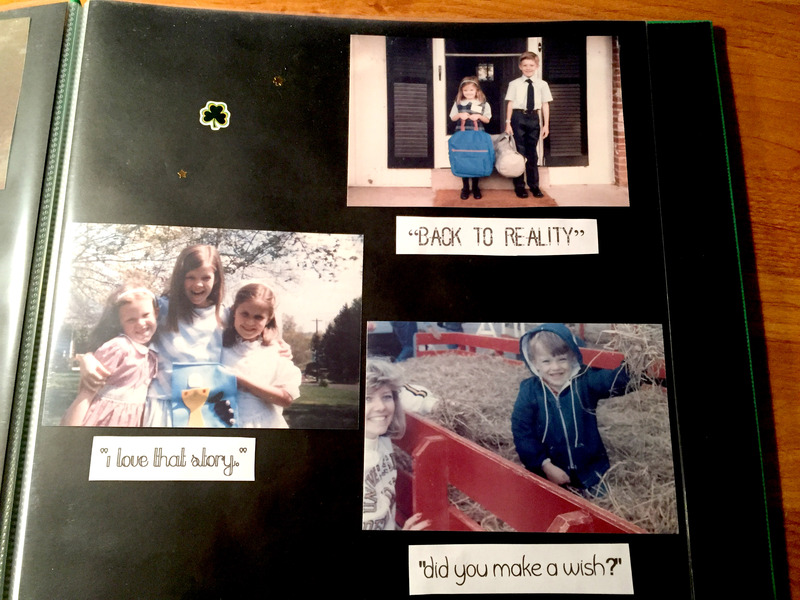 It wasn’t as creative as our past parties, but it tied everything together well. So, I guess you are probably wondering about the cake. 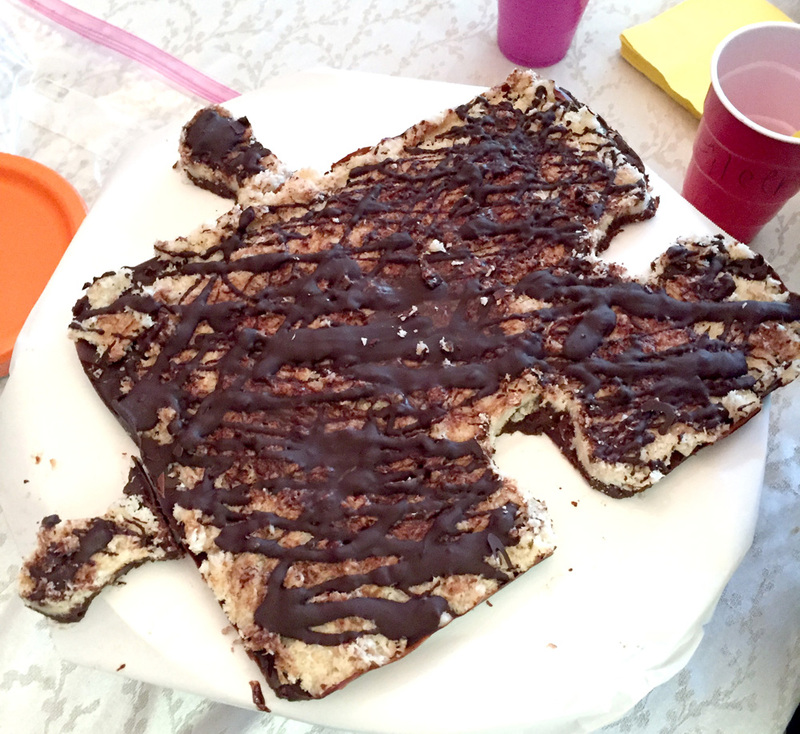 We did have a cake of some sorts – it was chocolate coconut fudge that I last-minutely shaped into a puzzle piece. 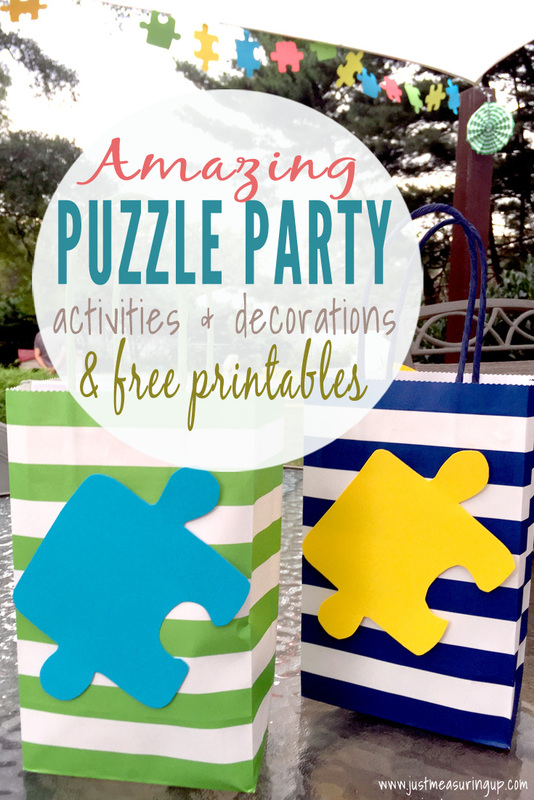 Perfect for a puzzle party! And, through keeping the DIY party decorations, games, and preparation easy, it was completely manageable. 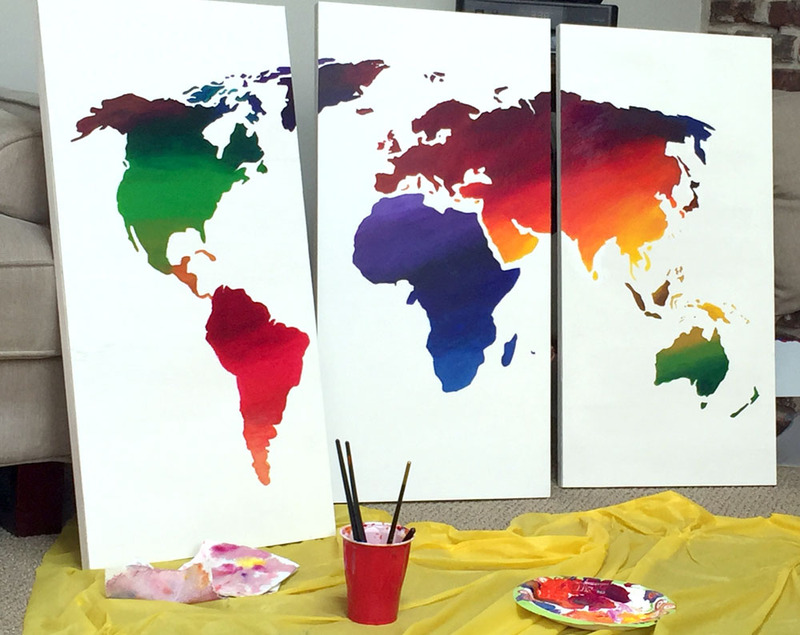 If you were wondering if you can pull off a DIY party, the answer is yes! Just keep it simple and reuse the same decorations again and again. I was sitting with my toddler the day after his birthday, surrounded by all kinds of new gifts. But what was he playing with? An empty cardboard box that previously housed one of his new toys. All these new toys, and he’s playing with the with boxes and wrapping. Every time we have an empty box – usually a diaper box – our son climbs in and pretends he’s driving some kind of vehicle. Or he fills it with his stuffed animals and pushes it around. Or, he tries to get the dog in the box. 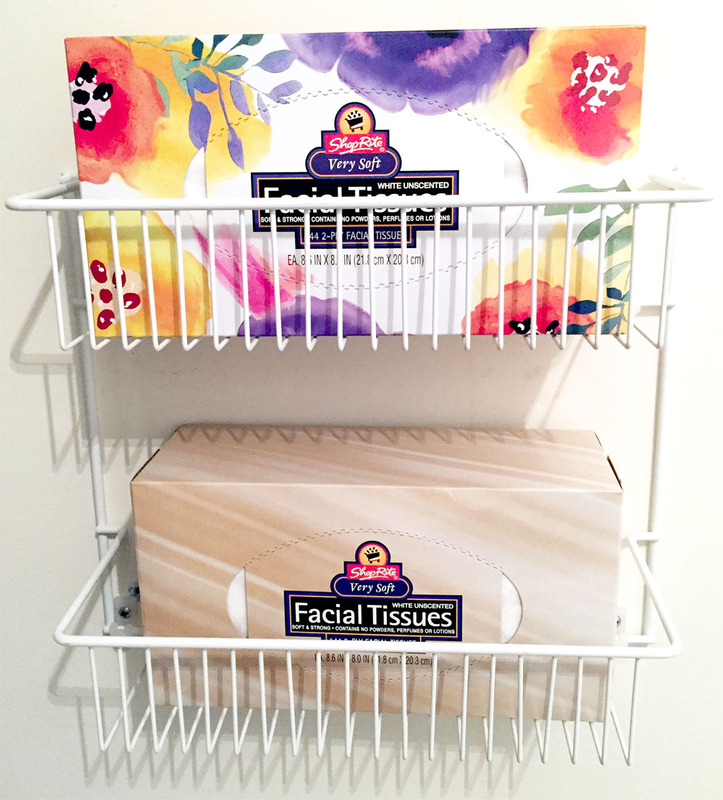 Just as much as our toddler loves to play with the diaper boxes, I love when I can upcycle them into something useful. We’ve made a fire truck diaper box halloween costume, storage bins (you can’t tell they are diaper boxes when you cover them with cute contact paper and add a knob), and pretend race cars. I was looking for an easy fall craft for toddlers, and as my son was running around the house with the empty diaper box on his head, inspiration struck. I love to keep things simple. If it’s too many steps or materials, then it’s not the craft for us. 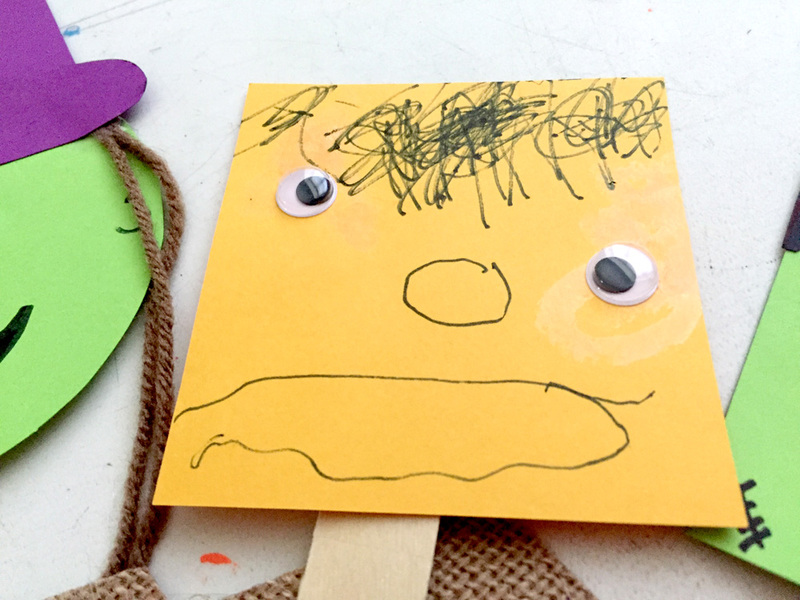 For our popsicle stick puppets and diaper box puppet theater, all of our materials came from around the house – making the cost nothing! 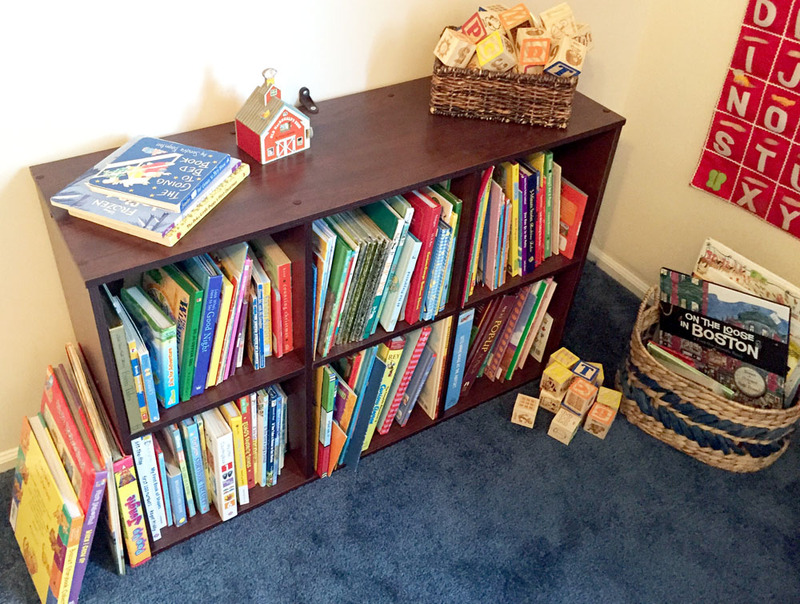 It was also an easy craft to do, which gave my son enough room to be creative. 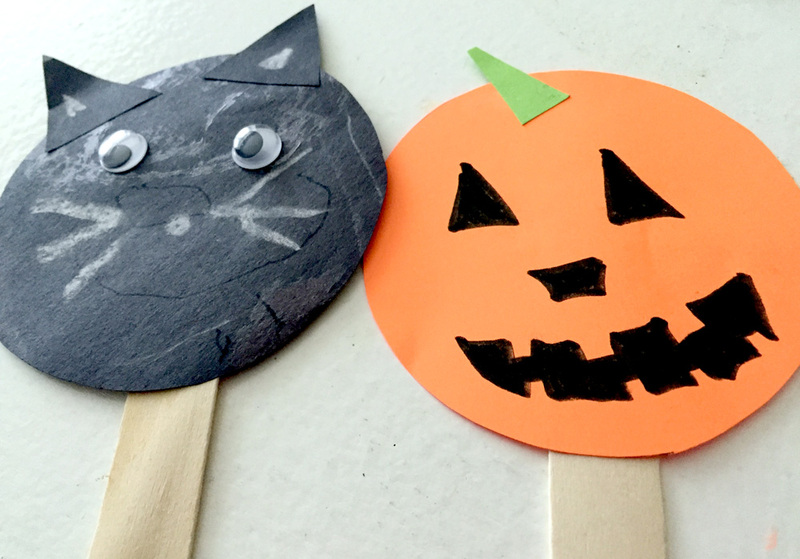 I figured the easiest way to make popsicle stick puppets for fall was by using simple shapes to do so. Since my son is still so young, I drew a few shapes – circles, squares, triangles of various sizes, ovals, and trapezoids and cut them out. To make the fall craft even easier for you, I created a printable (scroll to end for free printable) with all of the shapes we used – that you could simply print, trace, and cut. 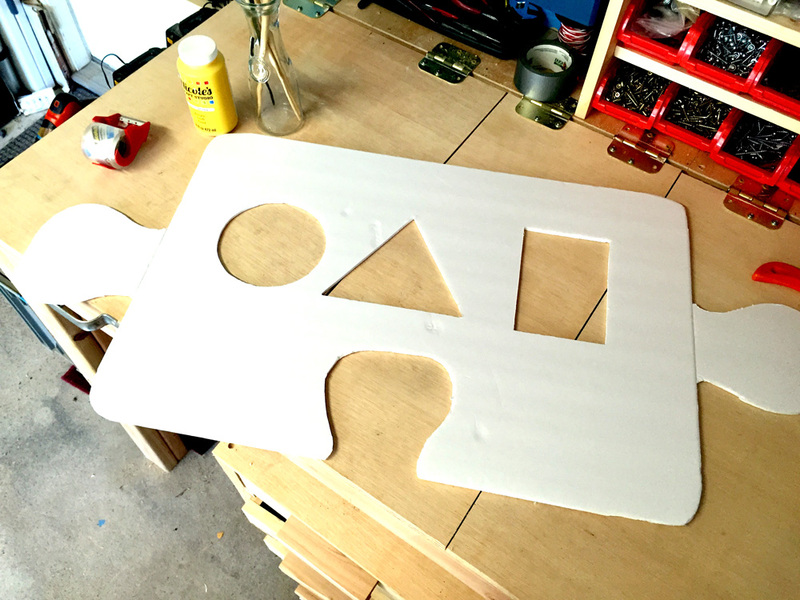 First, trace and cut out the shapes. 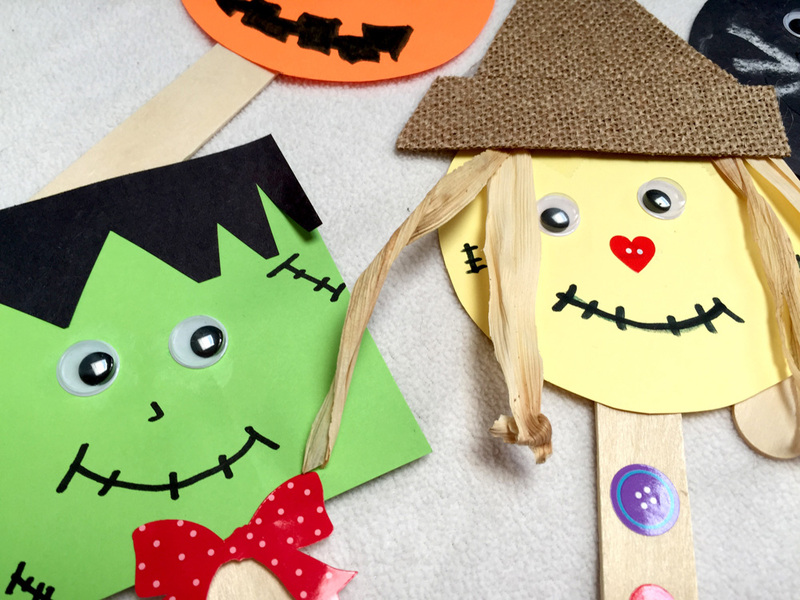 Then, I placed all of the shapes in front of my little guy and helped him to create fun fall faces. For example, we matched a big triangle to a big oval to make the witch’s hat. Then, we simply glued the hat to a circle to make the witch’s face. Next, we decorated her face with yarn hair and googly eyes. Last, we taped the face to a popsicle stick. 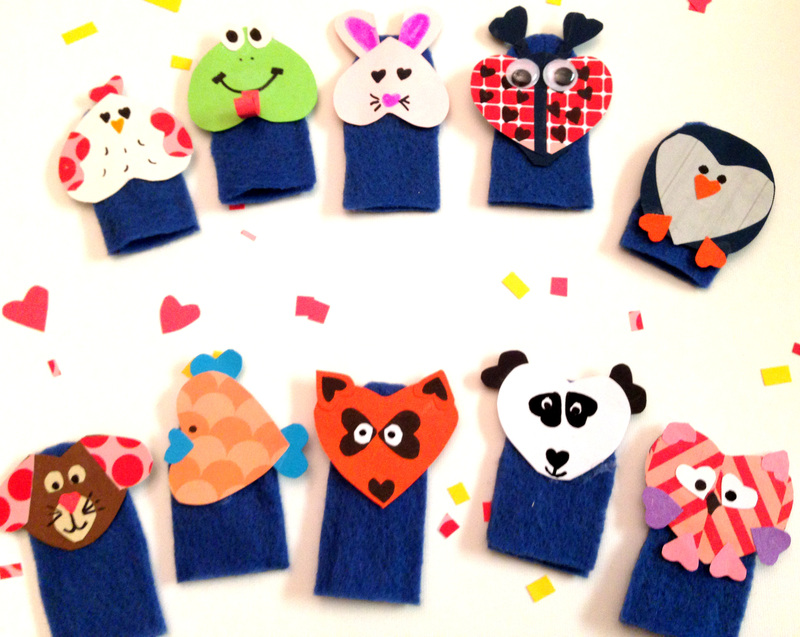 For embellishments on your puppets, you can use anything that you have around the house. 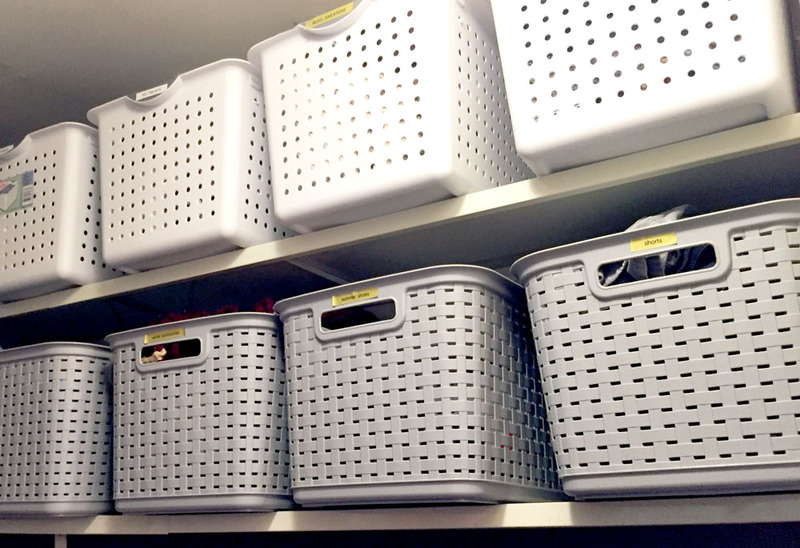 I like to go around and collect things and put them in a bin – and then we have all of our materials in front of us. 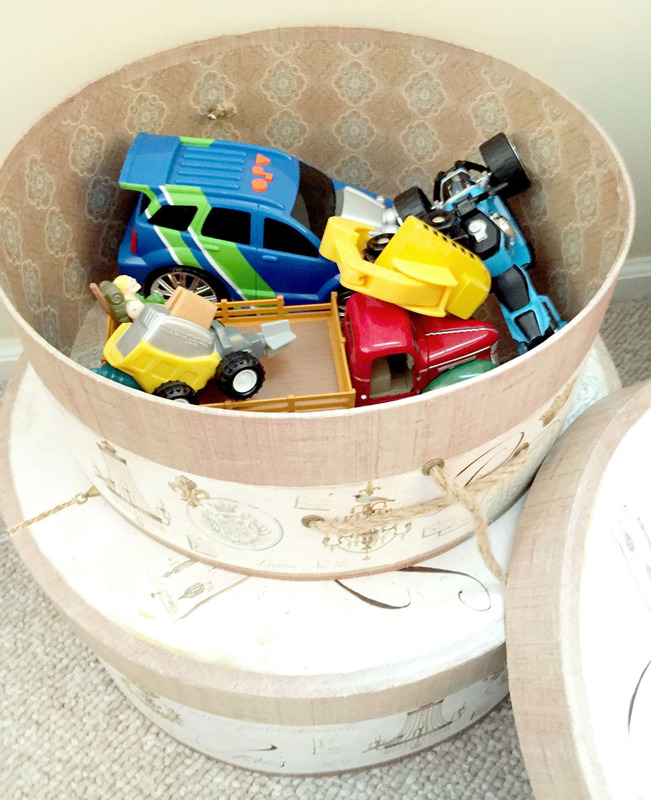 It’s fun to also include the kids in this – like a scavenger hunt. So, we then continued to choose shapes and decorate, turning our shapes into fun fall figures for our puppet theater. My son, who barely sits still, looooved decorating the faces. First, I cut off the top flaps of the box. 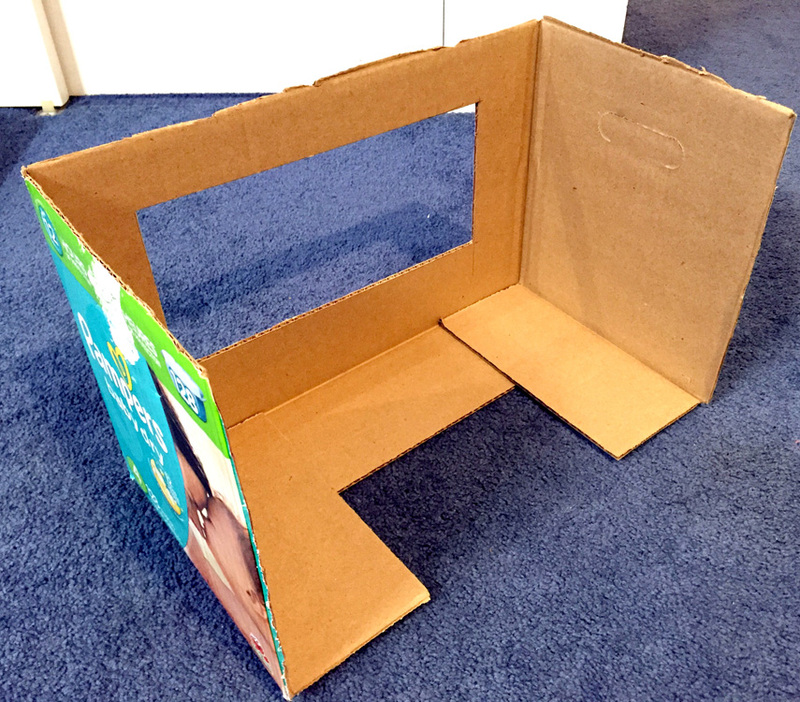 I also cut off one of the four sides – to turn the box into a tri-fold. I also removed one of the bottom flaps. Next, I drew a window and cut it out with an Xacto knife. After that, I grabbed some felt and hot glued it to the box. Surprisingly, I only used three sheets of felt. 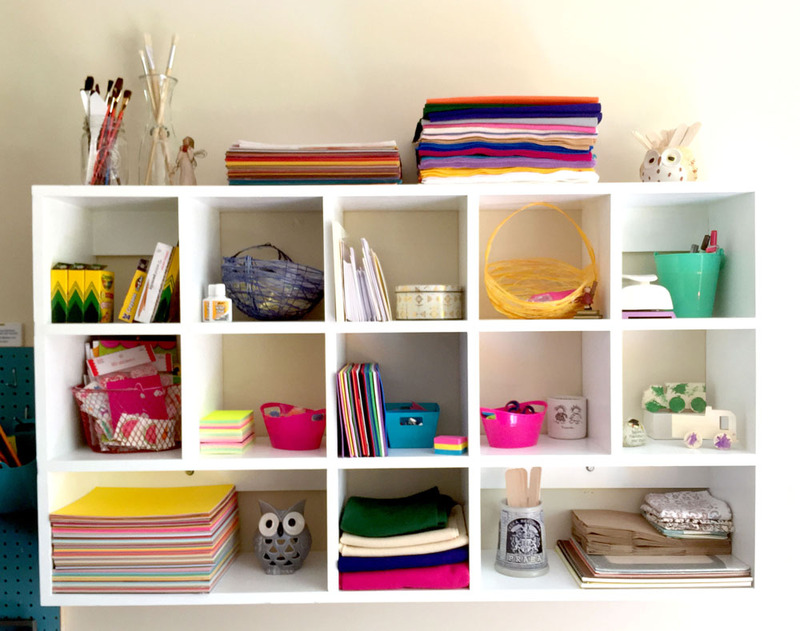 I love to work with felt and had a huge stack of it, but you could also use wrapping paper or construction paper or whatever you have lying around the house. Last, my son decorated the front of the theater with shape stickers. 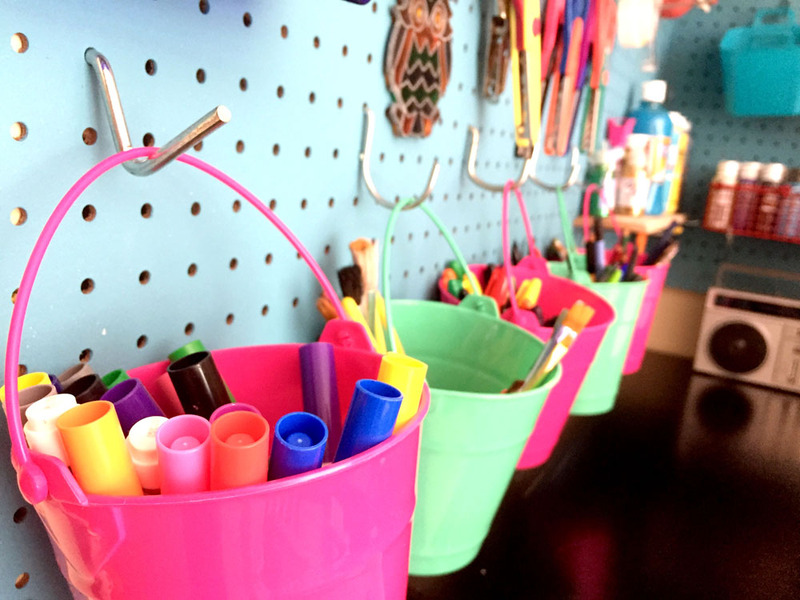 There are so many ways you can tie learning into crafts with kids. 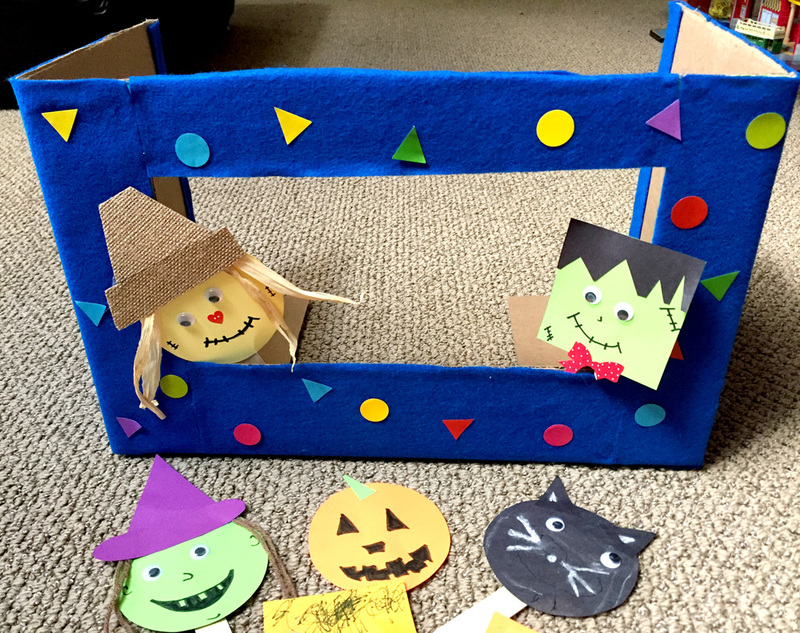 This easy fall craft for toddlers was centered upon shapes. 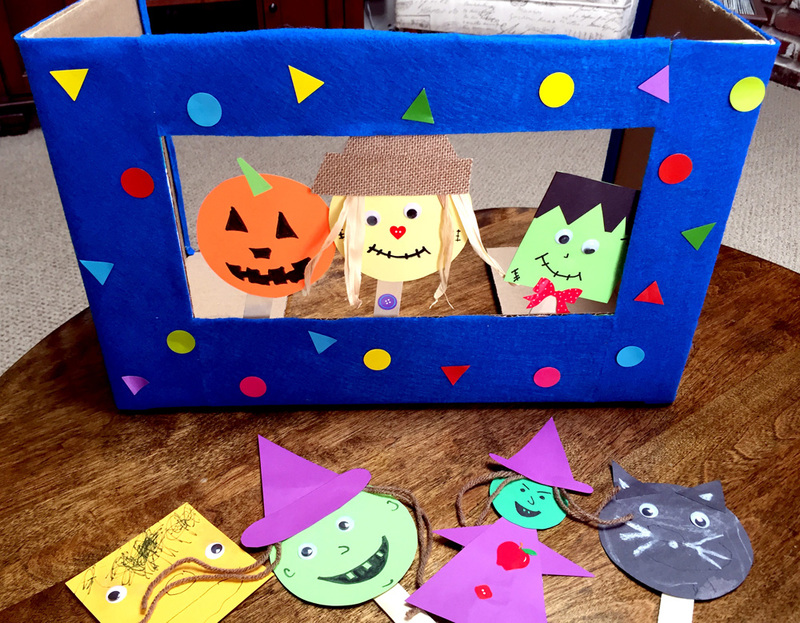 Not only was my little guy identifying shapes but he was working with them to create fun fall puppets – i.e. small triangles make cat ears, large triangles are perfect for hats, and heads can be circles or squares. 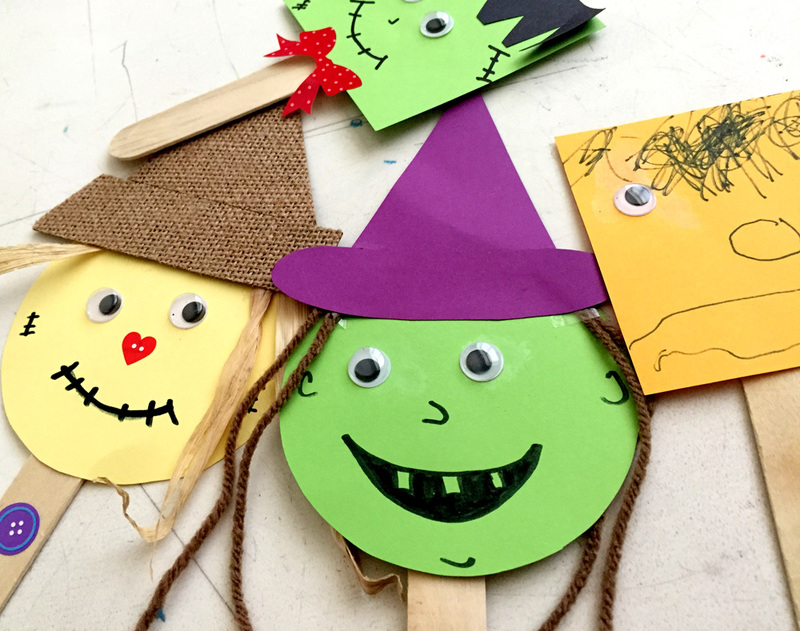 Other skills that this easy fall craft for toddlers included was the use of fine motor skills to glue, cut out simple shapes, and draw faces. You can also tie this activity in with a fall book, like this pumpkin shapes book. This one is a great Halloween lift-the-flap book – the drawings in this one make it easy to pick out different shapes you see. You could also take a trip to the local library for an extension too. 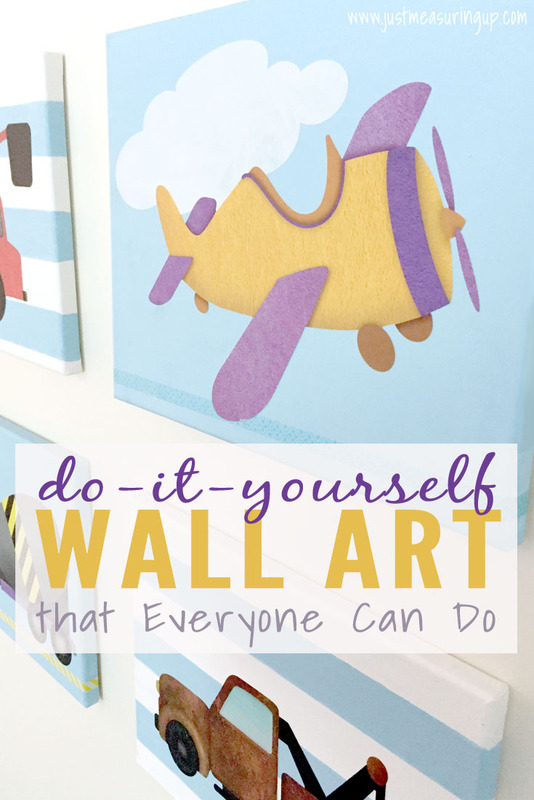 Last, if your kids are not toddlers, they can totally do this craft and more independently. 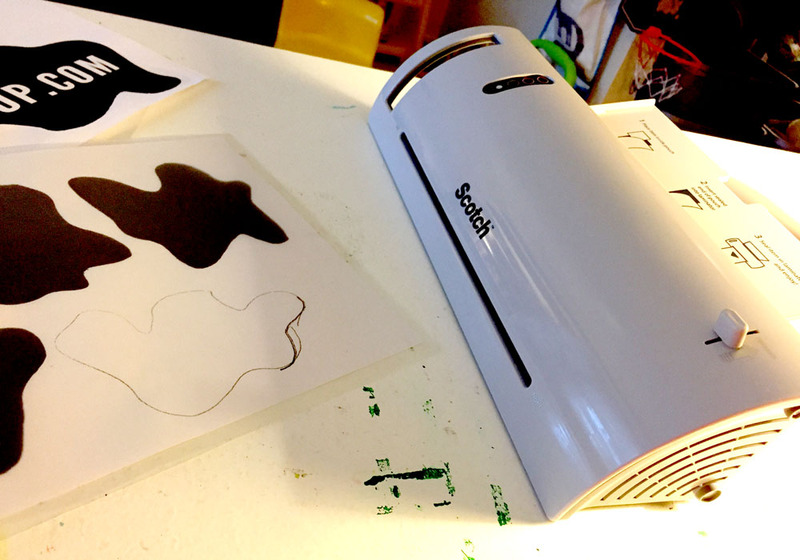 In fact, you could simply print the shapes template, have them trace, cut, and decorate themselves. 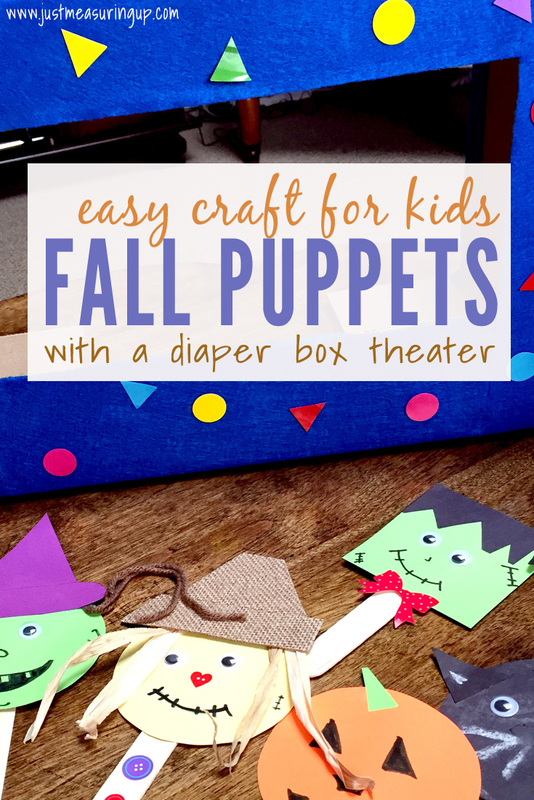 And, puppet theaters are perfect for kids of all ages. 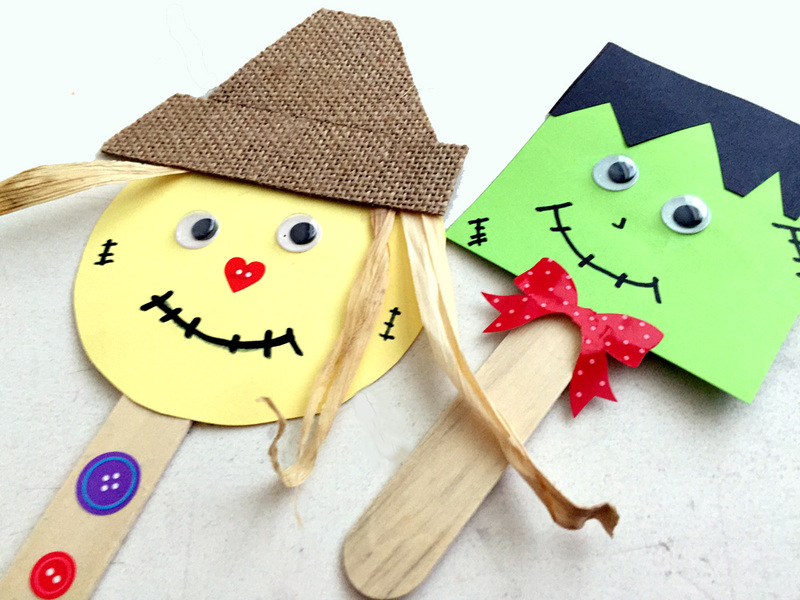 So, if you have a box laying around the house or if it’s a rainy, cold day and you are looking for something to occupy the kids, making these easy popsicle stick puppets with a cardboard box theater is the perfect activity. With fall around the corner, there was a local scarecrow festival coming up. Eileen and I check out their scarecrows every year and always talk about making one when our son was old enough to understand and be excited about it. Well, this was the year to actually do. Even better, they had a new “Out of this World” category which was right up my alley. I love anything outer space related. So I put my thinking cap on to come up with an idea. 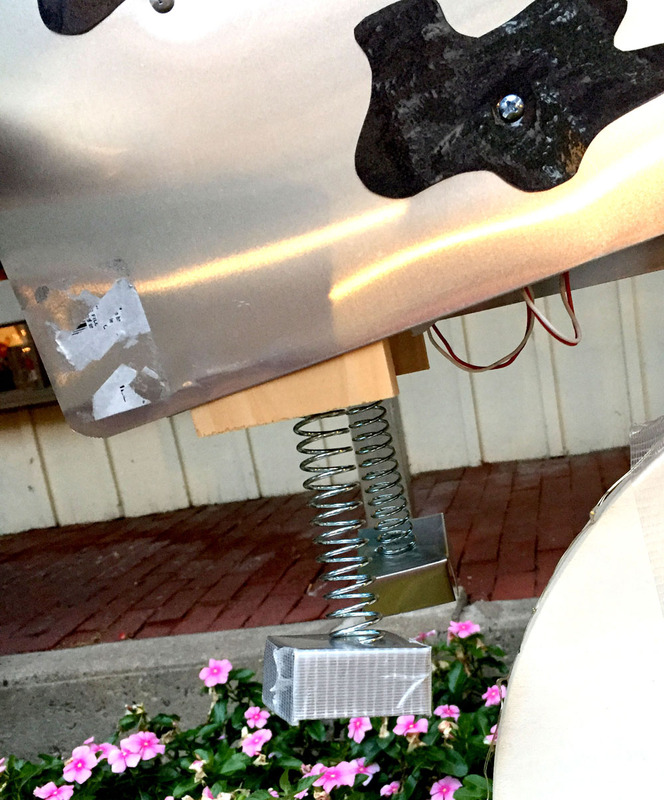 Unlike your traditional scarecrow made from straw, I planned on ditching the straw in favor of sheet metal – a more robot friendly material. I also envisioned an interactive scarecrow. In all our years of visiting this competition, I’ve never saw a scarecrow that invited you to interact with it. 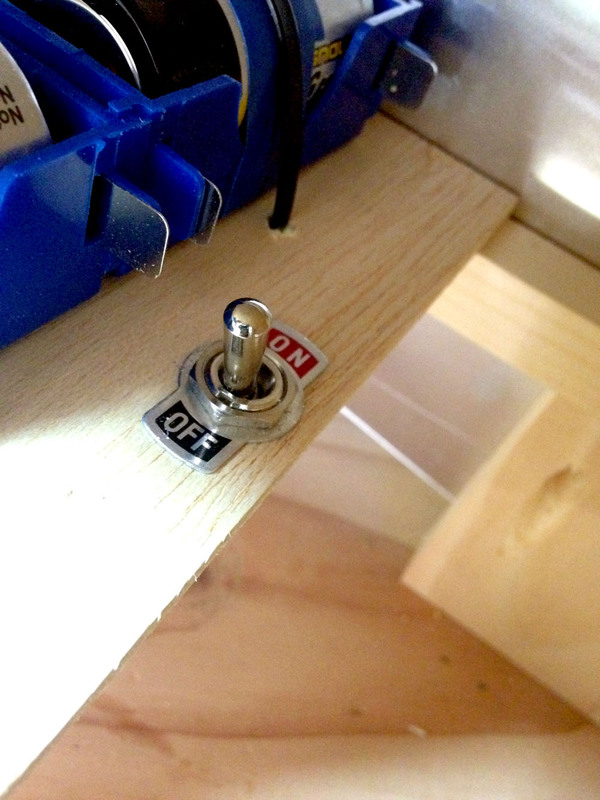 So, to make my robot really stand out, I wanted a button that people could press. The button would wake up the robot and he would start telling some cow related jokes. Who doesn’t like some good cow humor? 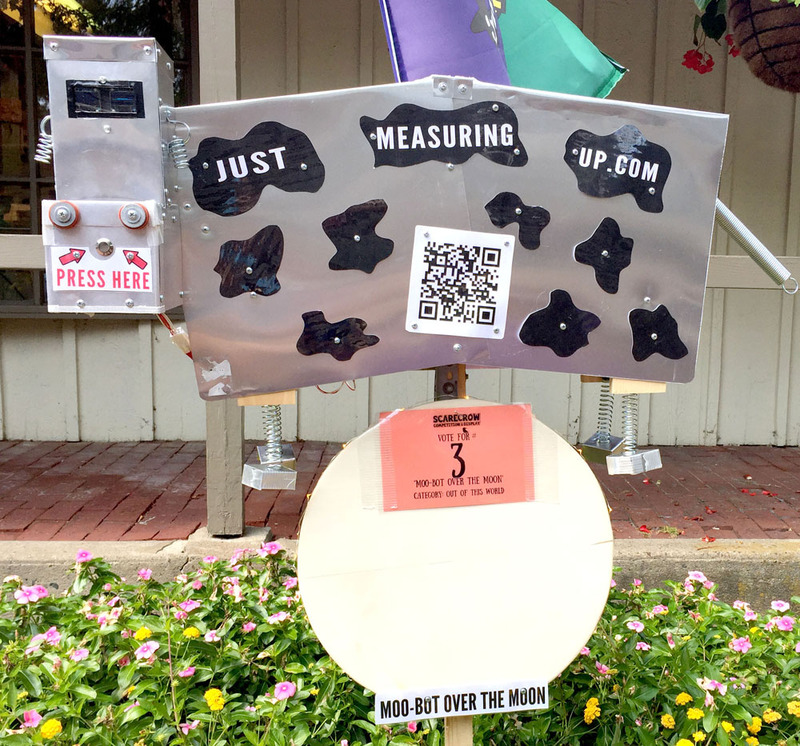 Here’s a video of Moo-bot in action. He’s an interactive cow that has blinking eyes, a moon that lights up, and plays through a reel of jokes every time the button is pressed. Pretty cool, right? 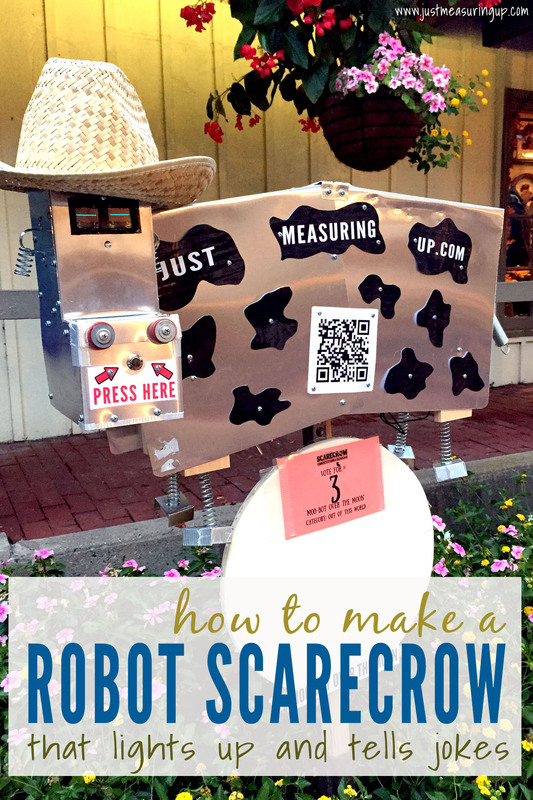 So here’s how to make a robot scarecrow. 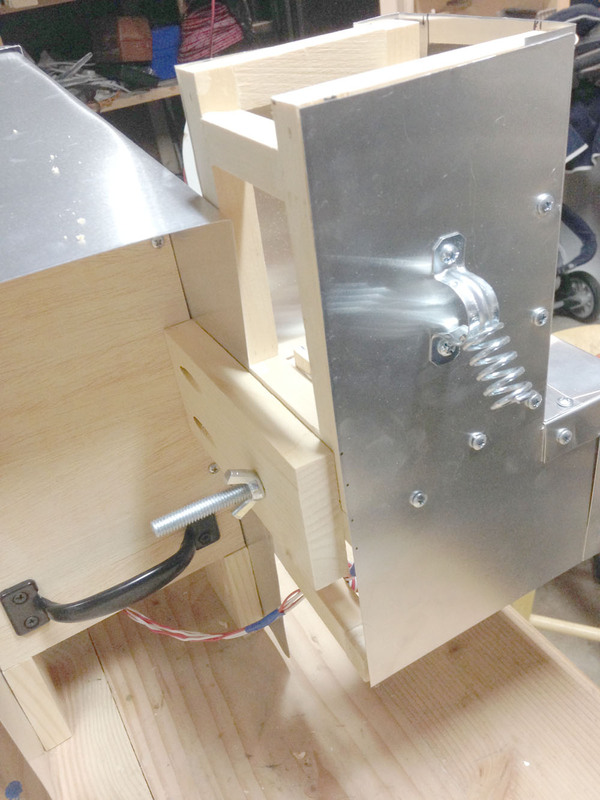 First, I started with the robot body, and then I housed the electrical components. 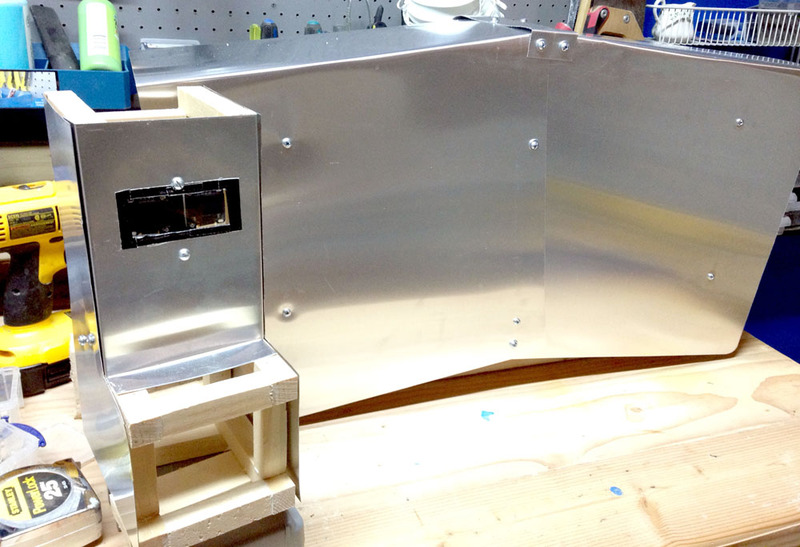 After that I worked on the robot head and then I covered everything with sheet metal to make it weather-proof. To start, I needed to come up with a design. 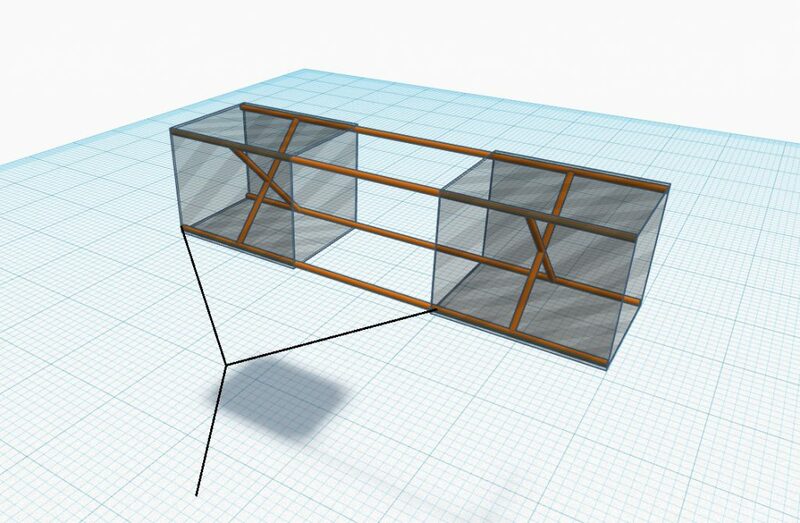 After a few pencil and paper drawings, I relied on TinkerCAD to assist with the design. Here is what I came up with (I made the body semi-transparent so you can see what the inside looks like): I designed Moo-Bot to be easy to transport. So it separates into three parts – the body, head and post. 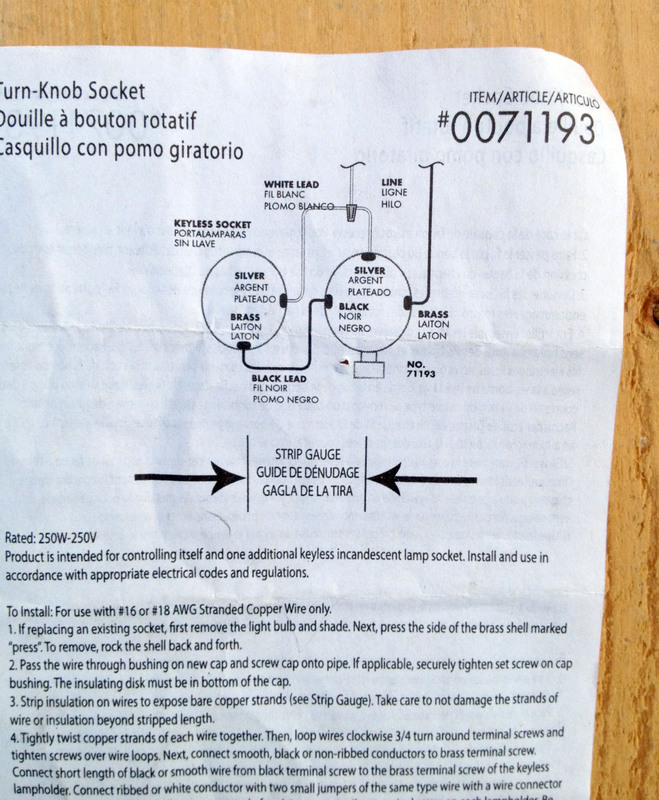 Each attaches to one another securely with a large bolt and wingnut. First I started working on the body. 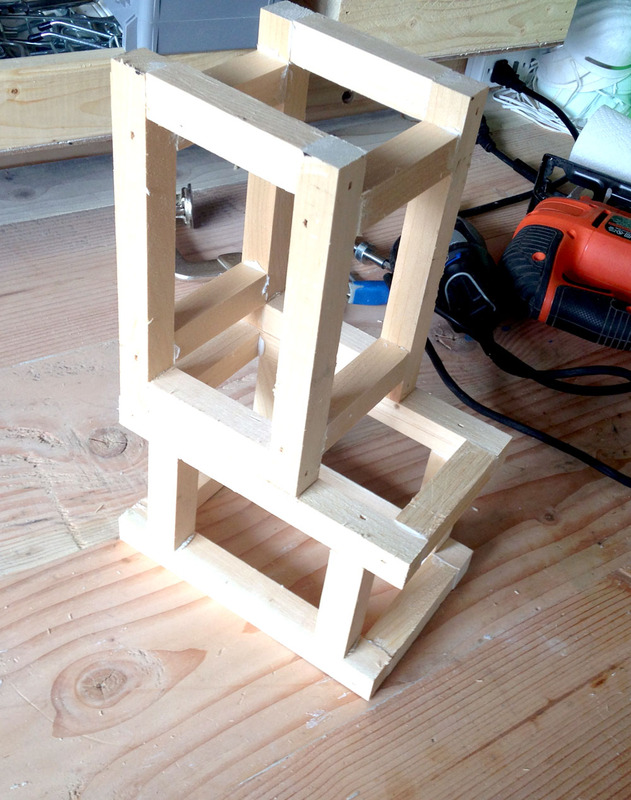 I constructed a frame using ¾” strips of wood cut from my table saw. 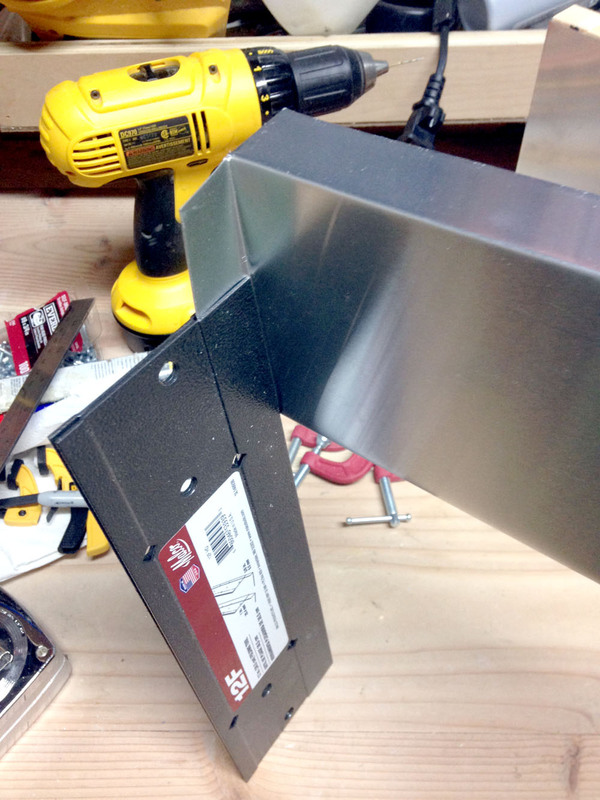 I did use some 3.5” thick pieces for extra rigidity though. 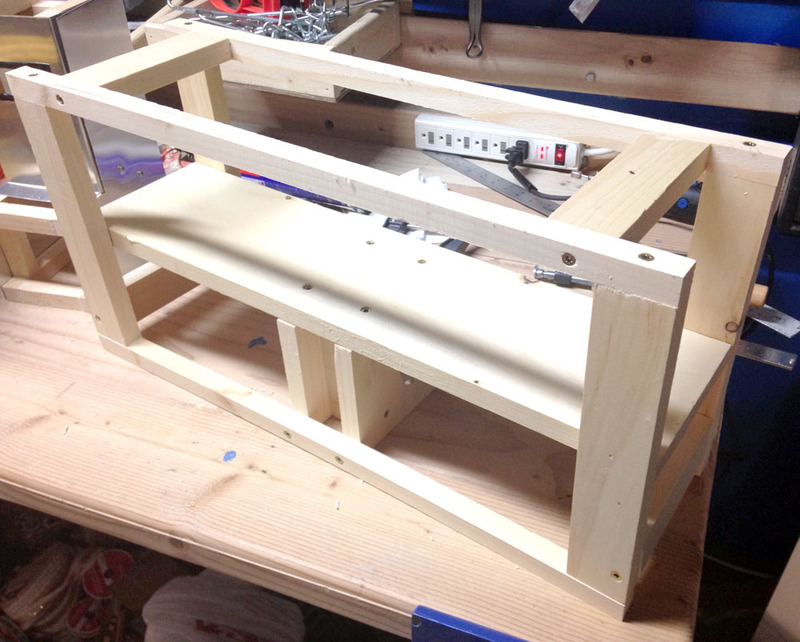 The body frame needed to be strong as it would house all the electronics. I connected all the pieces using construction adhesive and wood screws. At the bottom middle of the frame was a mount to insert the post. The post would have a hole drilled into it. 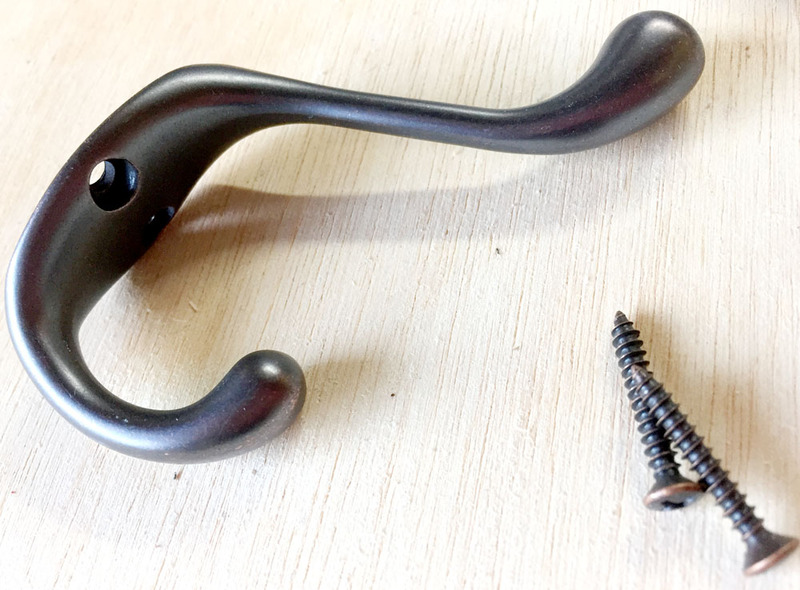 Once the post was inserted into the mount, a bolt would run through both of them, making a very secure connection. The top left contained a removable board hosting some circuitry for the brains of our robot cow. 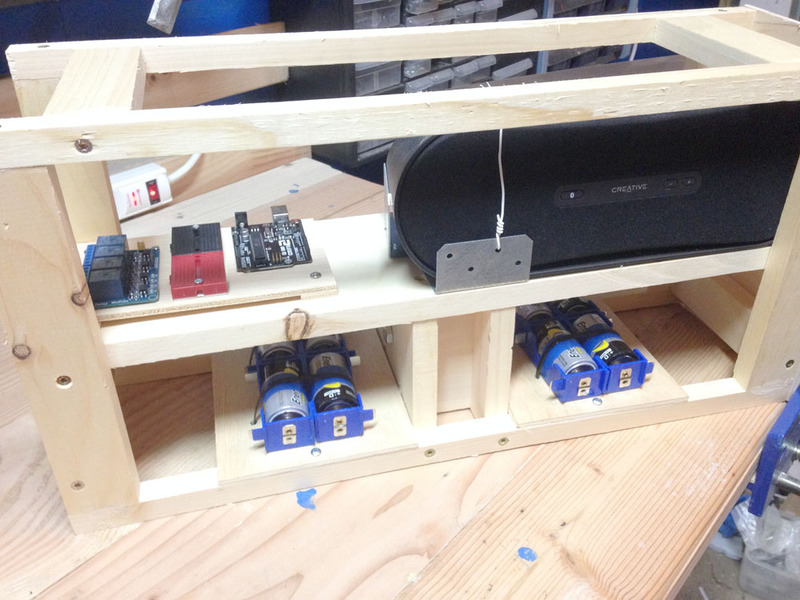 The top right contains the speakers, and below are eight D sized batteries, split into two sections. 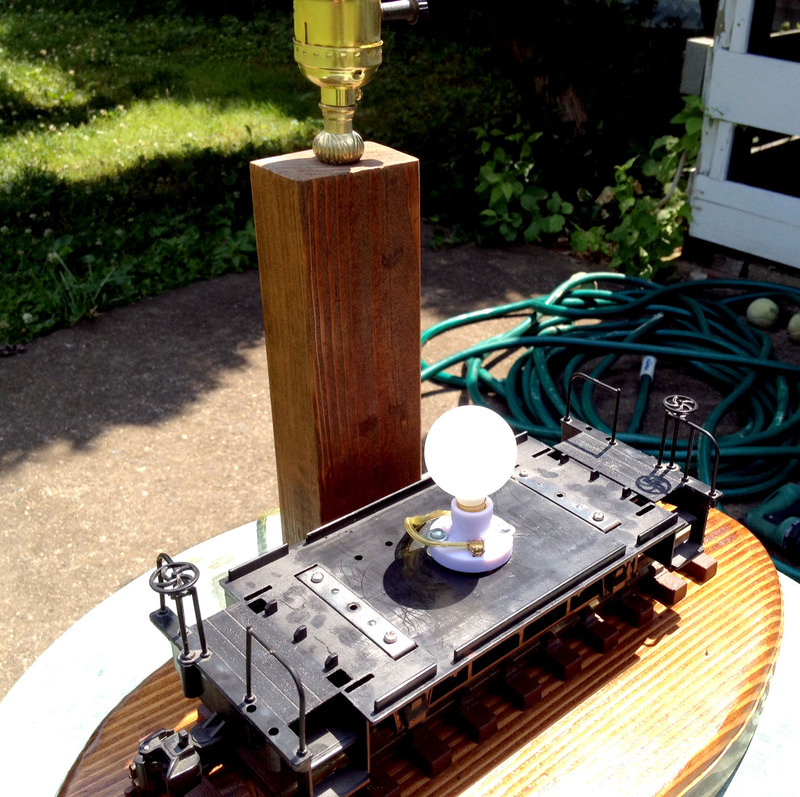 The speakers supported four AA batteries, but I wanted to power it from eight D batteries. 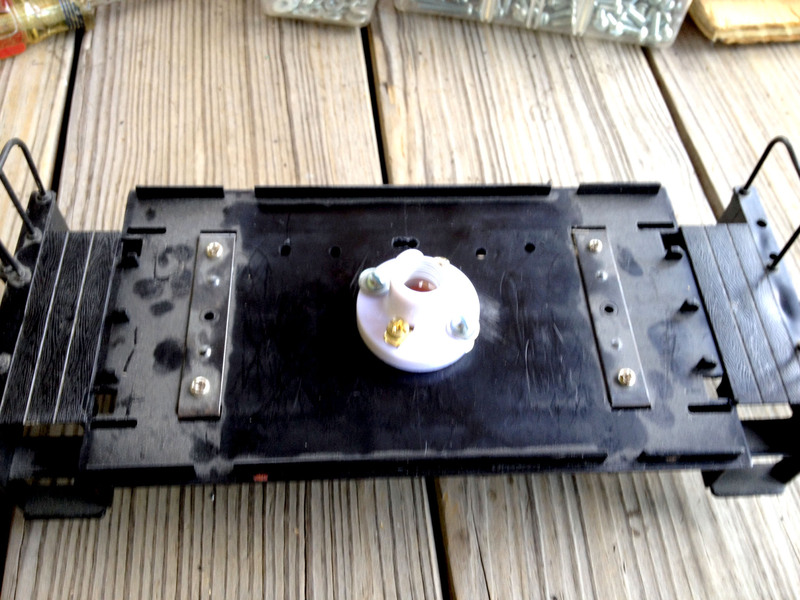 So I saw an area in the battery compartment to insert some wires, and secured them in place with some metal washers. 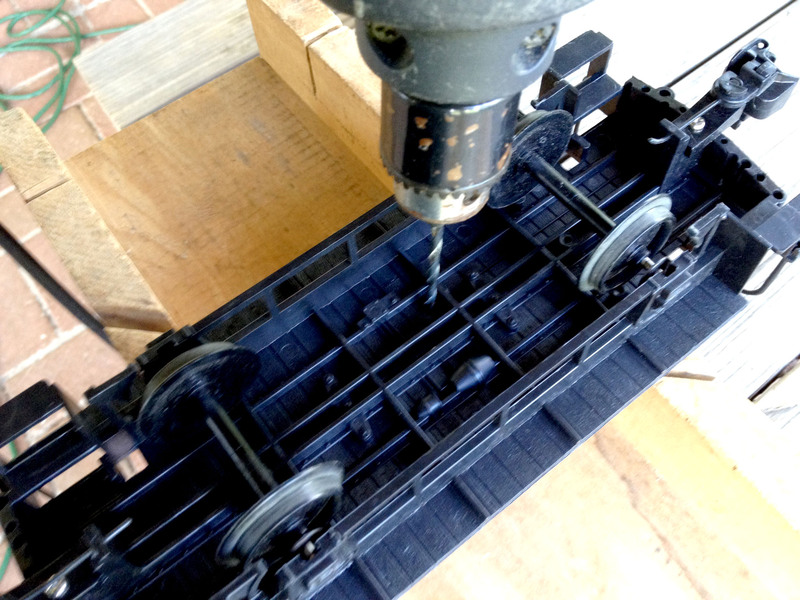 I then drilled a small hole in the compartment lid for the wires to stick out. 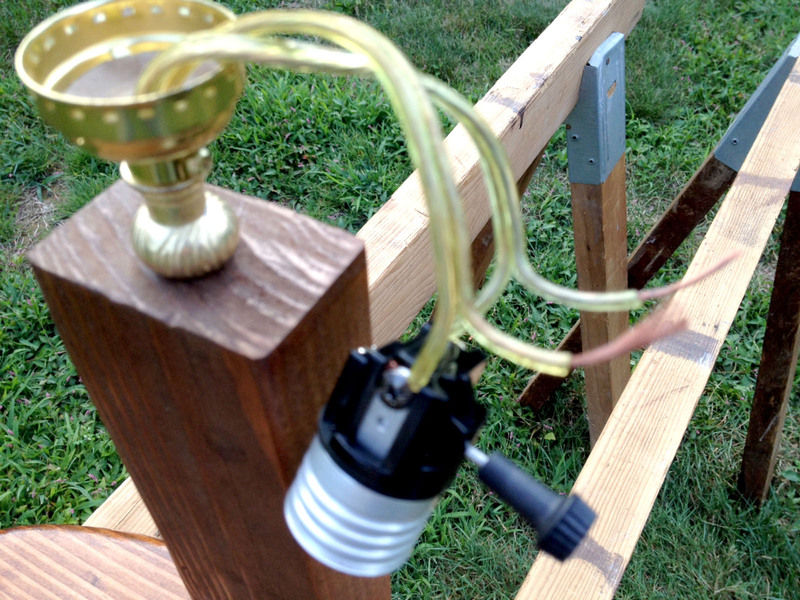 Even though the switch was located inside our robot cow, it was positioned so I could access it from underneath. The next part of Moo-Bot I tackled was the head. The design was really just one rectangular frame sitting perpendicular on top another identical frame. 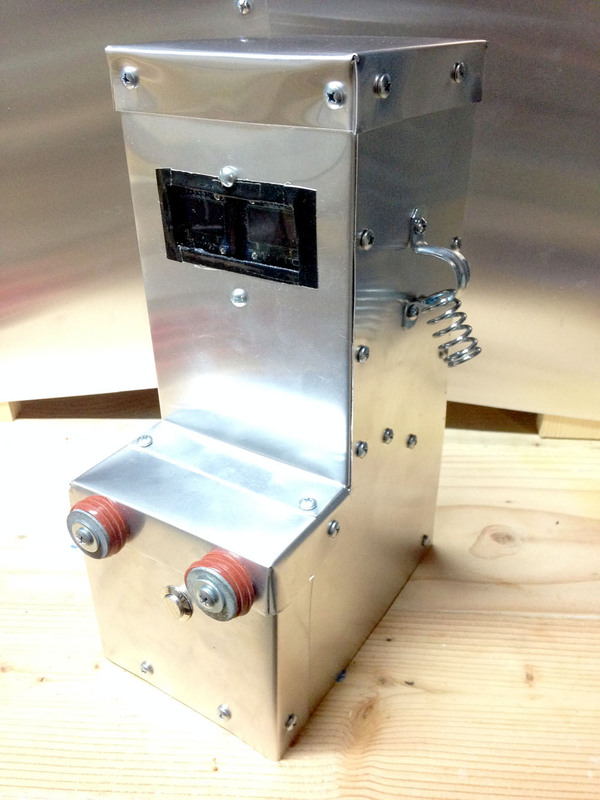 Here’s what the finished robot’s head looks like. 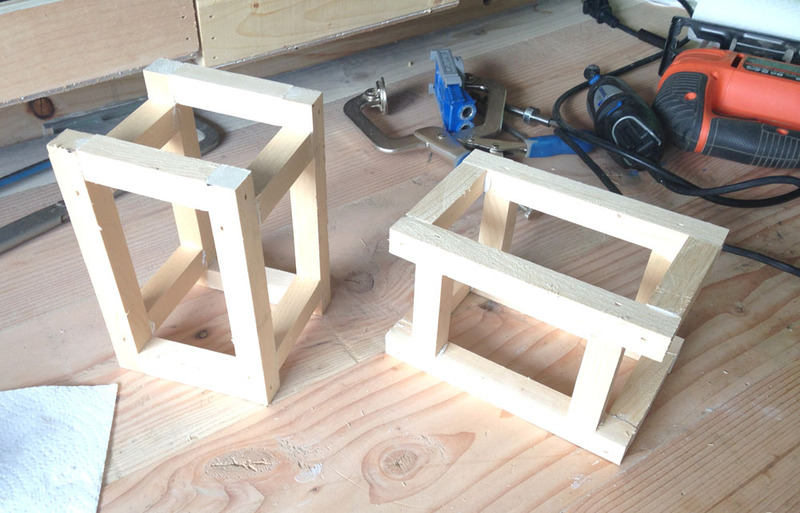 Similar to the body design, I made the frames from more strips of ¾” wood. I connected the pieces together with construction adhesive and my finishing nail gun. 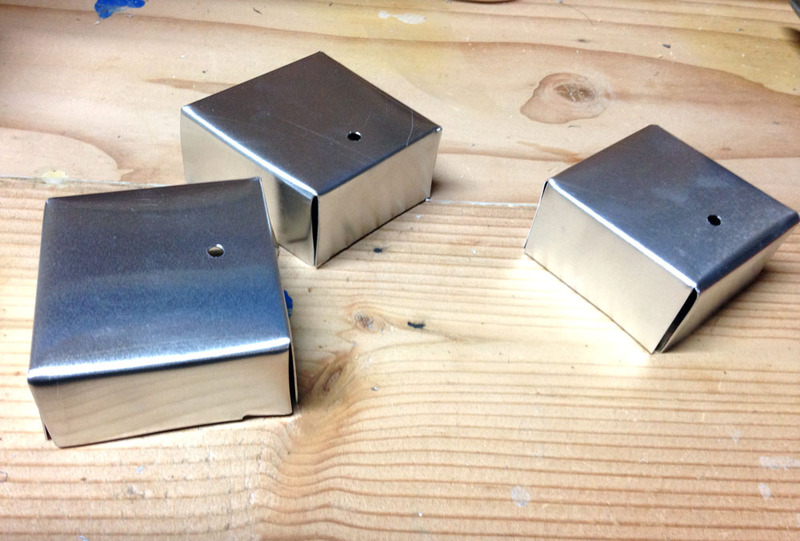 Next up was the sheet metal wrapping. I first did the sides of the head, as those were the easiest. Using some metal shears, I cut pieces out to match the outline of the side of the head. 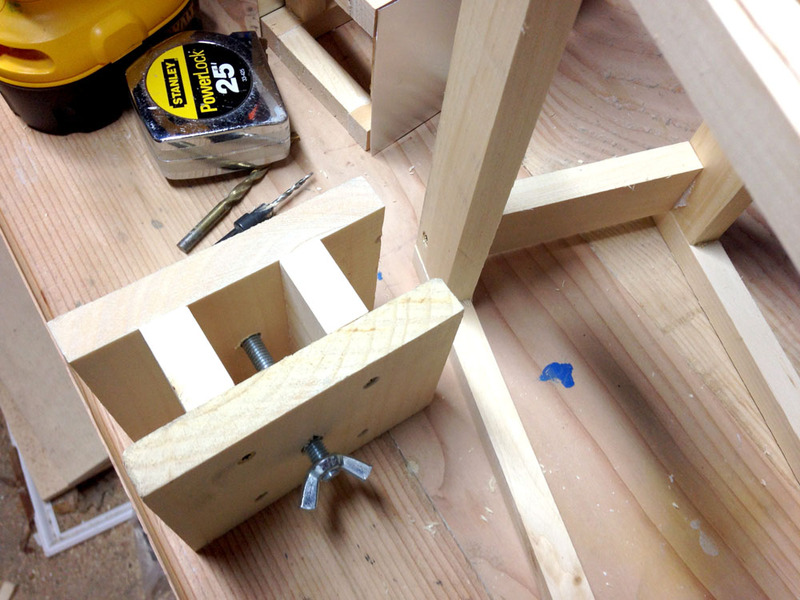 Then I clamped the pieces down and attached to the wooden frame with some screws. I had to be careful with the sharp edges and corners. Most of the time I wore thick gloves to protect my hands while cutting. Occasionally, I would get slightly warped cut corners due to the shears pinching the metal. 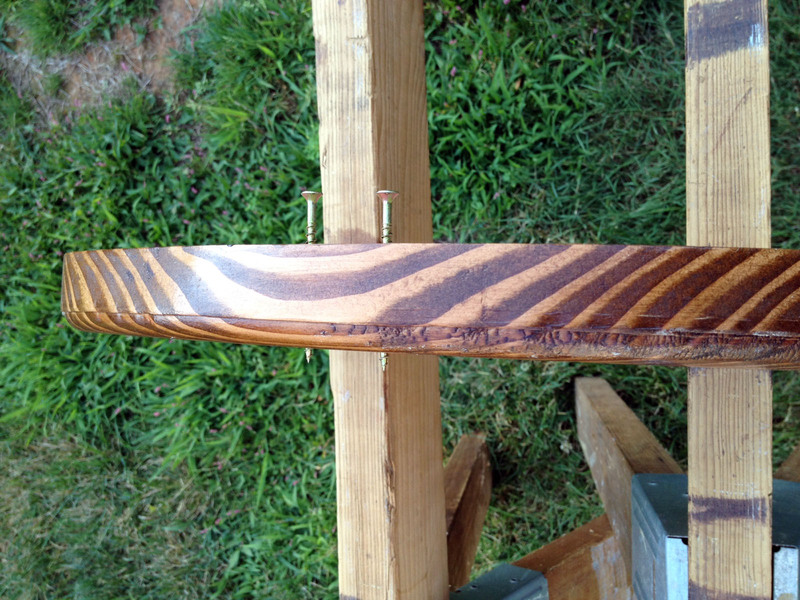 These warps and bumps needed to be flattened for a proper finish. For the next pieces, I had to think carefully about which ones needed to be bent and overlap other pieces. This was a critical step in making a rainproof head. All pieces of sheet metal cuts that left a crevice or opening for rain to run inside the head needed an overlapping sheet to divert the water. I was essentially wrapping the head in flashing. 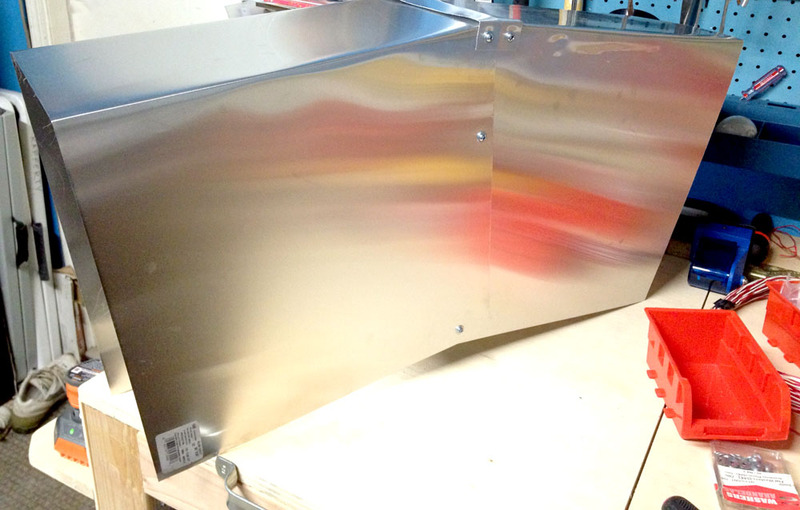 The next cut of sheet metal was the face piece where the eyes were. 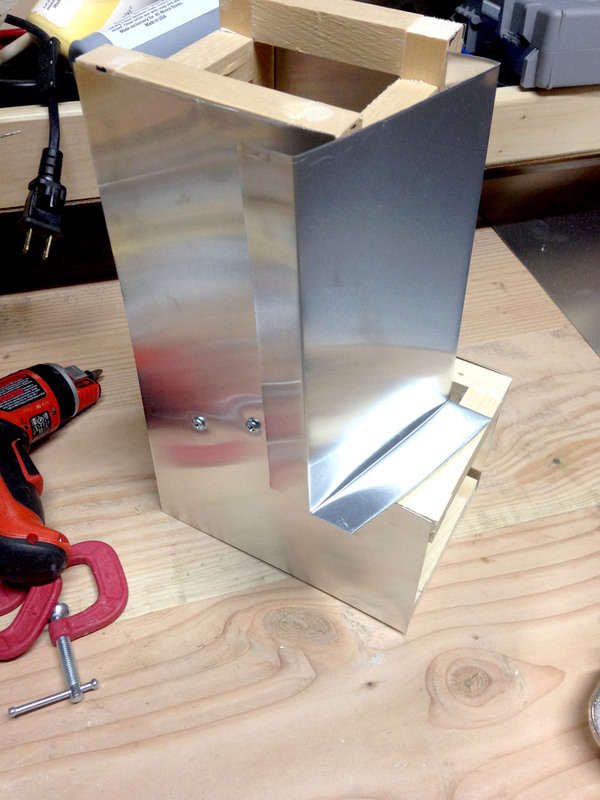 This part needed some bending at the bottom to divert any rain water, as well as an eyehole cut. 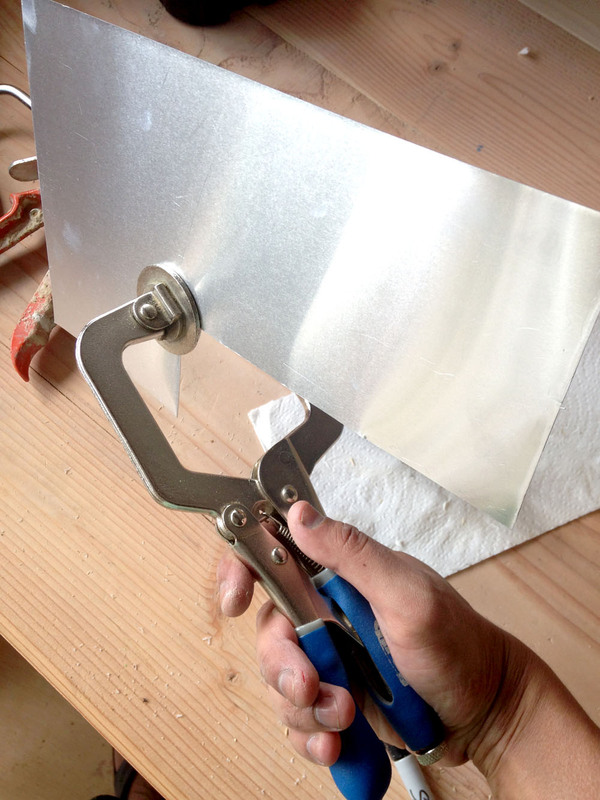 To bend the sheet metal, I used this nifty metal bending tool. After cutting the face piece, I worked on the eye holes. 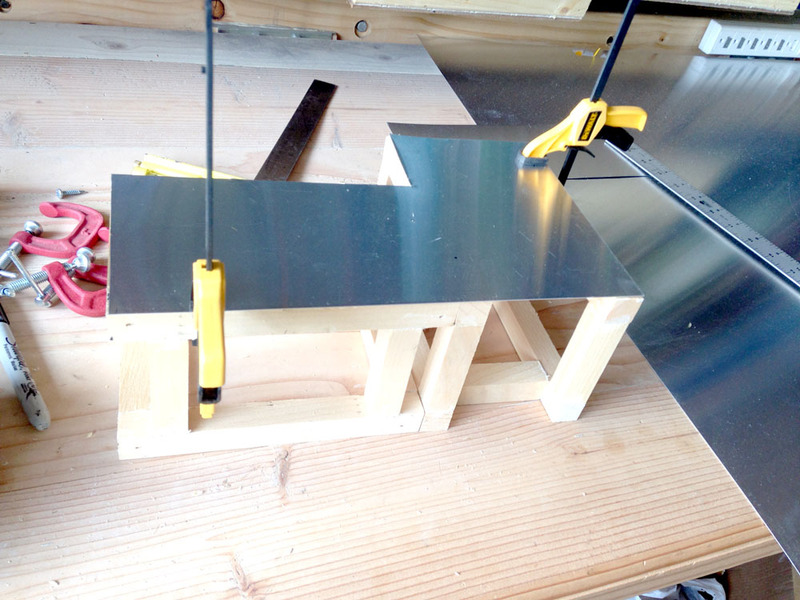 I etched an outline with my utility knife and cut a hole with my jigsaw (using metal cutting blades). 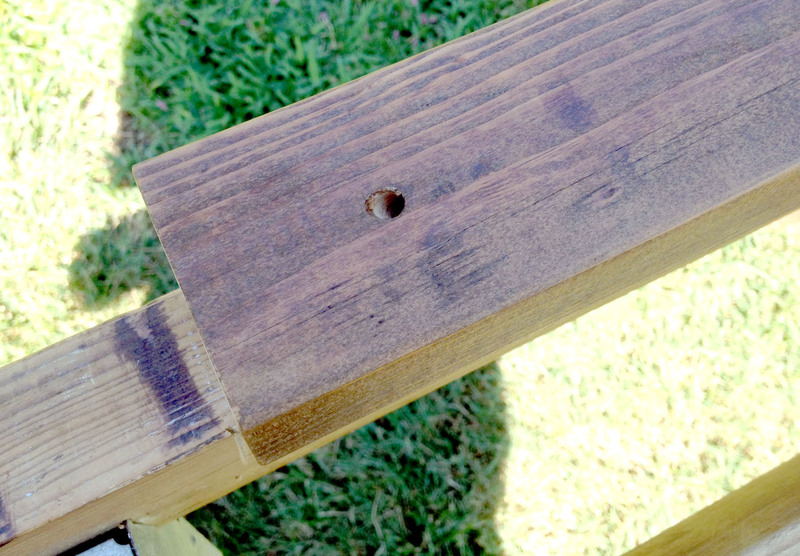 Unfortunately, I didn’t do such a great job cutting and the hole was a bit jagged. So I masked my mistakes by wrapping the cut edges with some black weatherproofing tape. It actually turned out to be a really nice visual touch. 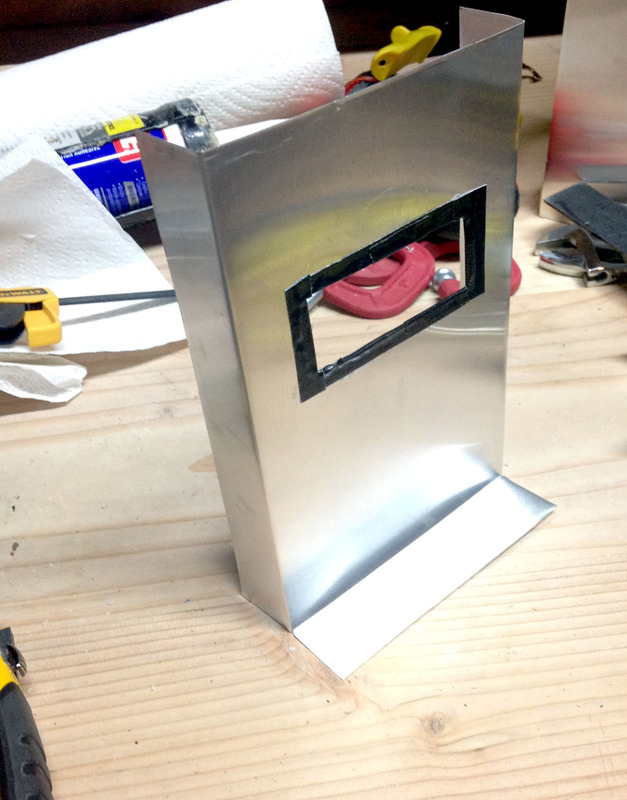 It sort of looks like a welding masking. It was perfect for a robot. The next step of the process was adding accessories to our robot cow. For the eyes, I first attached a piece of plexiglass inside the head. This would keep rain out. Moo-Bot is really starting to take shape at this point. 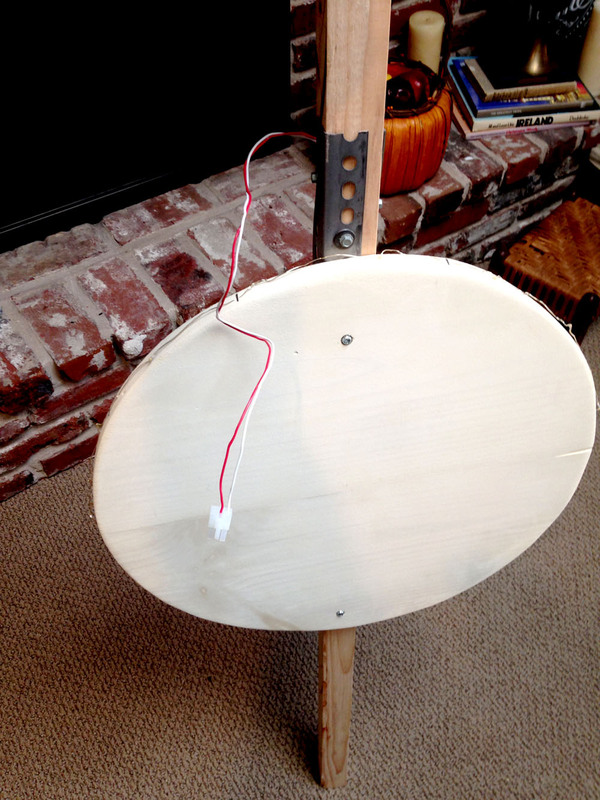 Next, I attached the mouthpiece containing the interaction button. Also, I wanted to add some sort of decoration representing nostrils. I dug around the garage looking for inspiration when I came across some rubber washers. I think they were meant to be used in a hose. Regardless, they would be perfect for nostrils. I stacked four of them together, and attached to the mousepiece with a regular metal washer for a cool robotic nostril effect. Since I wanted the head to be easily detachable, I needed a quick way to disconnect/reconnect the wiring. These adapters are actually for a computer power supply, but I repurposed them into cow robot adapters. The wires on the right plug straight into the body and the head. The cable on the left connects these two adapters. This setup allowed me to literally plug/unplug the head without the hassle of managing different wires and risk mangling my setup. 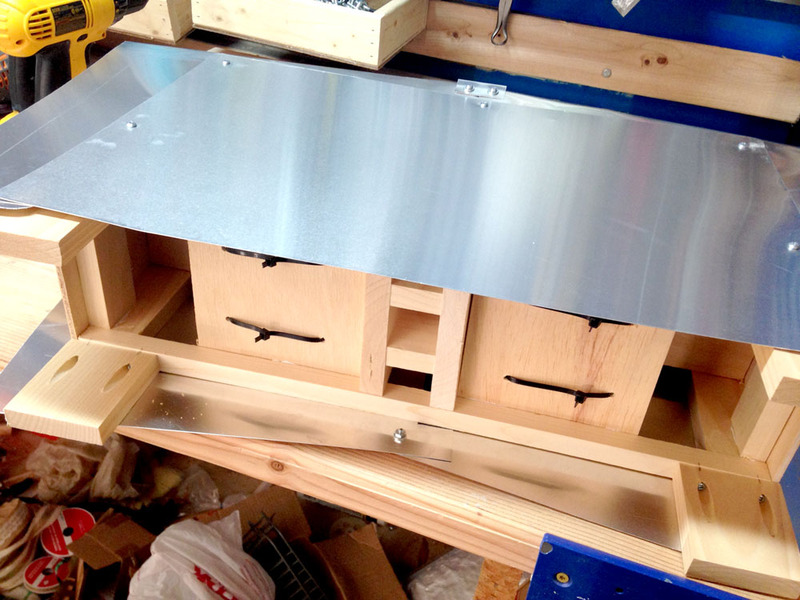 Next came the fun task of building the sheet metal enclosure for the body. 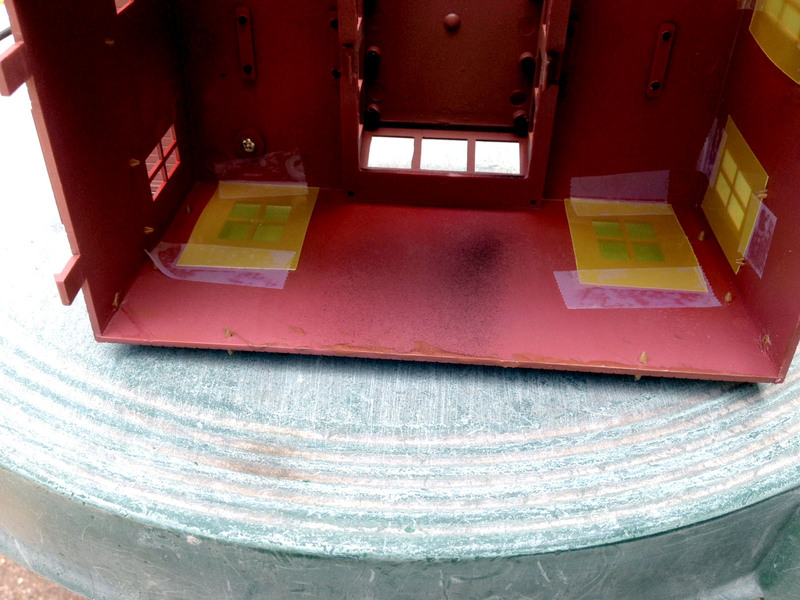 The enclosure was essentially two boxes, joined at a slight 15 degree angle. 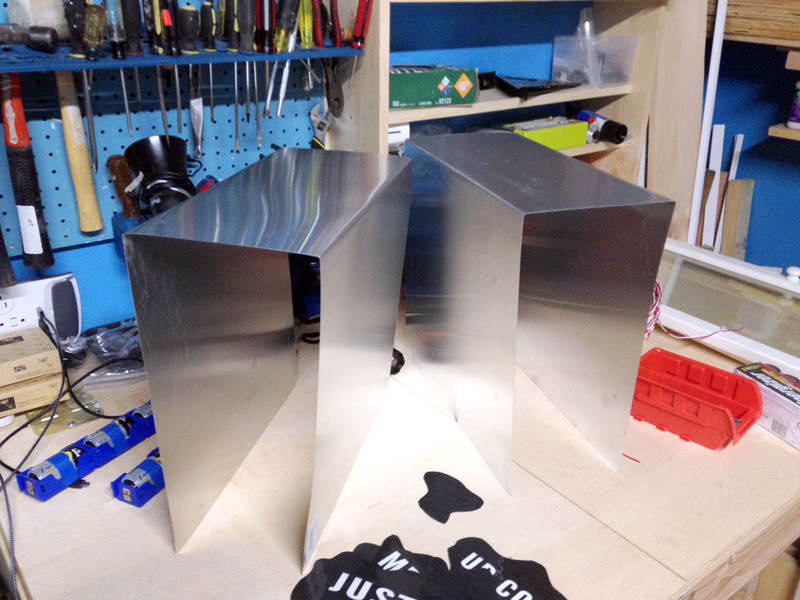 Each box was made from a long strip of sheet metal, bent twice to form a U shape. 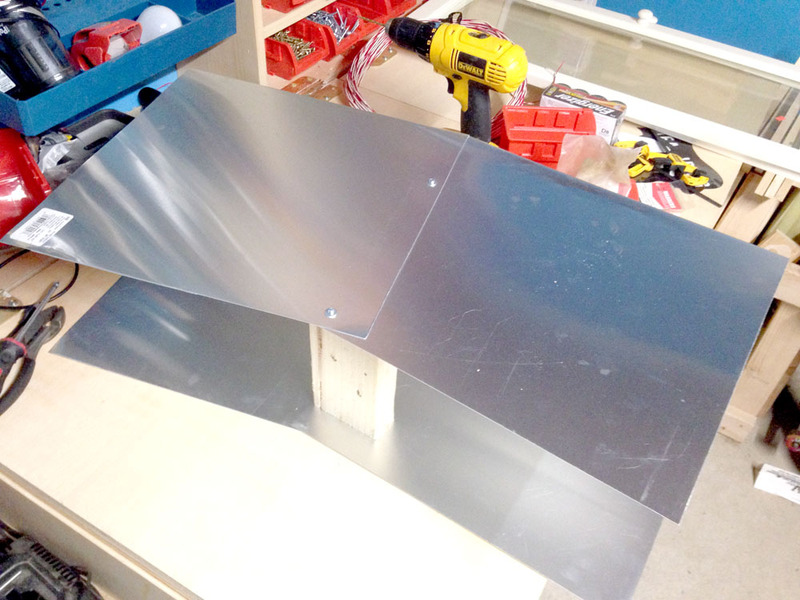 So first I had to cut the sheet metal to size. I didn’t want to use my metal shears because it would take too long, and I probably would not get too accurate of a cut. So I used some scrap wood and clamped the sheet down to a table, and made the cut quickly with my jigsaw (using a metal blade). I could have just left the robot cow with a straight body without the slight bend (and a lot easier to build too), but aesthetically it would have looked boring. Also, I wanted an intentional bend in the body to highlight the fact that Moo-Bot was jumping over the moon. When the two body segments were joined, I needed to do something about the ridge they created at the top. It was finally time to join the enclosure to the body frame. 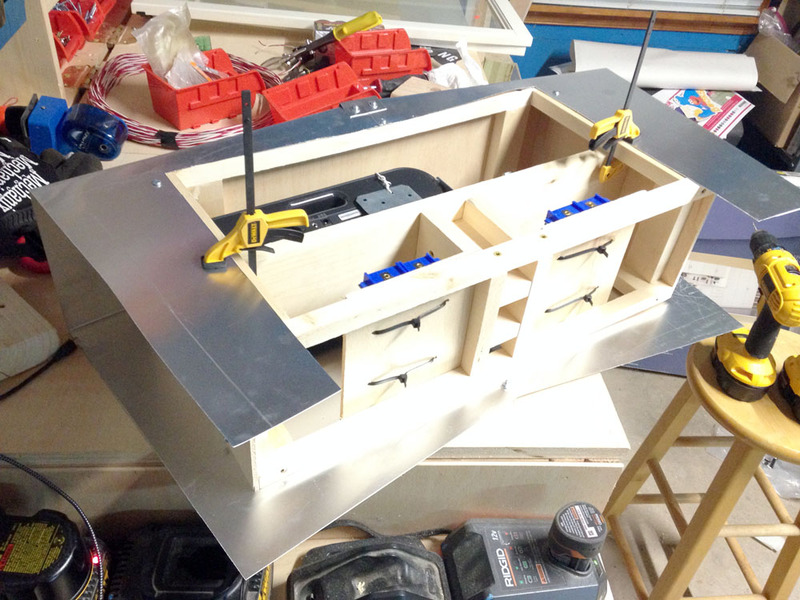 However, I had one remaining task to cut out a large hole in the back of the enclosure to serve as an access panel. 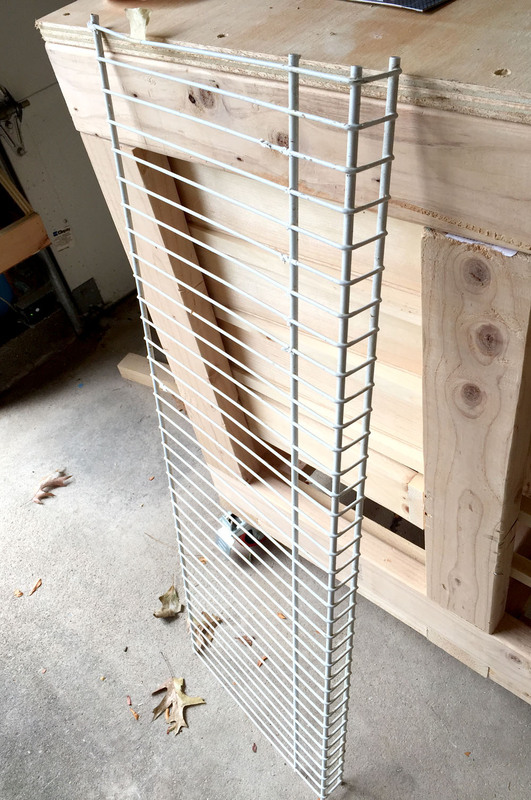 The hole would normally be covered by a rectangular cut piece of sheet metal, attached to the body frame with several screws. Then to gain access to Moo-Bot’s insides, it would just be a matter of removing those screws to take off the access panel covering. Eileen made some laminated decals for Moo-Bot’s cow spots. 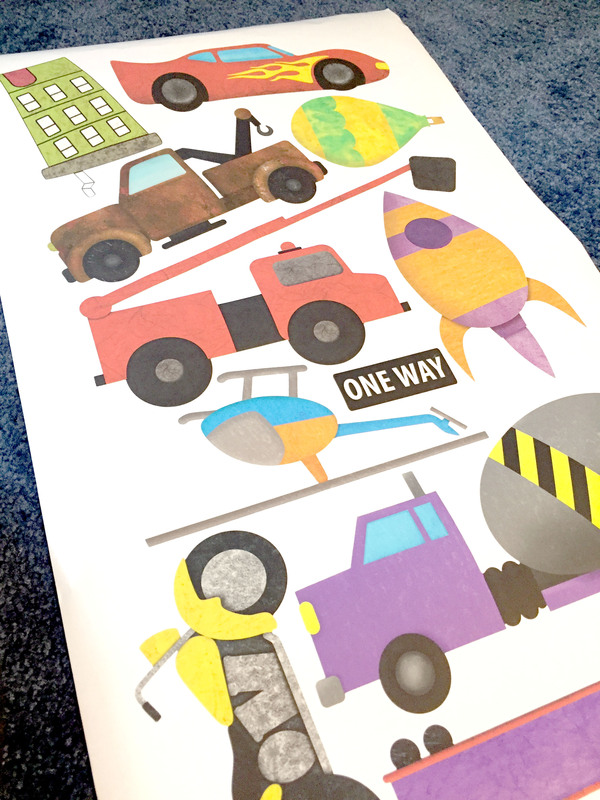 She drew them, printed them on our printer, and ran them through a laminator. The results were awesome, and would last in any weather. Finally, it was time to work on the final piece – the scarecrow post. 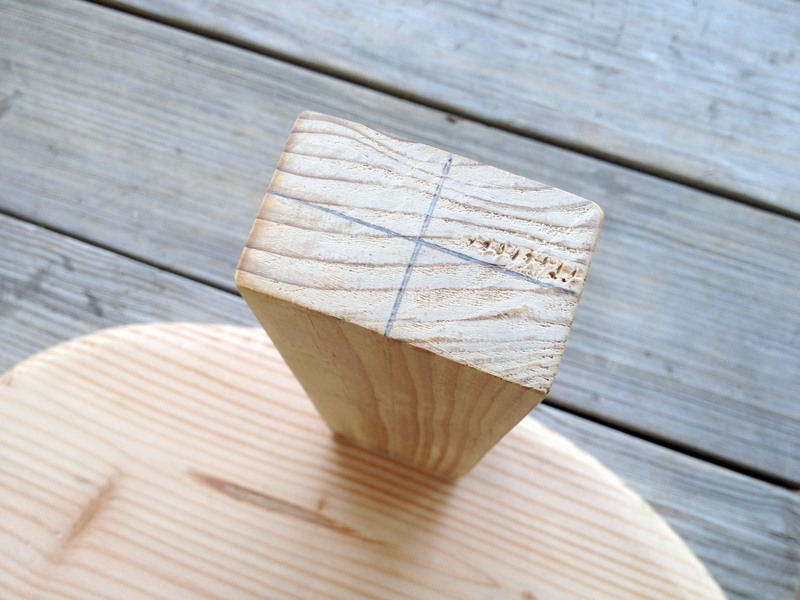 Per the competition’s instructions, the post had to be a 1 ½” square post. 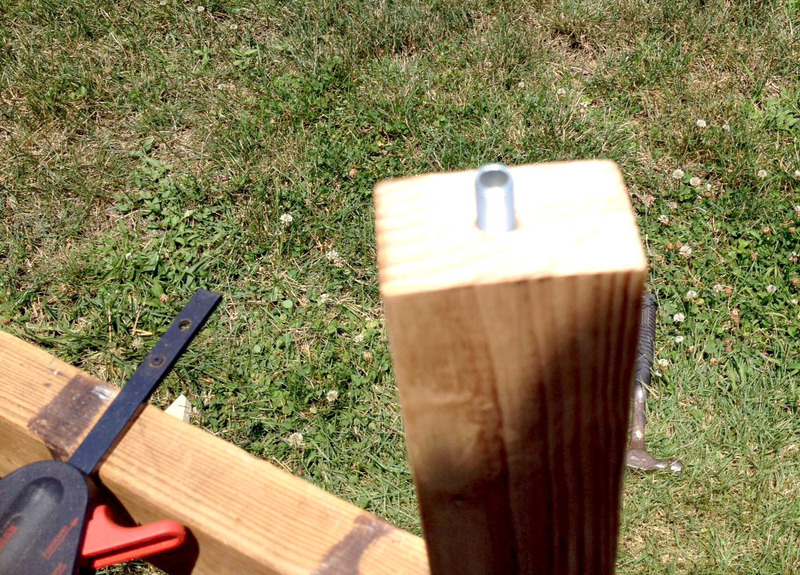 It also had to allow for about 18” of clearance at the bottom to be inserted into a metal stake secured into the ground. 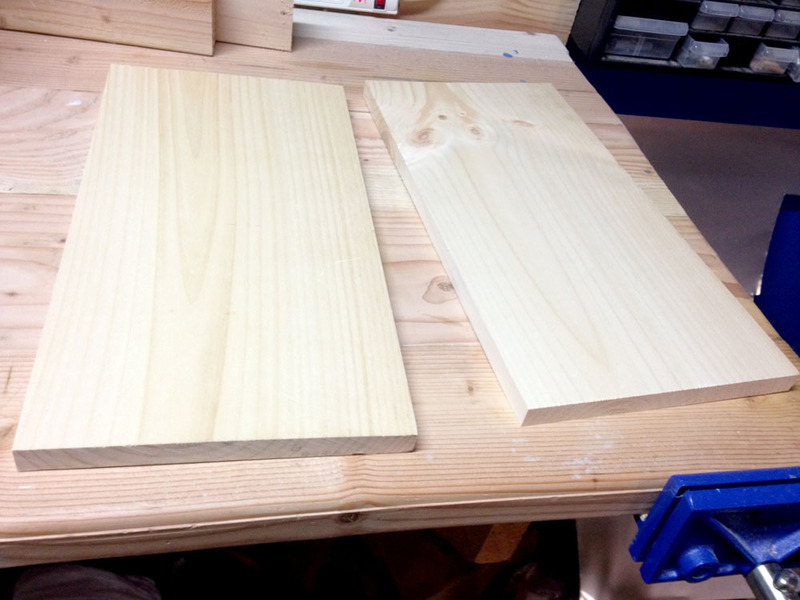 So, I cut the post from a 2×4 piece of wood using my table saw. Next, I reinforced the scarecrow post with some metal bars. 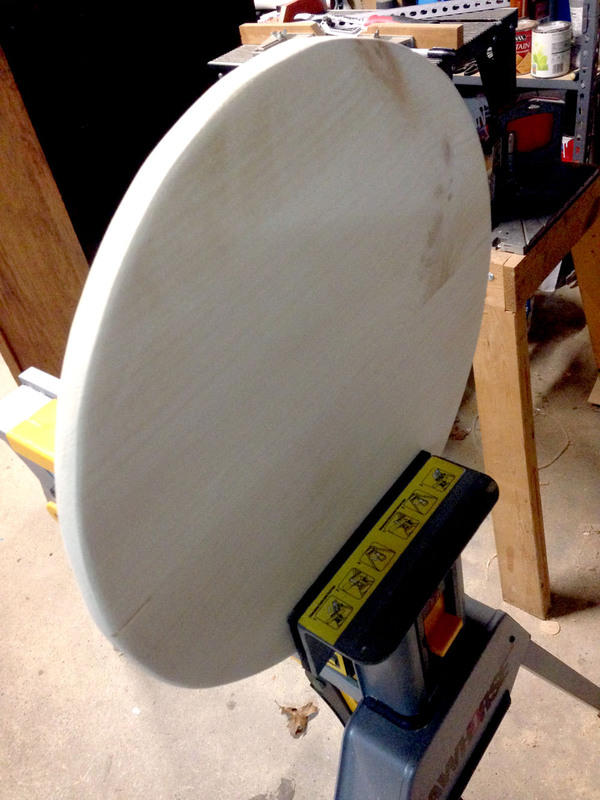 To make the moon, I needed an 18” diameter wooden circle to attach to the post. 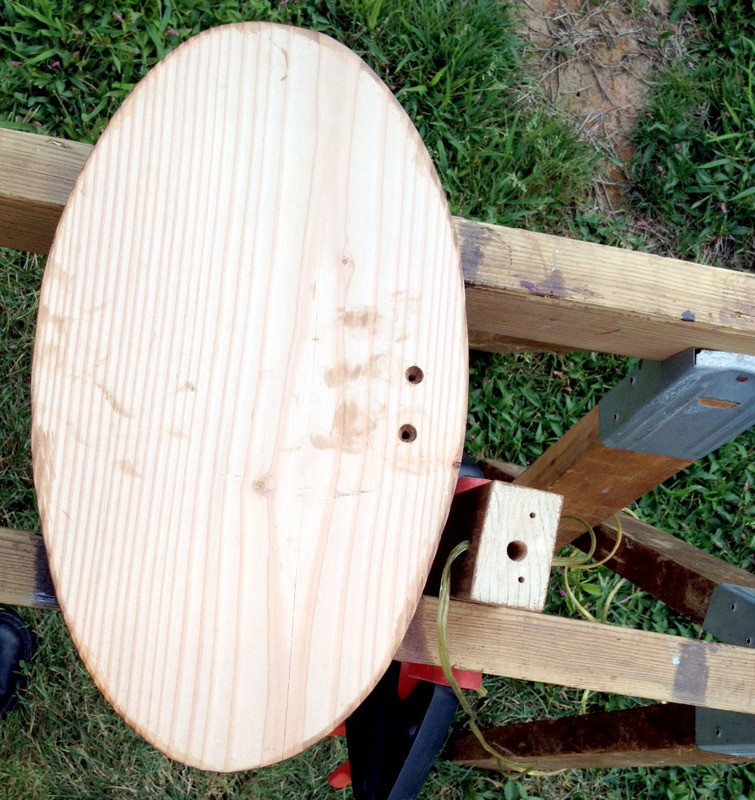 I had a lot of plywood lying around, but I knew that the plywood edges would not fare well in the rain. So I needed to use solid boards. 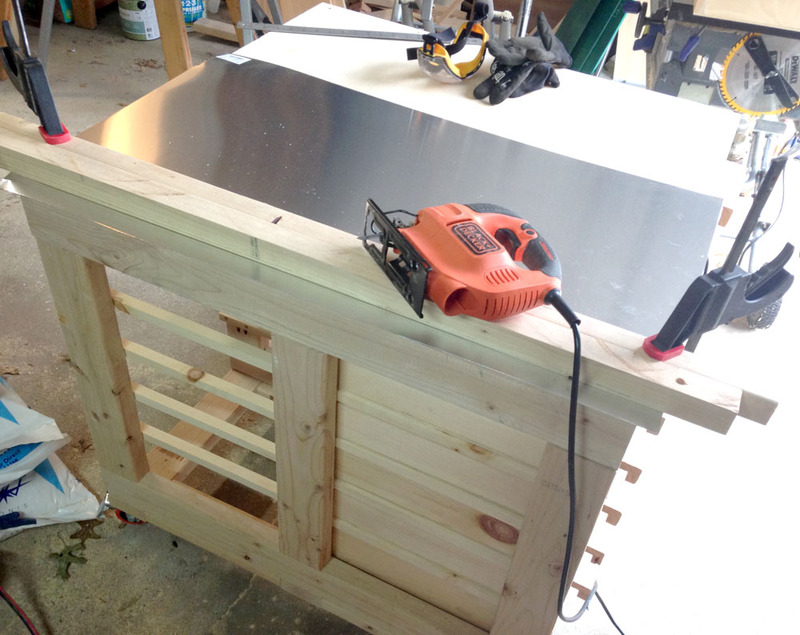 Next, I joined them together with some pocket hole screws (using my Kreg pocket hole jig), forming a single 18”x18” square wood. I tied one end of the wire to the pencil and the other end to the screw. 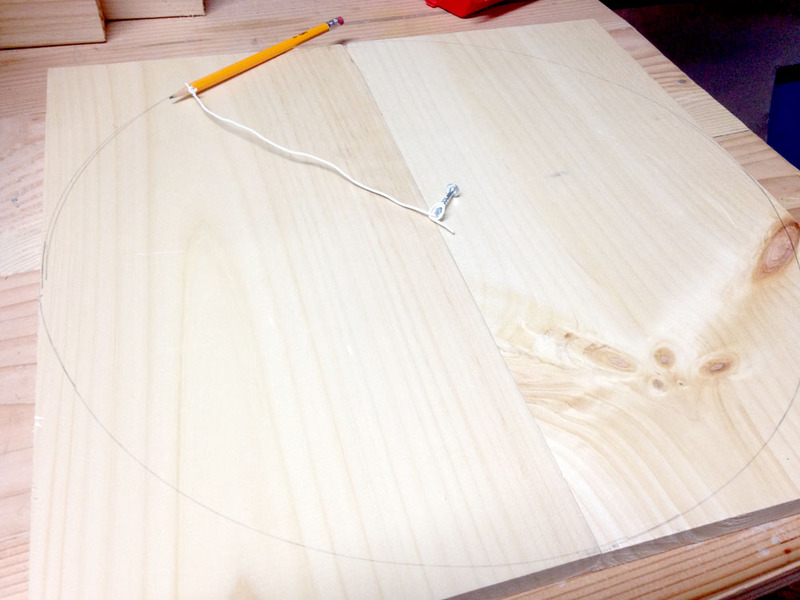 Then while holding the screw down in the middle of the board, I ran the pencil around the board (with full extension of the wire), drawing a nearly perfect circle. Pretty nifty, right? 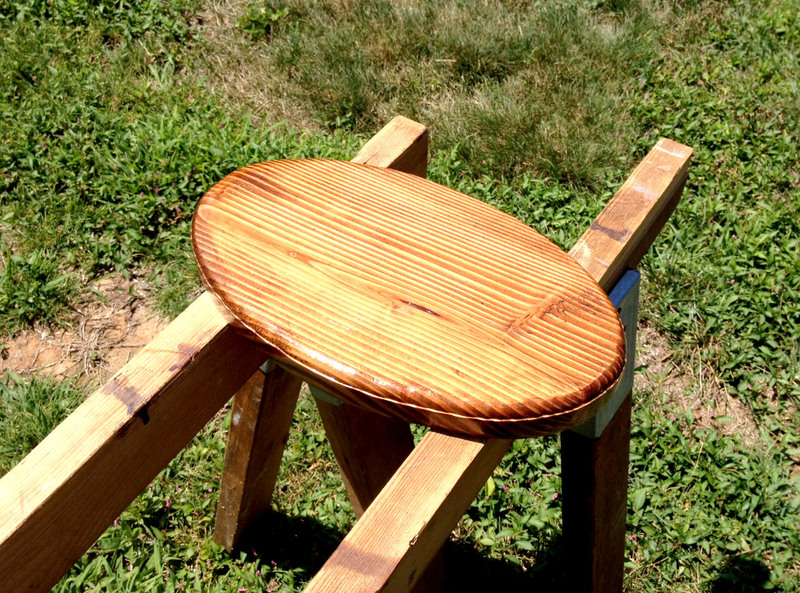 After I sanded, I dusted it off and spray painted it outside with an exterior off-white paint. Finally, I wrapped some LED lights around the moon, and quickly fabricated an adapter to plug into the body. 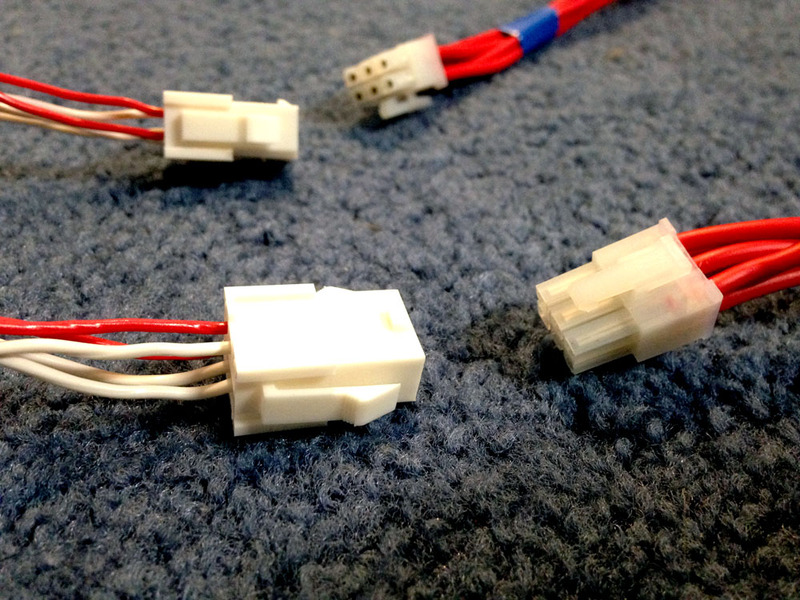 This is similar to the adapters used for plugging in the head. As a side note, the LED lights I used for the moon were self-powered with their own batteries. The Arduino simply turns them off and on. 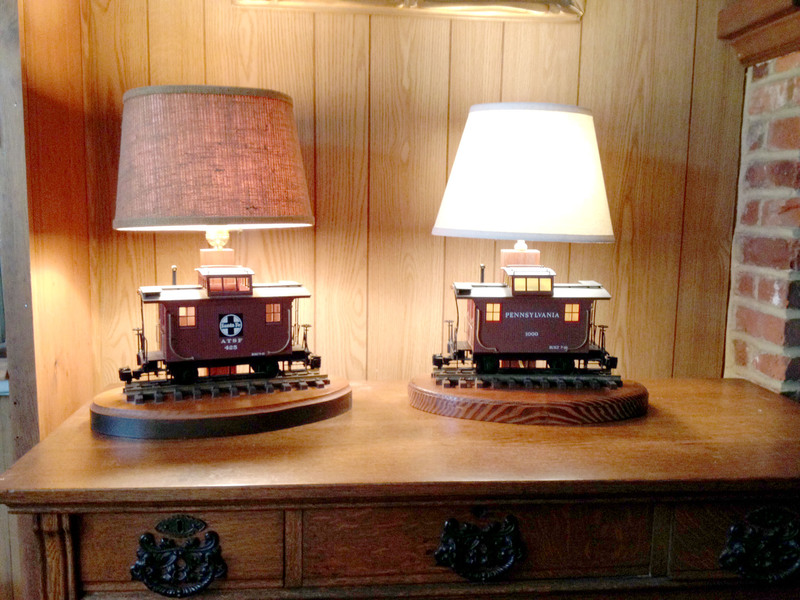 So, I didn’t have to worry about these lights competing with Moo-Bot’s batteries. 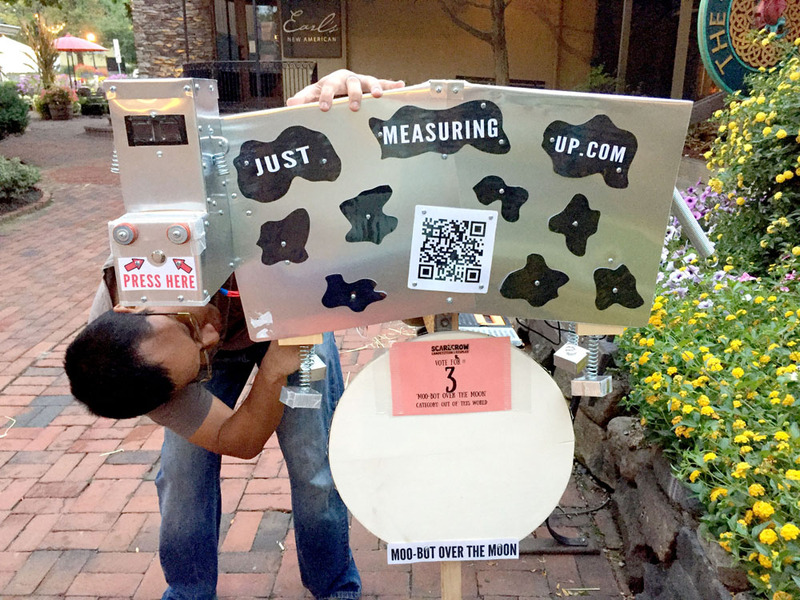 The goal was to make the robot cow interactive. 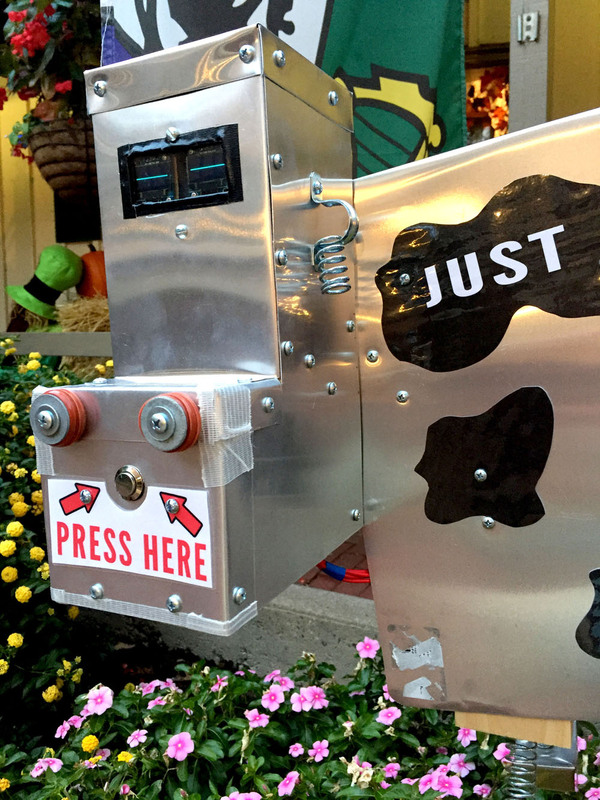 My thought was for Moo-Bot to play a friendly greeting when you pressed the button. After that, I compiled a series of cow-related jokes, such as the classic interrupting cow joke. How did I get the robot to talk? So, I had to include speakers for the sound and I decided to include two LED displays for the eyes. I got a little fancy and had the the moon light up too. Since there would be no electrical outlet to plug into at the competition, our robot cow would also need to be battery powered and be capable of at least 2 months of continuous operation. 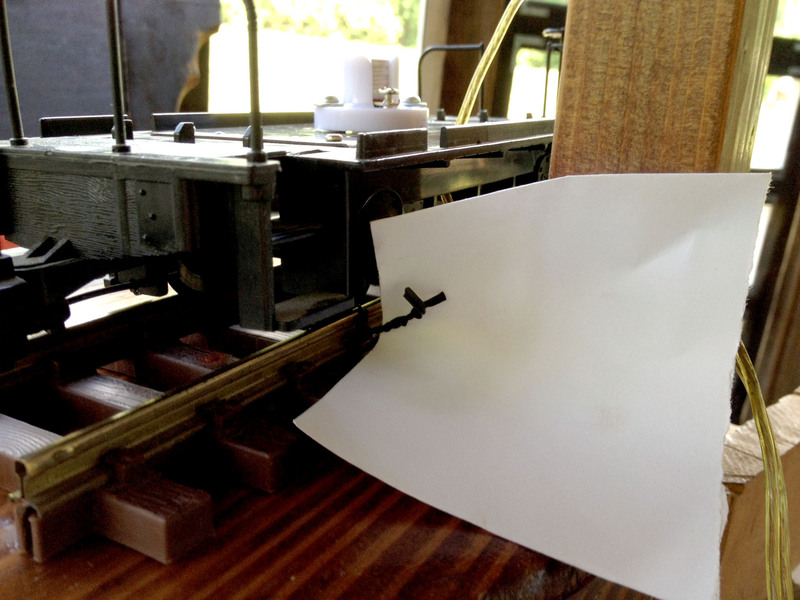 In order to do this, I made Moo-Bot’s brain a programmable Arduino microprocessor. 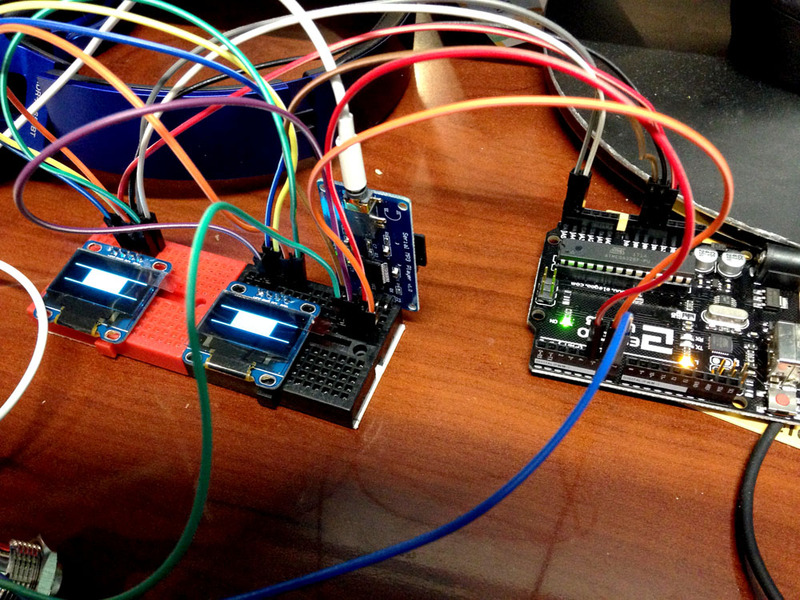 This is just a simple device that made it easy for me to sync electronics up to a script. An Arduino would be perfect because it was really easy to use, very cheap to buy, and extremely conservative on power consumption. 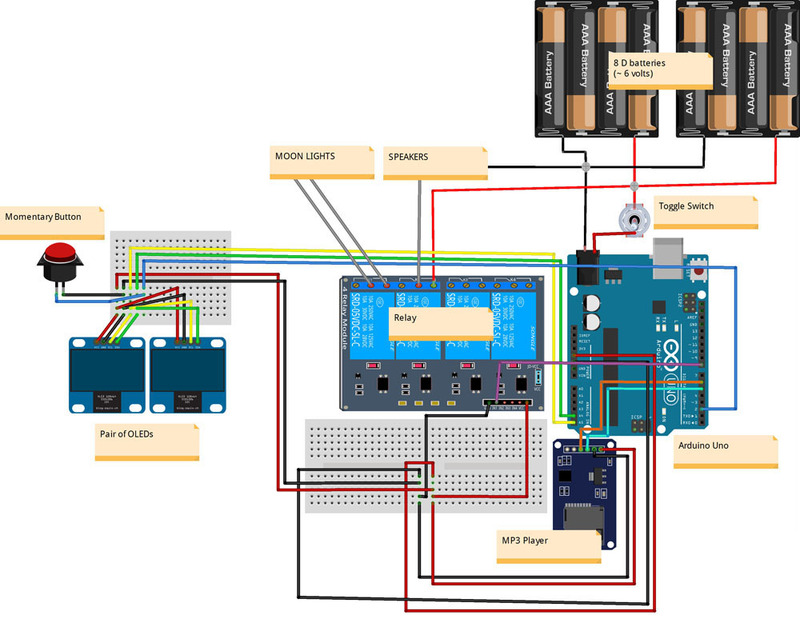 Using the Arduino is simple. You plug it into your computer with a USB cable. 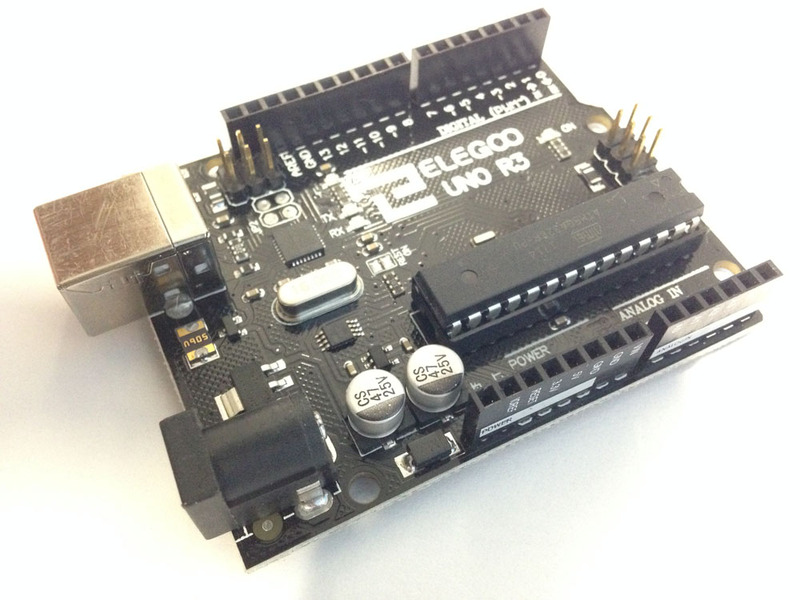 Then, use the free Arduino IDE software to write a program and upload the code to the device. The Arduino has a number of ports you can plug things into. 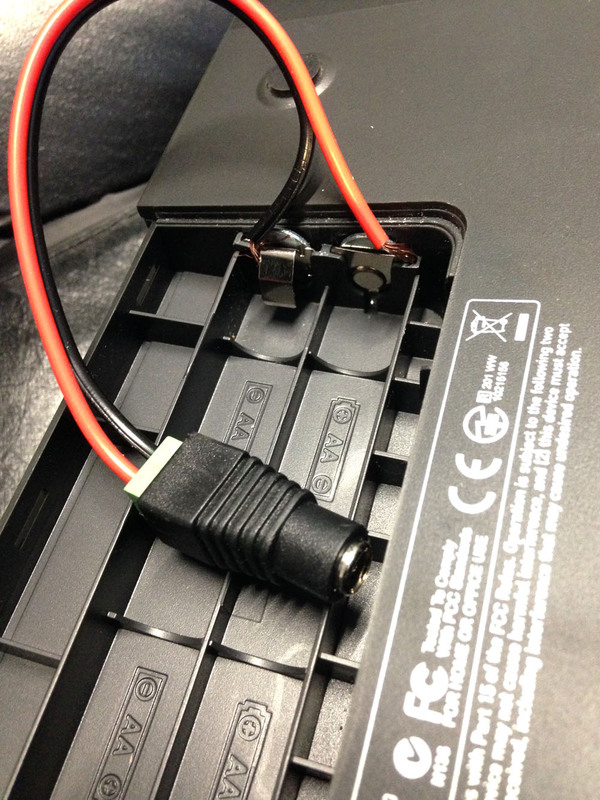 Some carry power to accessories, while others receive and transmit information. 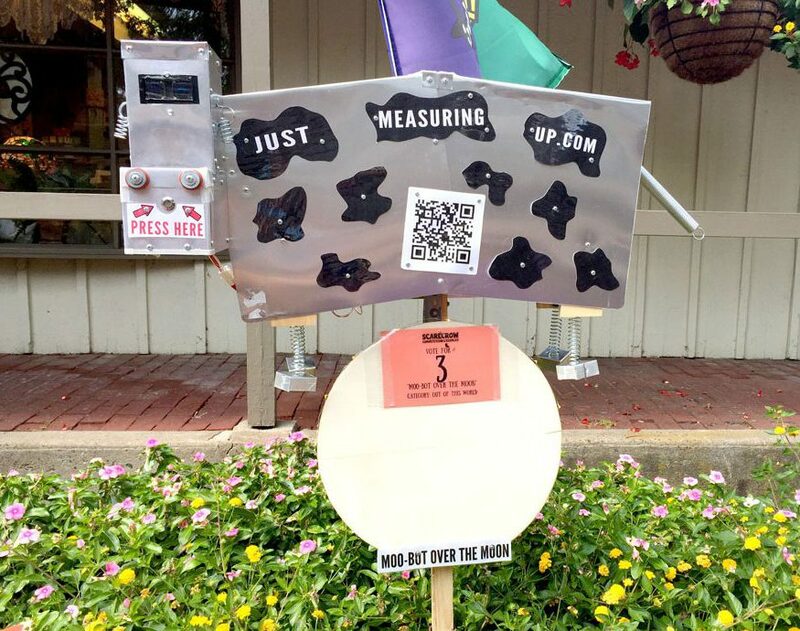 For example, when someone presses the interaction button on our robot cow’s face, that button sends a signal to one of the Arduino’s receive ports. My code detects that signal and sends a message (through a transmit port) to a mini MP3 player, telling it to play some pre-recorded audio. I also programmed the Arduino to go to sleep every 60 seconds of idleness. This was to conserve on battery power. The robot cow only wakes up when the interaction button is pressed, then goes to sleep if no one presses the button again within one minute. 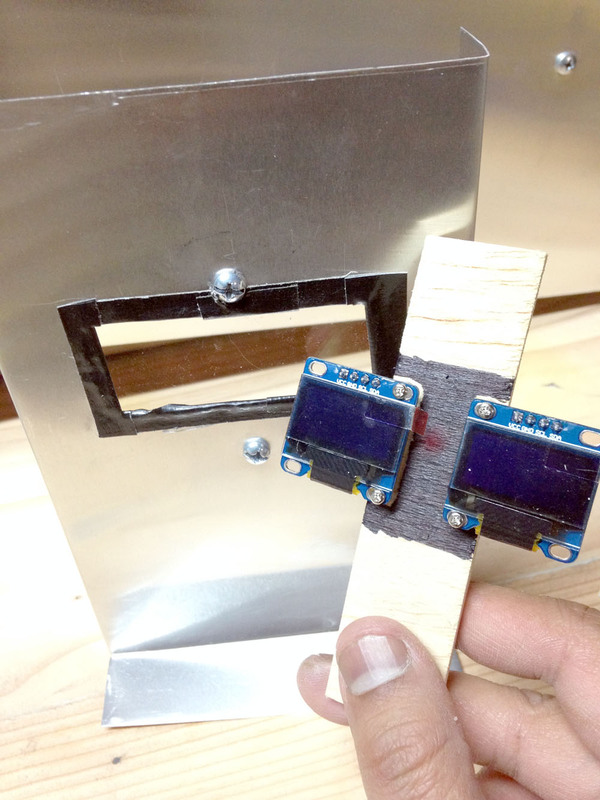 Sleep mode cuts off power to the speakers and lights, and turns off a majority of processing on the Arduino. While in sleep mode, only minimal battery power is used to check when the interaction button is pressed. With the sleep logic in place, and powered by eight D sized batteries, I estimated our robot cow capable of lasting 3-6 months on battery, which was more than enough for the scarecrow competition. The Arduino is on the far right. On the left is a circuit breadboard, where I have a number of accessories plugged in. The breadboard allows you to quickly connect electrical components without the need for soldering. The Arduino also has a limited number of ports physically available, so I use the breadboard to expand those ports. I plugged into the breadboard above is a mini MP3 player (with an external speaker plugged in), and I used two LED displays for the eyes. My favorite part of Moo-Bot are the eyes. The eyes are animated, randomly blink, and open really wide when you press the interaction button. They added a nice touch of character to our robot cow. The day finally came when Moo-Bot had to say goodbye to my garage and join the rest of the scarecrows at the competition. We drove out there anxious to see our designated spot and to set up our robot cow. I quickly got our robot cow setup (thanks to my modular plug and play design) and had him entertaining the crowd. Moo-Bot was a sure blast to work on and everyone misses him here at home. We plan on visiting him regularly to make sure he is still fully operational, and wish him the best of luck in his competition. 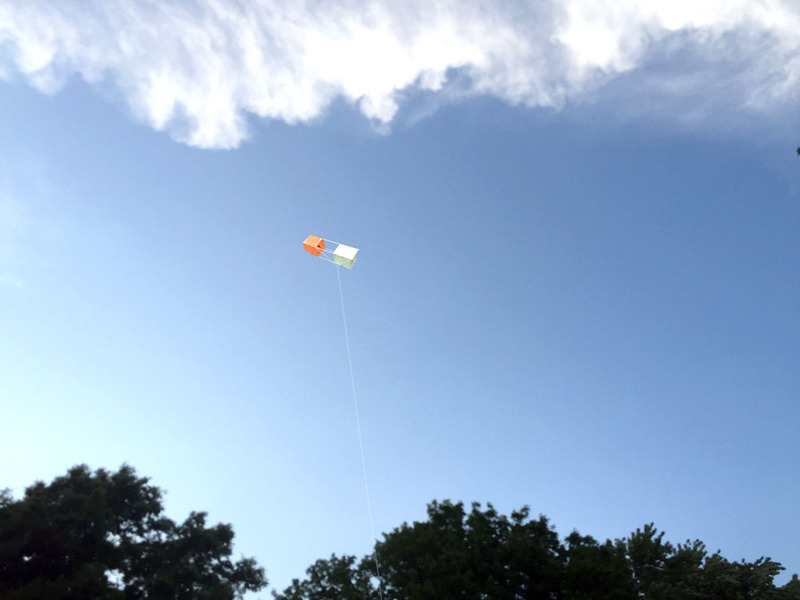 There are few things more thrilling on a windy day than flying a nice kite that you built yourself. But, I’m not talking about ready to go kits that you snap together in 10 minutes. 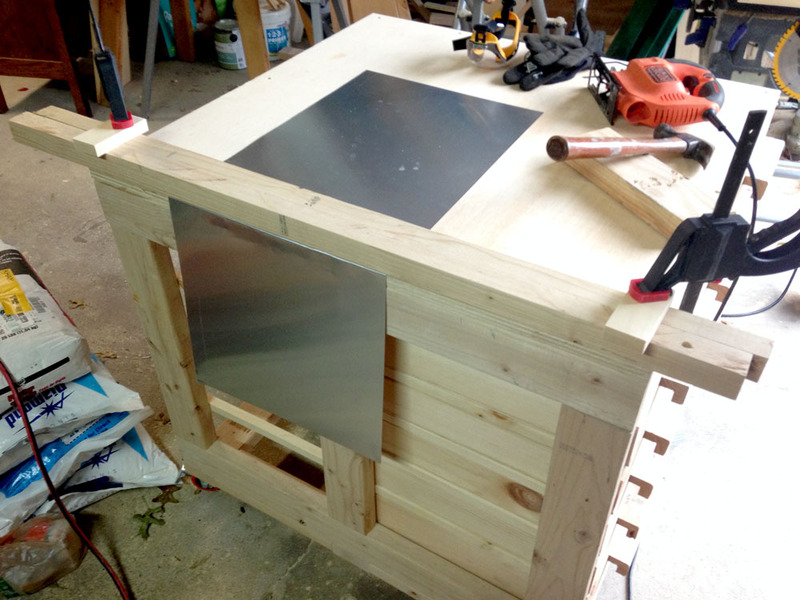 I’m referring to designing and building it yourself from scratch. There’s so much satisfaction from watching your homemade handiwork take flight in the skies. I remember growing up making kites from just fishing line, sticks on the ground and plastic bags. 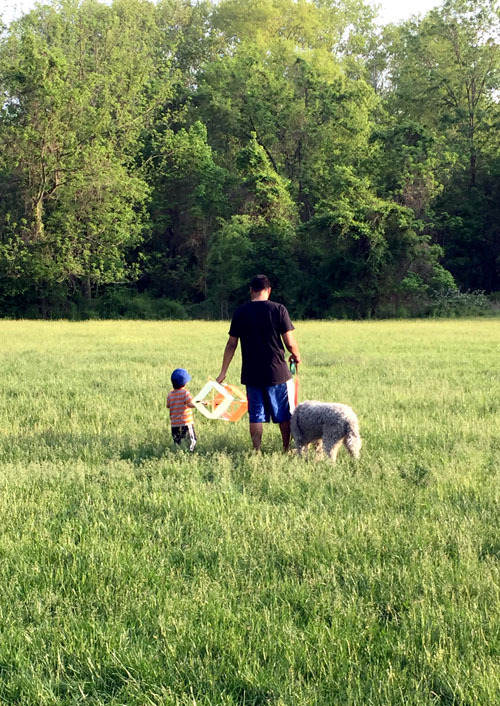 I wanted to relive those days, and build a kite for my son – so that’s exactly what I did 🙂 Here’s how to make a box kite from scratch. This time around, I wanted to go beyond the standard diamond shaped kites that I used to make as a kid. 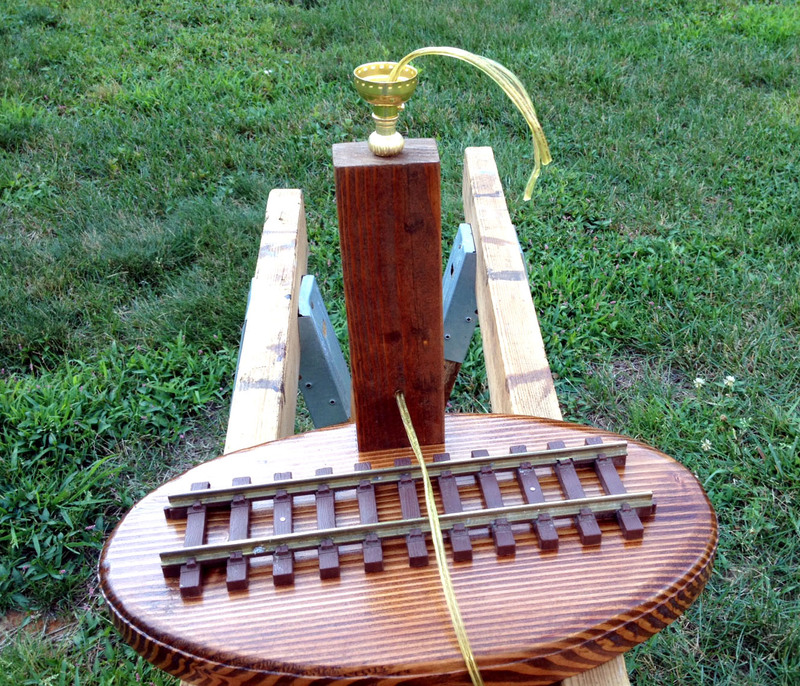 My craftsmanship has significantly improved since I was 10 years old, and I wanted to construct something that was up to my present standards. 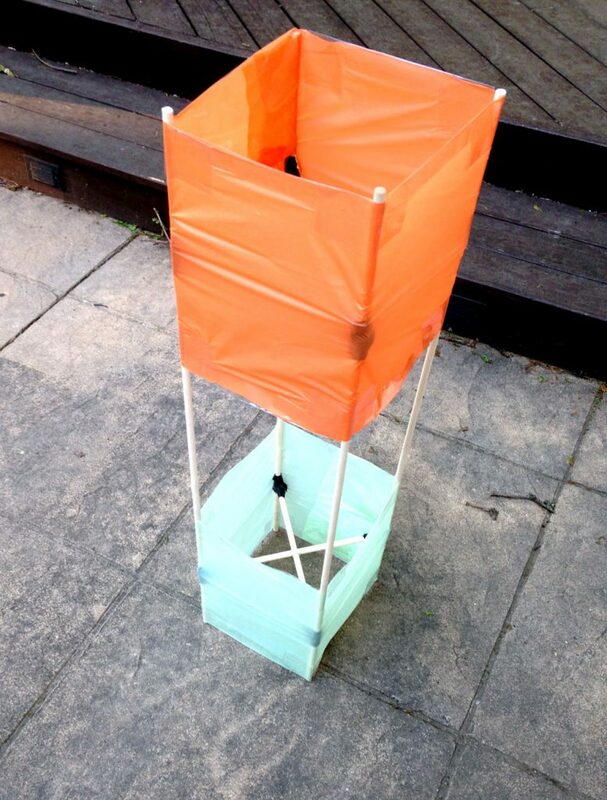 After some kite design research, I settled upon the box kite. 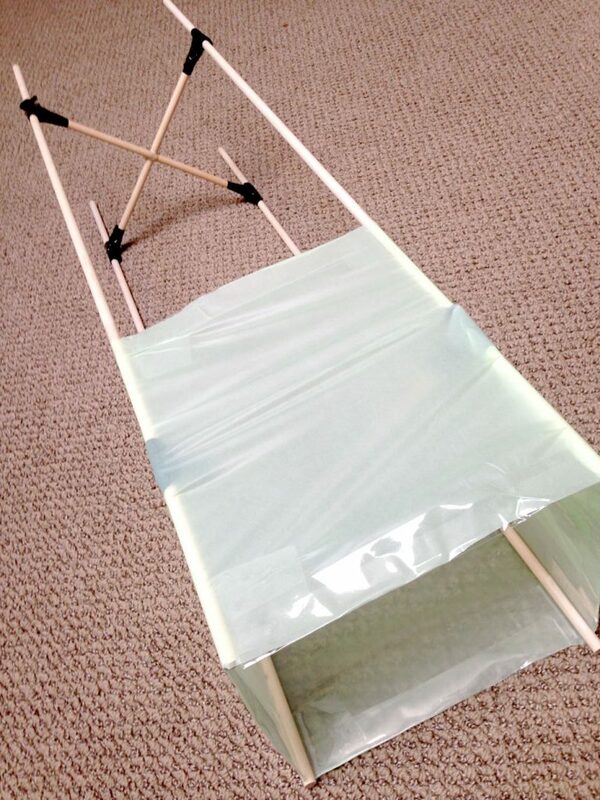 If you are wondering how to make a box kite, it’s an easy project to work on. It’s an elongated box frame with fabric wrapped on two ends, leaving the middle exposed. 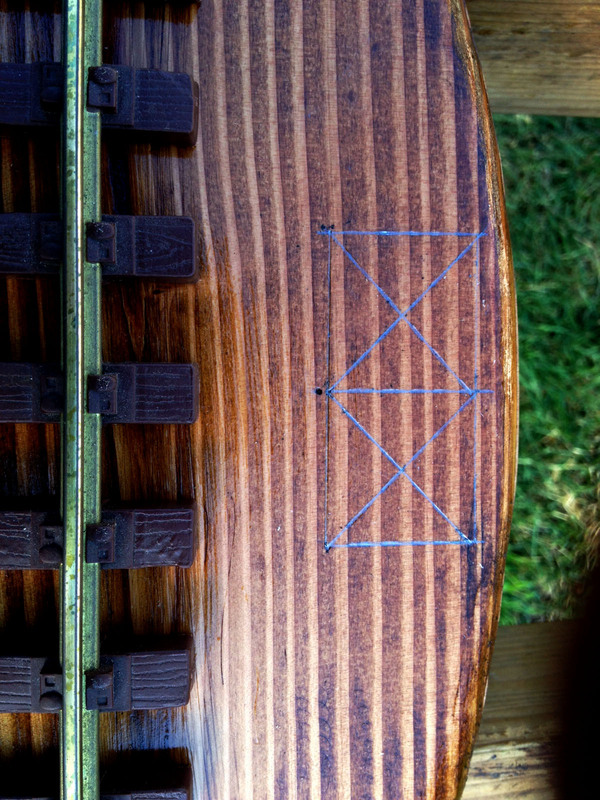 It also has two attached strings (with specific offsets to give the kite a better aerodynamic tilt during flight) which converge to a single string to control. 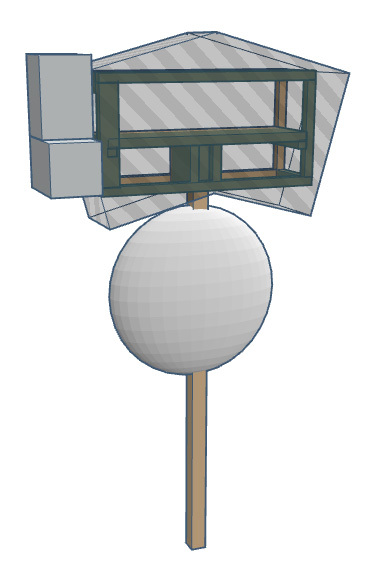 Here is a TinkerCad sketch I made of my proposed design of how to make a box kite. I love using TinkerCad because it gives great 3D visuals of my DIY projects. It just so happens that a few days before my birthday, Eileen was on the phone with one of her sisters and mentioned that we were planning to make a kite. Here’s the list of materials we used. A few were sent via Amazon but most are easily found around the house. 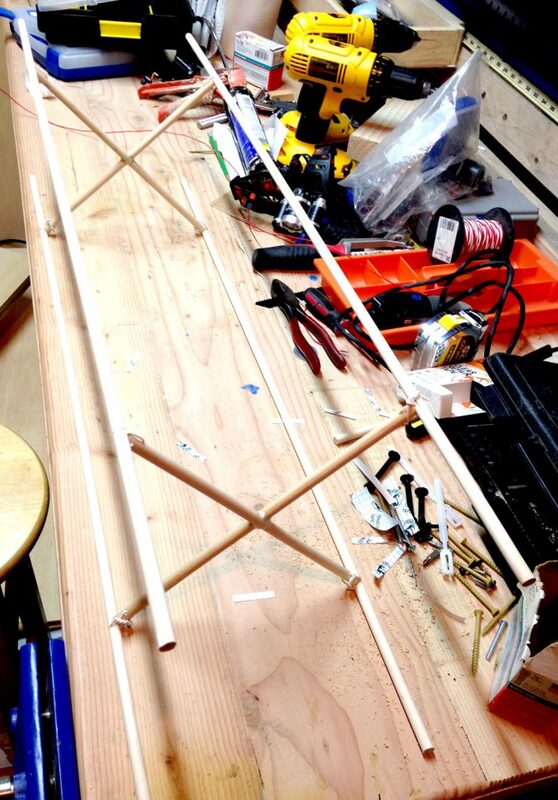 My kite is made of 4 long 36” dowels, and 4 short 12” dowels. 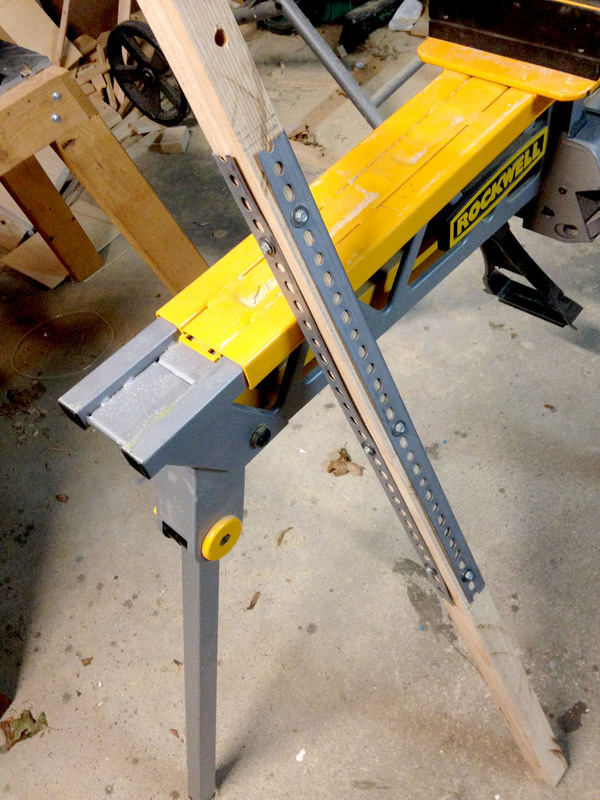 That means I can just take my 48” dowels and cut them at the 12” mark, and I’m set. Add some string to that and I could sell it as a kit online! 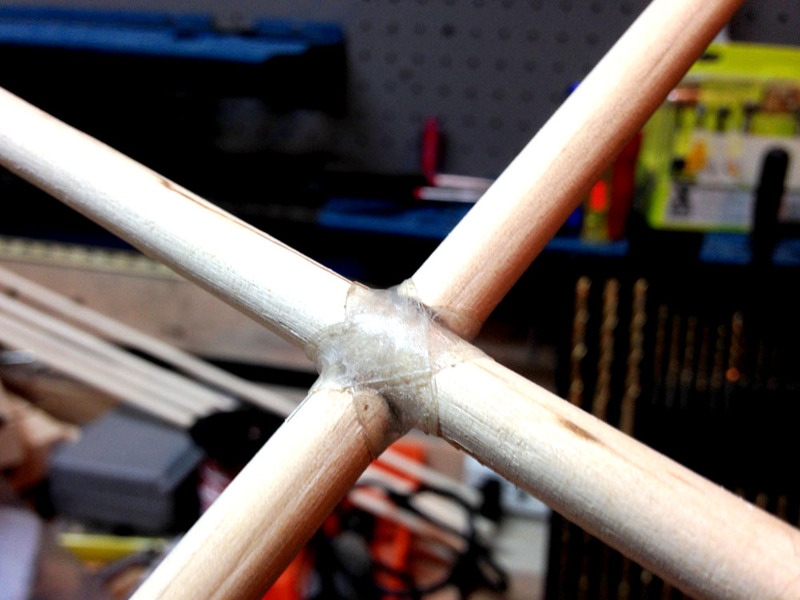 To make the crosses, I first marked the center points of each 12” dowel. 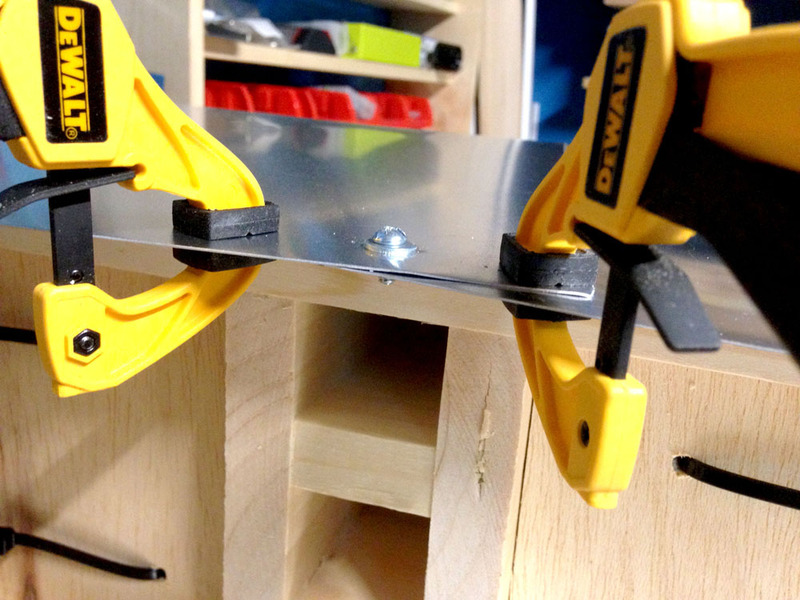 Then I notched out partial holes using my Dremel. 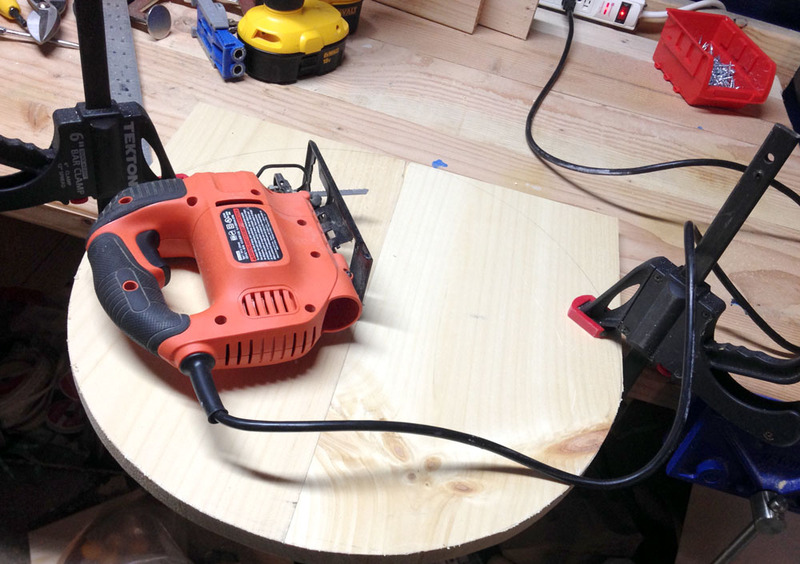 If you don’t have a Dremel, you can use a hack saw. 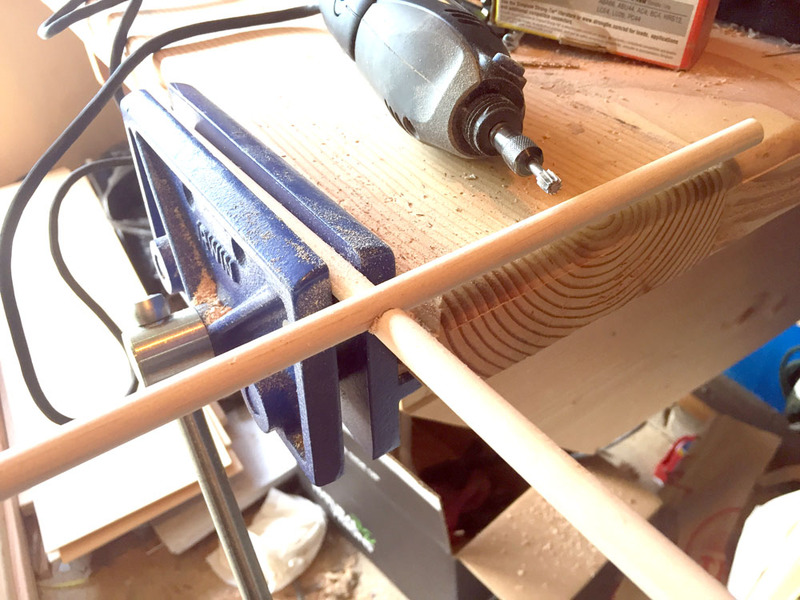 The notches allowed two intersecting dowels to form a lap joint for a rigid connection. The ends of these crosses were going to be in contact with the long 36” dowels. 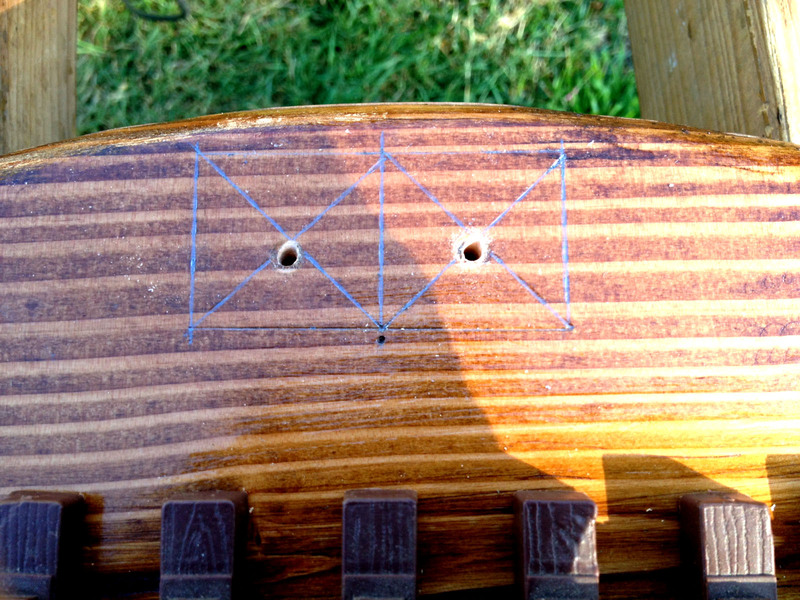 To make for a better fit, I opted to carve the ends of the crosses slightly with a concave cut. 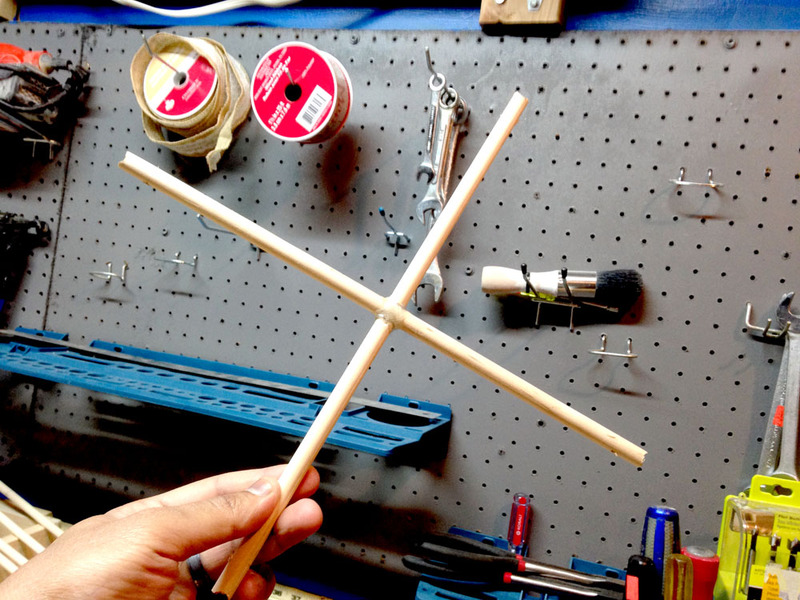 This would allow the crosses to rest nicely against the long dowels. 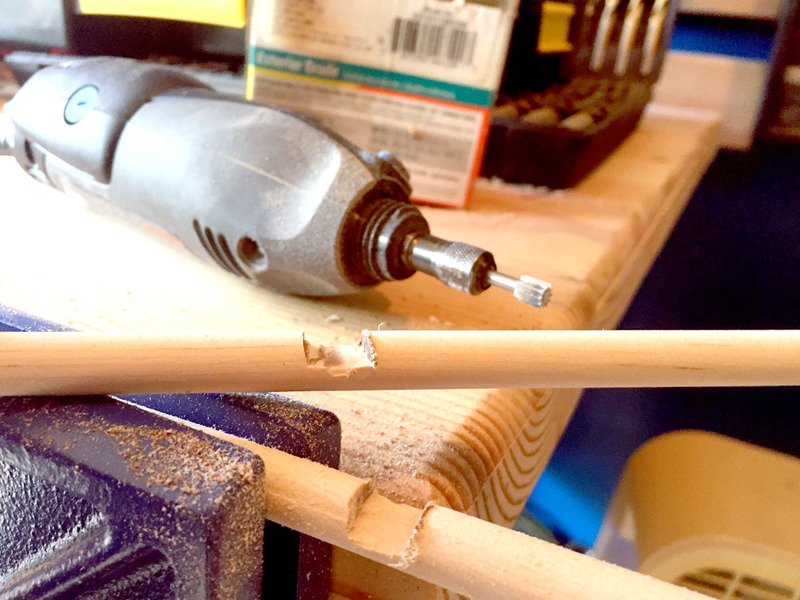 To make a strong connection between the crosses and the long dowels, I used wire that I inserted into small holes drilled into the dowels. 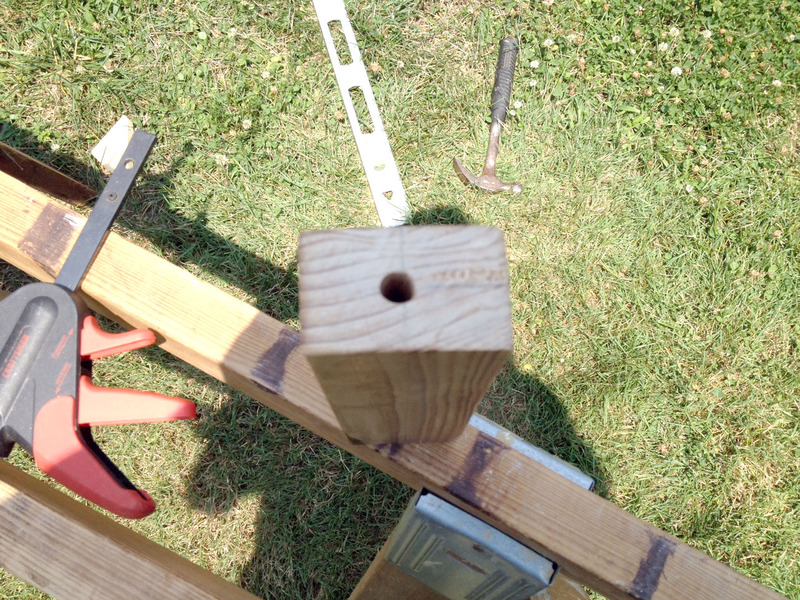 The lap joints I made for the crosses were just the beginning of the strengthening process I used for maximum durability. First, I put a dab of construction adhesive in each joint. 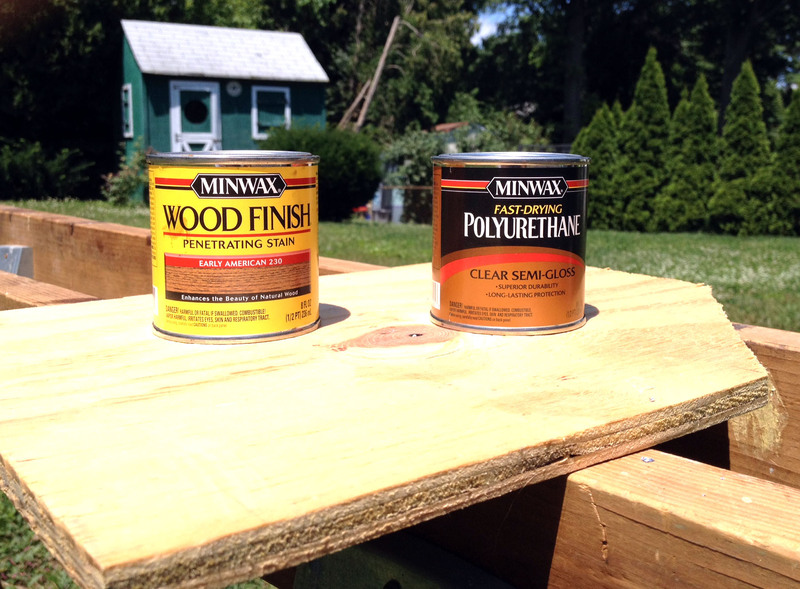 Wood glue was another option, but in my experience, wood glue tends to be a lot more runnier. Construction adhesive is thicker and starts to give some tackiness almost immediately. 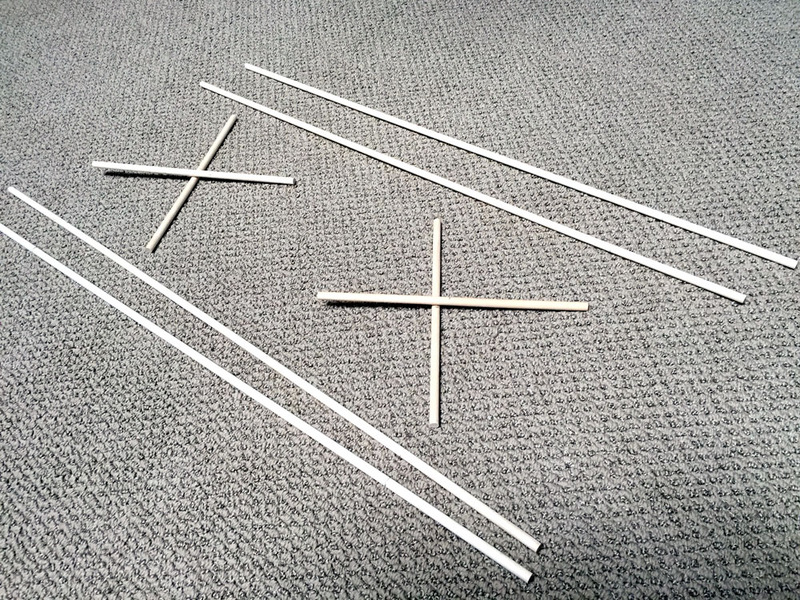 Now it was time to start connecting the crosses to the long wooden dowels using wire and the holes I drilled earlier. 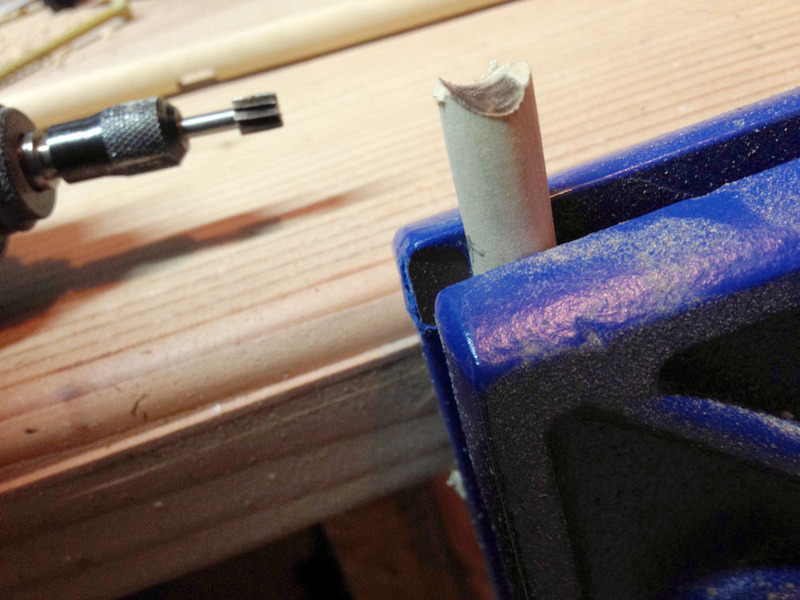 The wire ran through a hole in the cross, and a hole in the 36” dowel. Then it was twist-tied. 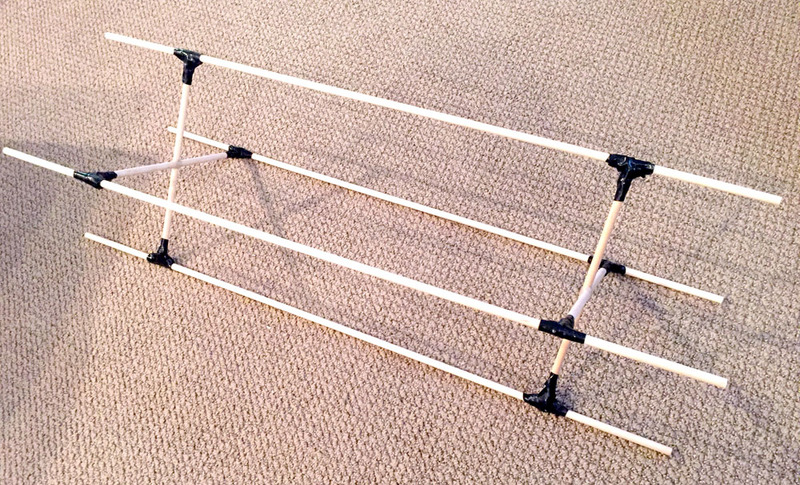 The kite structure was now complete and very rigid. It should have no problems standing up to strong wind forces (and inevitable crashes). Next up was wrapping the ends with fabric. You can be very liberal with what type of fabric you use. Some people use garbage bags. Others use construction paper. 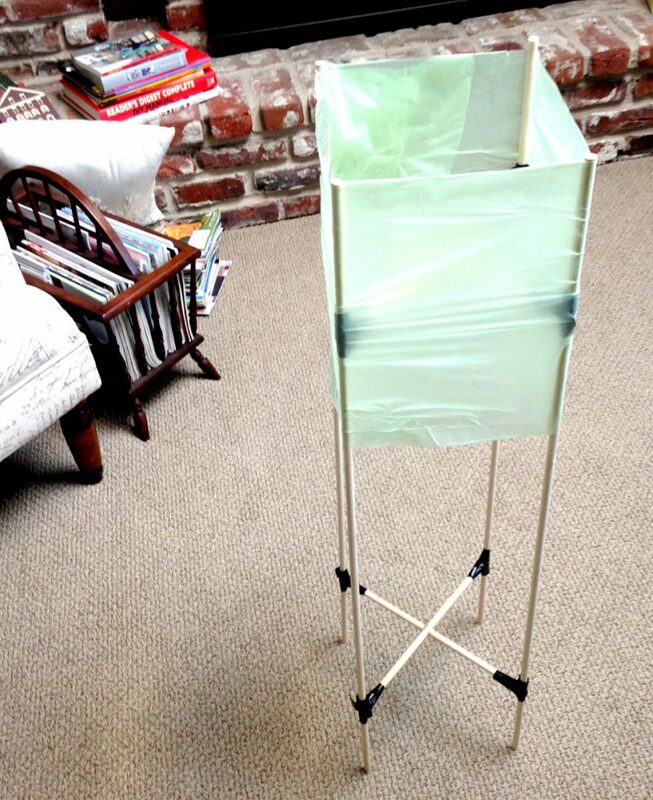 I used plastic tablecloths that my sister-in-law sent for our kite-making. You can pick these tablecloths up at the dollar store too. I also made sure the fabric was wrapped nice and tight around the structure. 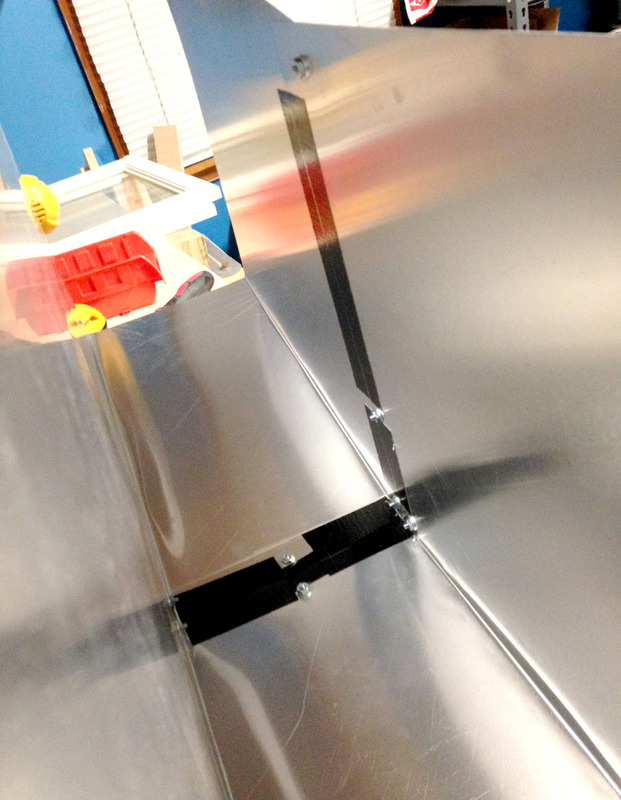 Then, I used a lot of shipping tape to help secure and reinforce the fabric. 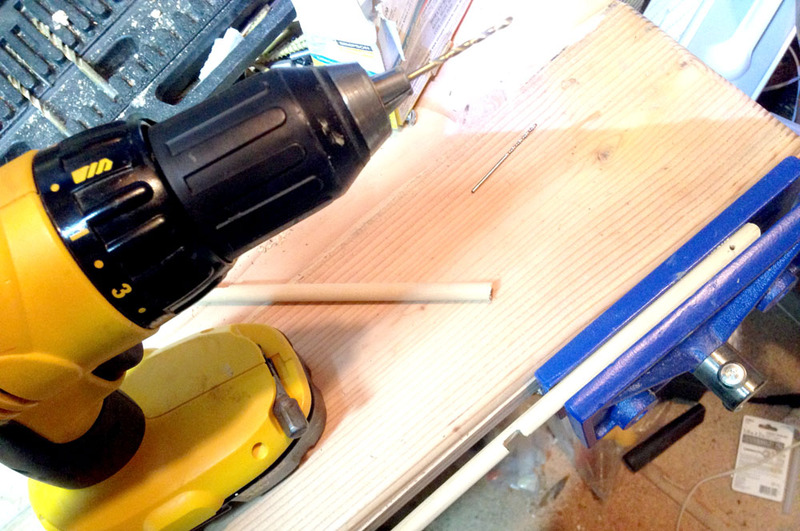 I applied tape inside to help keep the fabric attached to the dowels. I also used tape where the fabric overlapped itself and on all the exposed edges of the fabric. This last step with taping the edges was especially important to prevent the fabric from ripping as wind gushed through the structure. It would also help during landings to prevent tearing. 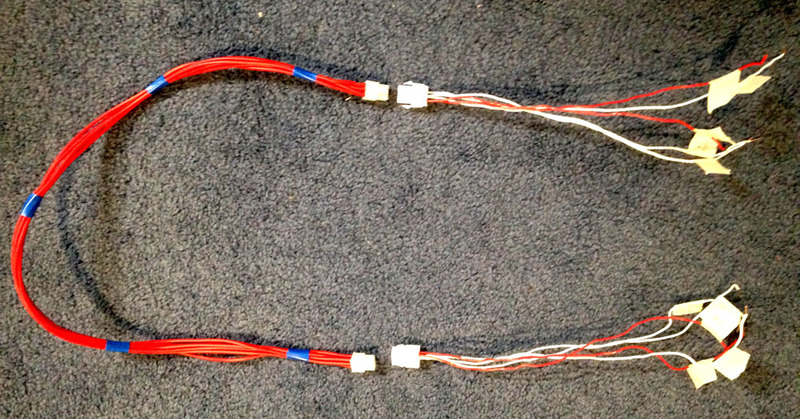 Now to make the string connections. 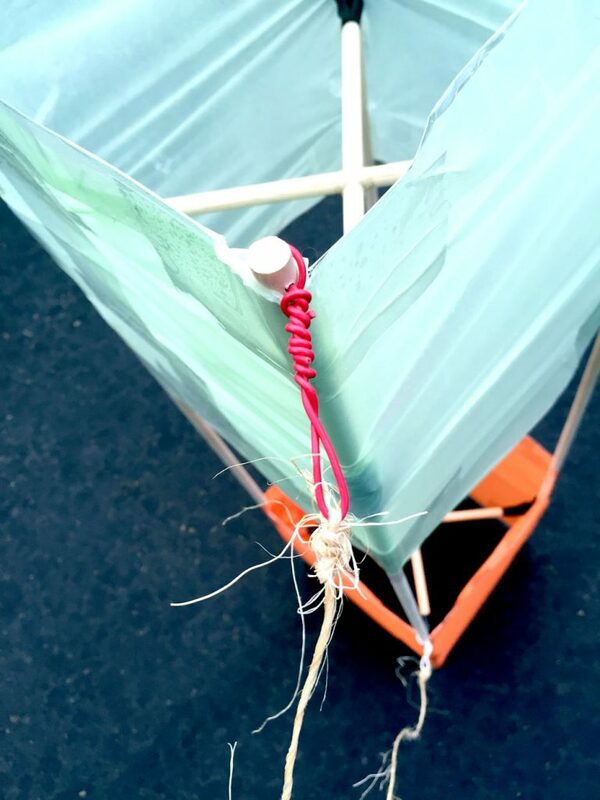 String attaches to the top of the kite, and then again about ¾ down the kite. 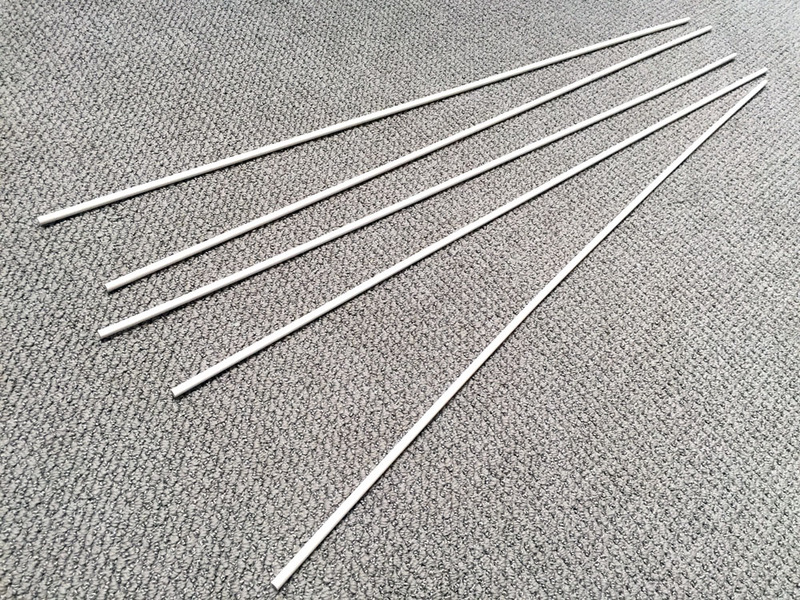 Then a final string connects to this one, and will be used to control the kite from the ground. 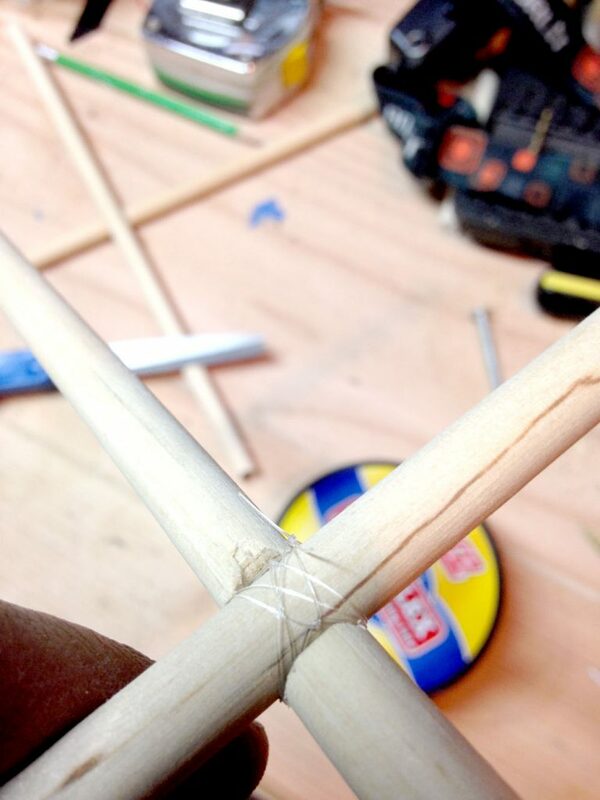 To attach string securely to the kite, I once again drilled some small holes and used more wire. 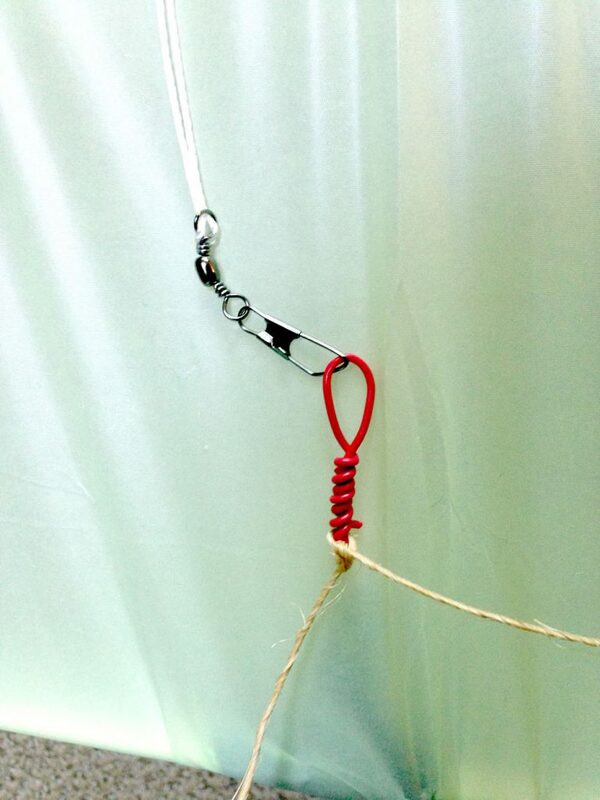 The wires made a hook for the string to tie onto and not slide around. That fancy metal clip connects to a string wrapped around a spool. 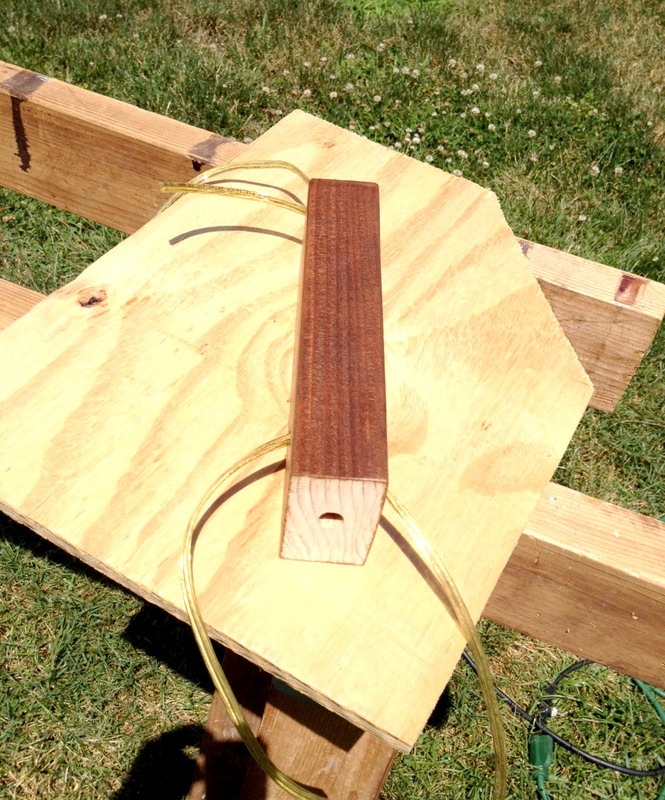 The spool will be held by the kite flyer and reeled in and out as extra length is needed. This nice kite flying spool came with a cool lightweight clip to quickly attach/detach to kites. 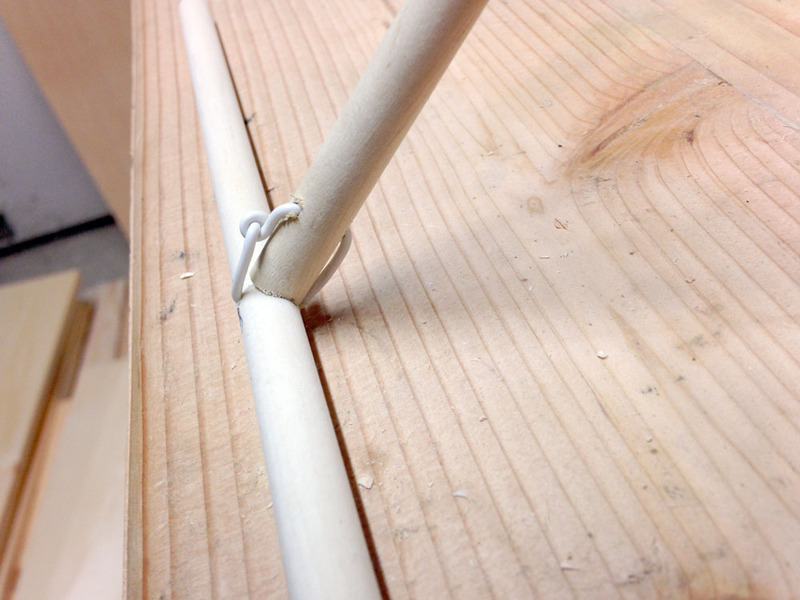 If you aren’t so lucky, you can just wrap a long string around a stick and use that instead. The kite was now complete! We went to the park for a nice open area and really lucked out with a windy day! 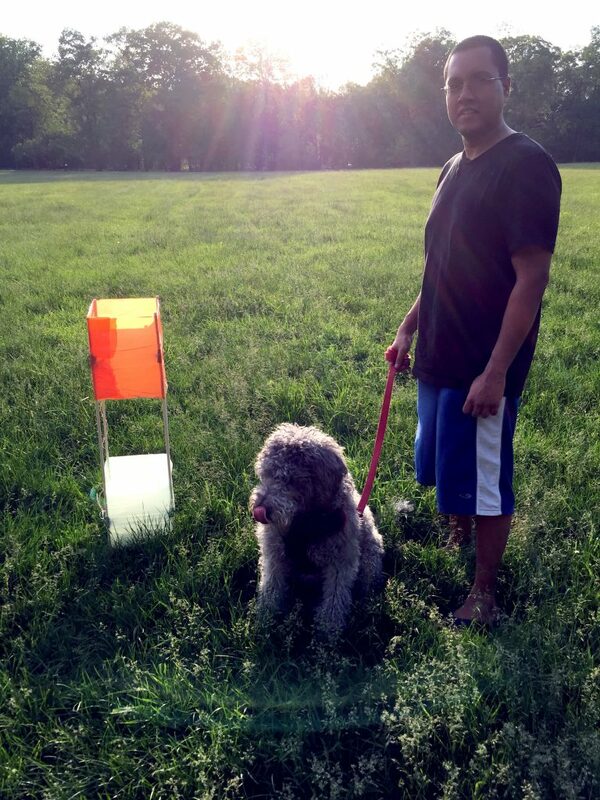 Zeus had been wondering what we were working on and was overjoyed for his trip to the park. He got to run along with the box kite and enjoy a windy evening outside. 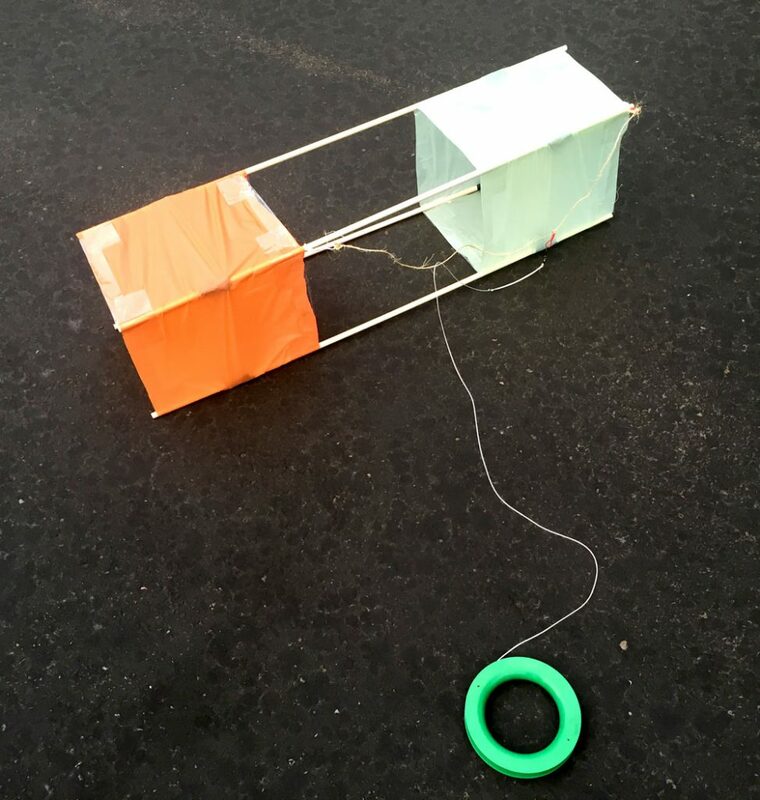 The homemade box kite was a really fun project to work on. It only took a few hours, and didn’t cost much to make. 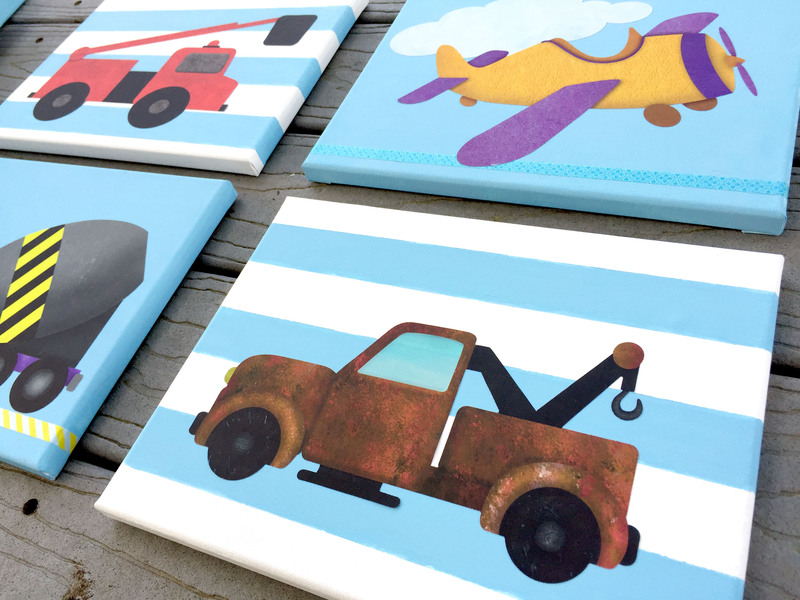 I can’t wait until my son’s old enough to create his own designs with me. His interest is already peaked – we are definitely a family of engineers. 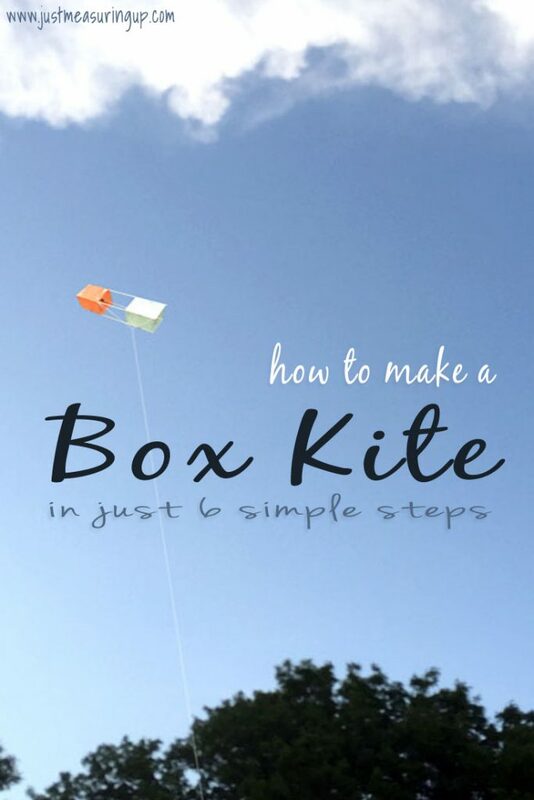 If you have been wondering how to make a box kite, these six easy steps will have your kite ready in no time. All you’ll need then is a windy day. 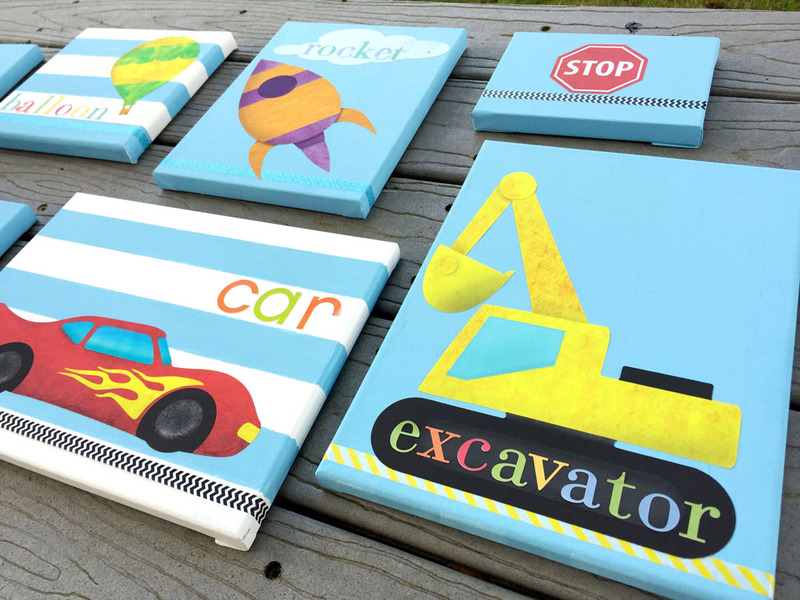 It’s a great family project, kids activity, or couples activity – and who doesn’t love a great DIY project?! Over here, we a little Amazon-Prime-obsessed. Our mudroom always has Amazon boxes in it, waiting to emptied or waiting to be recycled. I mean, when you have two little kids in diapers with nap times that span the whole day, there’s no easier way to shop for what you need. 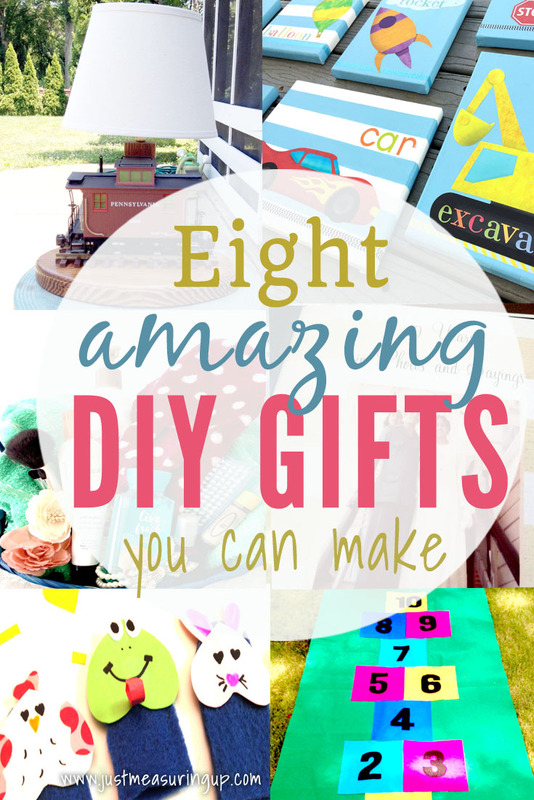 Not only that, we’ve gotten some pretty cool tools and DIY-related things on Amazon. So, Prime Day is like our birthday. 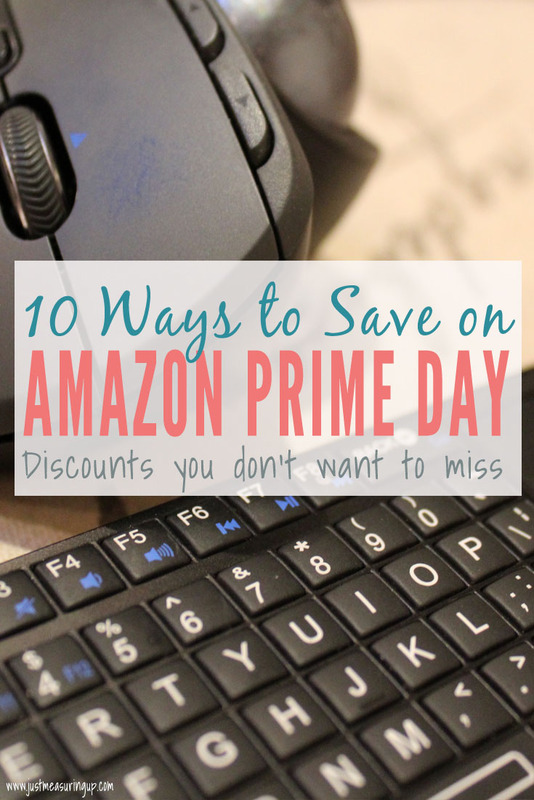 And what better way to celebrate than to share with you 10 ways to save on Amazon Prime Day. Amazon Prime Day starts on July 16th at 3pm. Mark your calendar! Think about things you need to buy now or in the future, so you can get the most out of the discounts. 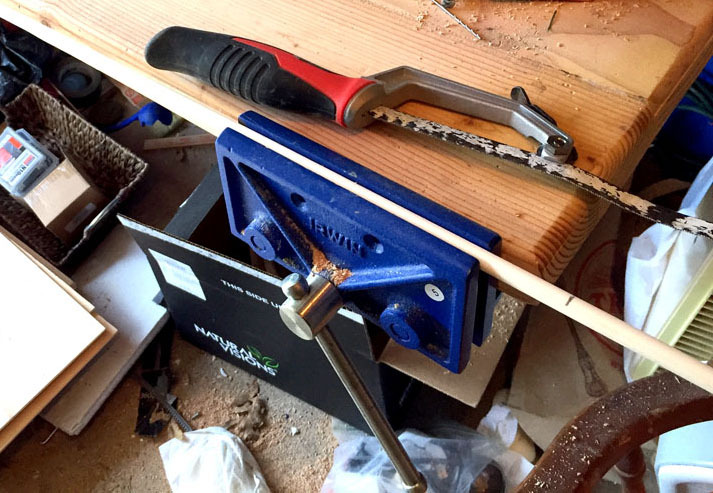 Is there a tool you’ve had your eye on? Are their Christmas present ideas that could help you with early shopping? Think about how you can best benefit from the deals. If you aren’t a Prime Member, you can sign up for a 30 day FREE trial. You can’t beat that! If you’ve never downloaded the Amazon app before (and you are a prime member), you’ll get a one-time $10 discount off your purchase. If you’ve already downloaded the Amazon app, you won’t qualify for the above discount. However, there are more ways to save. For example, if you use the Camera Search within the app, you’ll get a $5 discount. If you download the Amazon app, you can get sneak peeks on the deals and set up alerts ahead of time. If you’re a Prime member and you install Amazon Assistant (to get desktop notifications on deals), you’ll get $5 off your purchase of $25. Once Prime Day starts, you’ll see tons of deals – some will be advertised before they start. You can click “watch” and then you’ll get notified right before the deal goes live. Not only will Whole Foods be offering some exclusive deals, but Prime members are getting 10% off their entire purchase at Whole Foods on Amazon Prime Day. Whoa! Other big stores like Home Depot or Lowes tend to also run sales on Prime Day, so don’t forget to check out what they have to offer too, especially if you’re looking for a particular item. There are definitely some awesome ways to save this year, so definitely try and take advantage of them. I know that we will be! 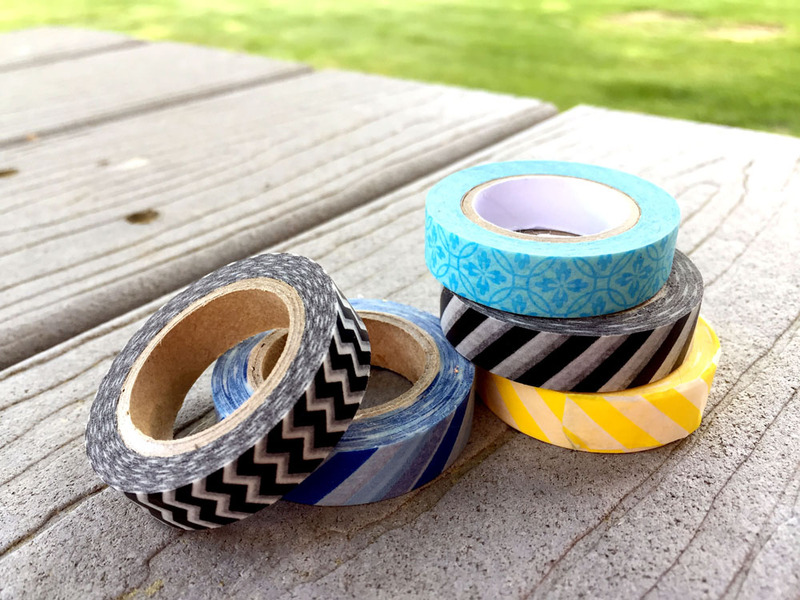 And, come back to our blog on Amazon Prime Day because we will be sharing the best DIY deals with you! Click here for even more Prime Day shopping tips.